I saw this film in the cinema with my Dad on a free double pass that I won as a teenager. 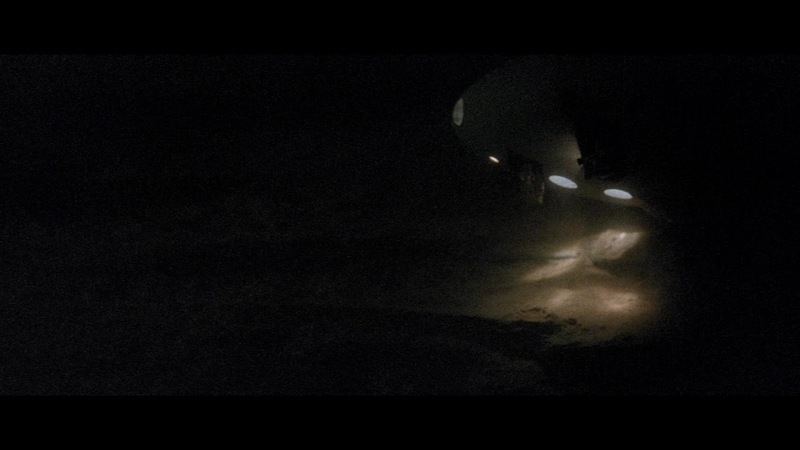 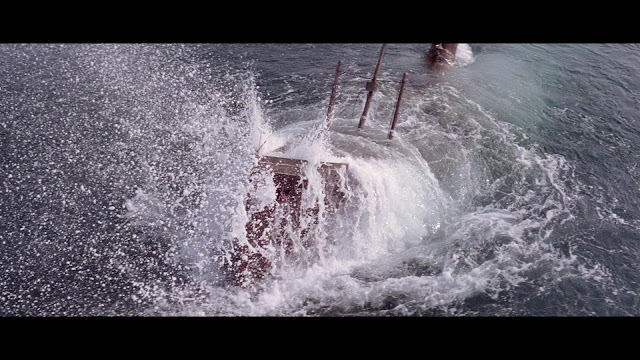 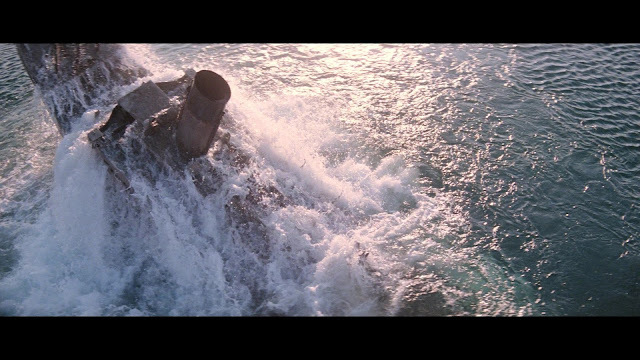 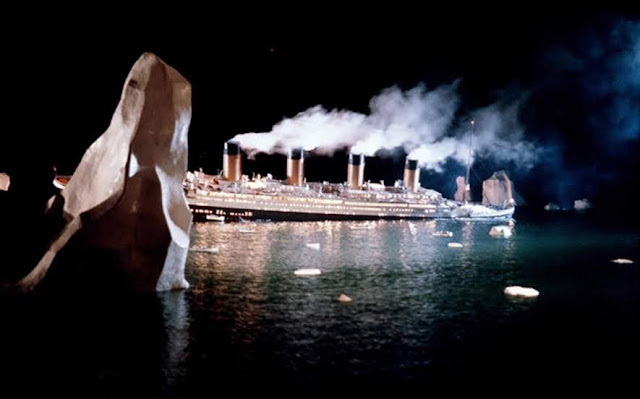 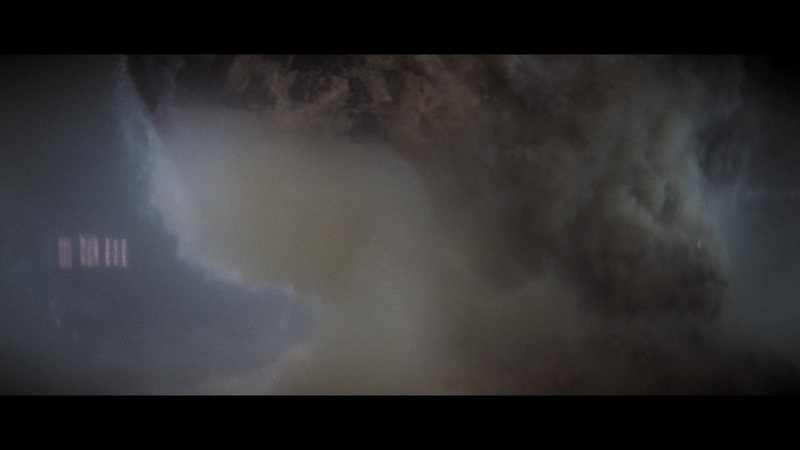 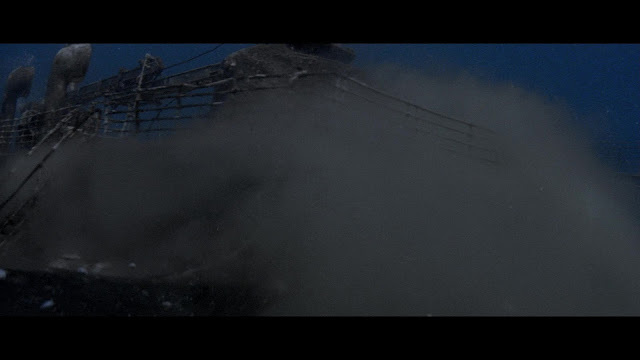 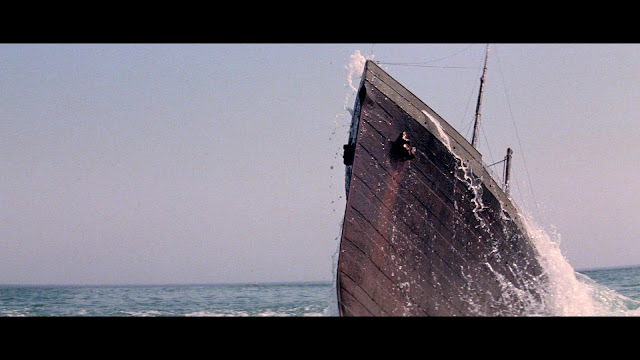 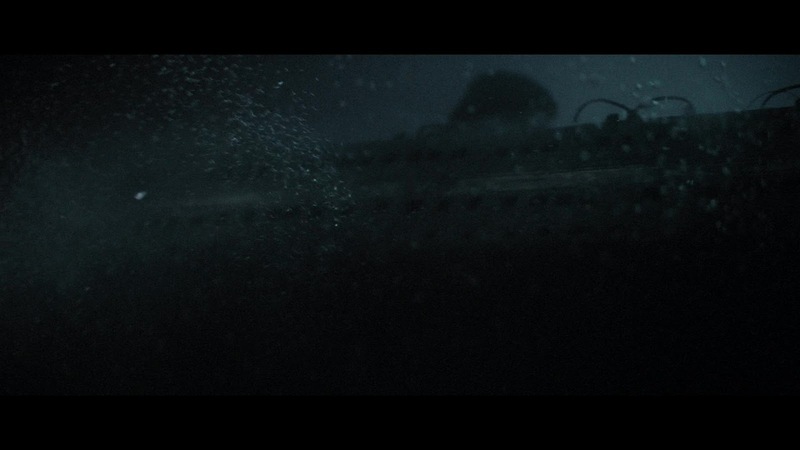 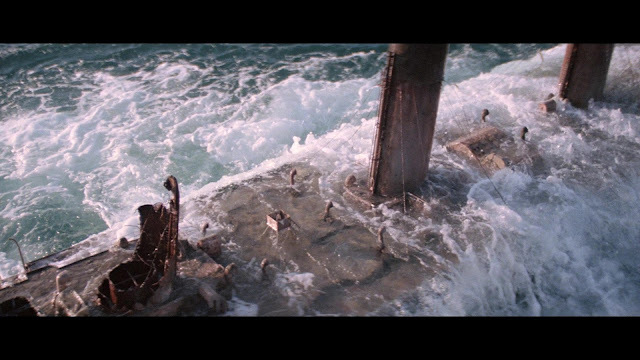 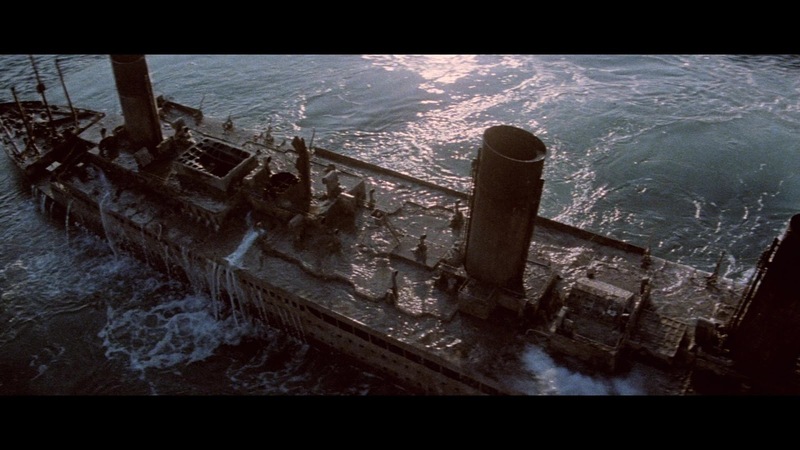 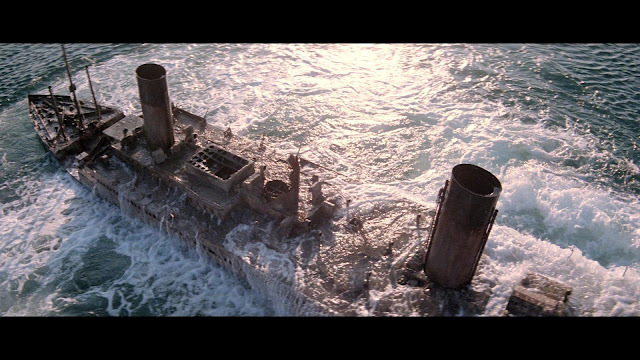 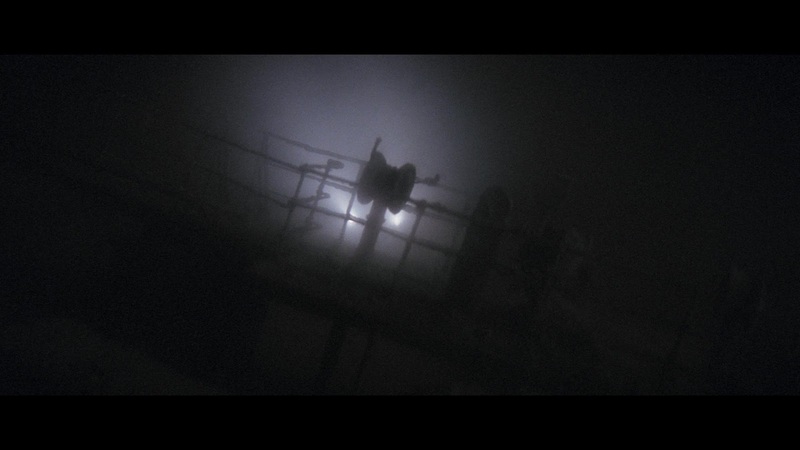 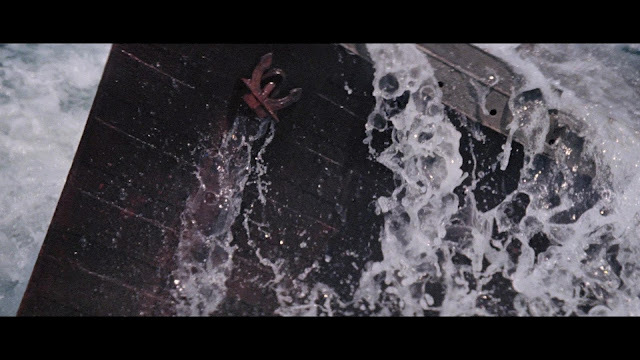 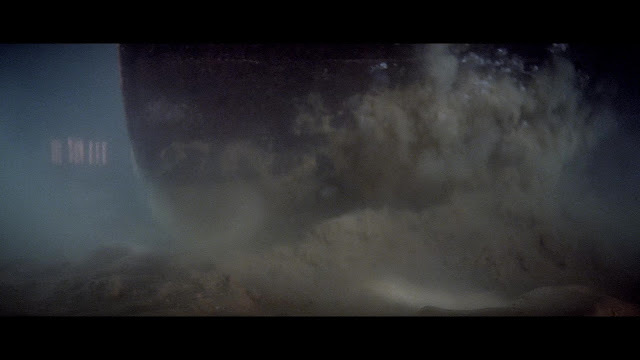 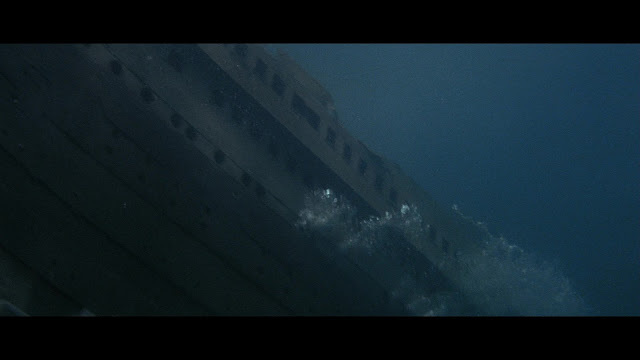 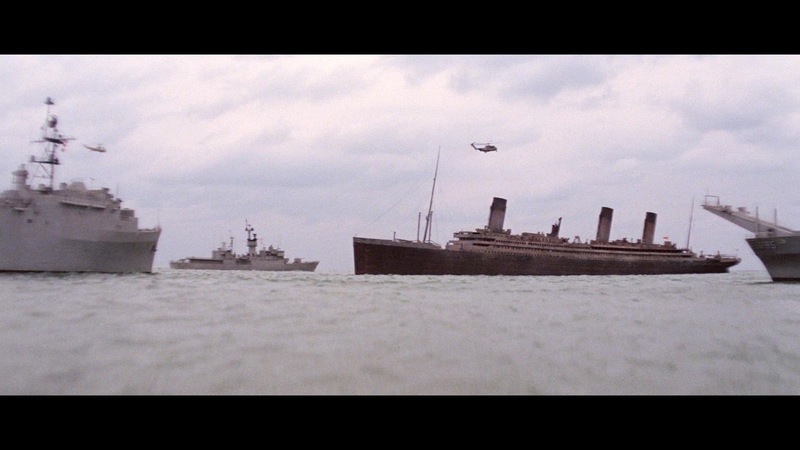 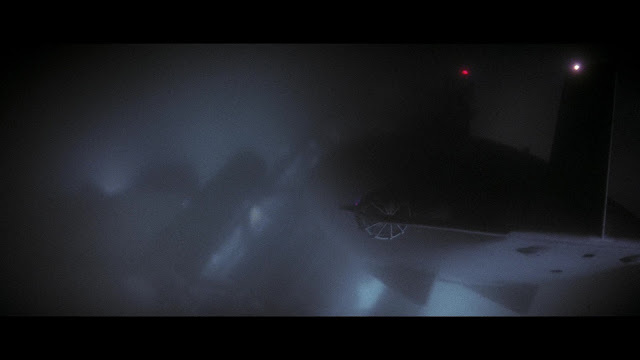 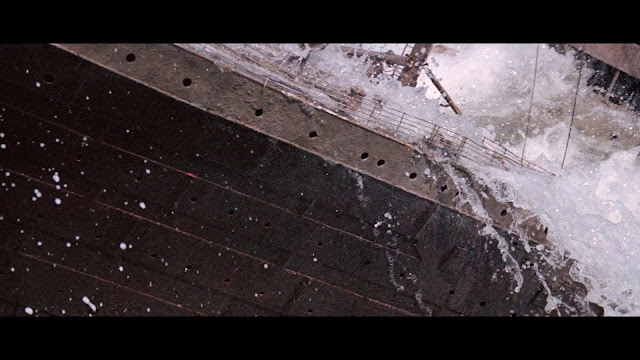 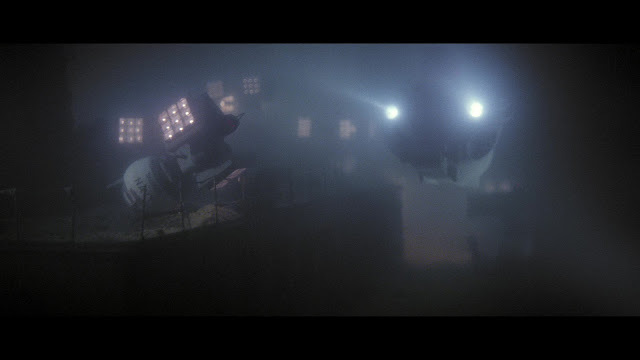 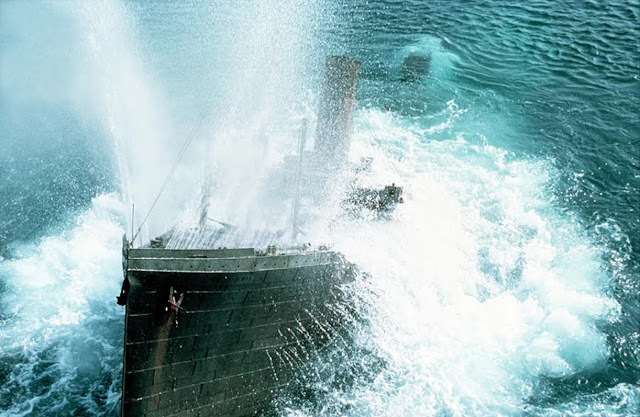 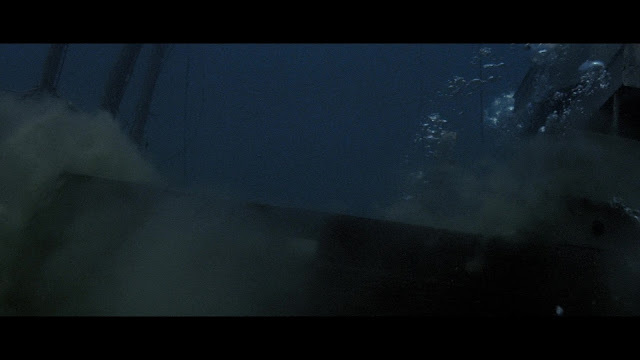 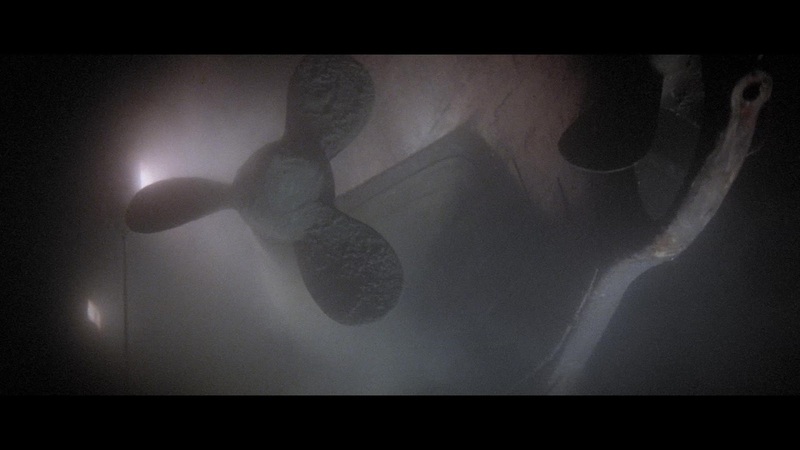 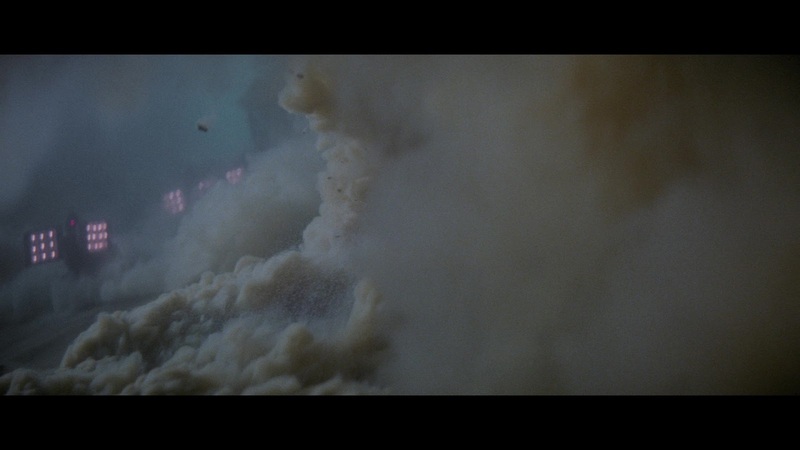 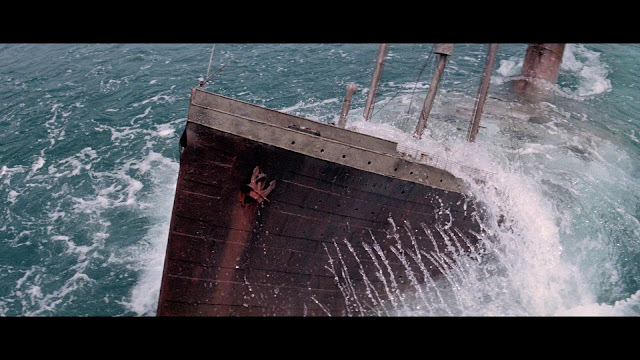 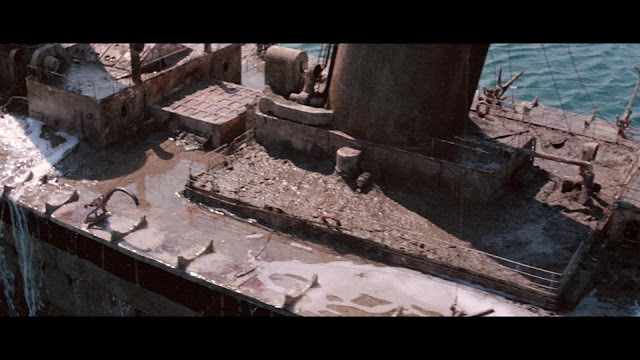 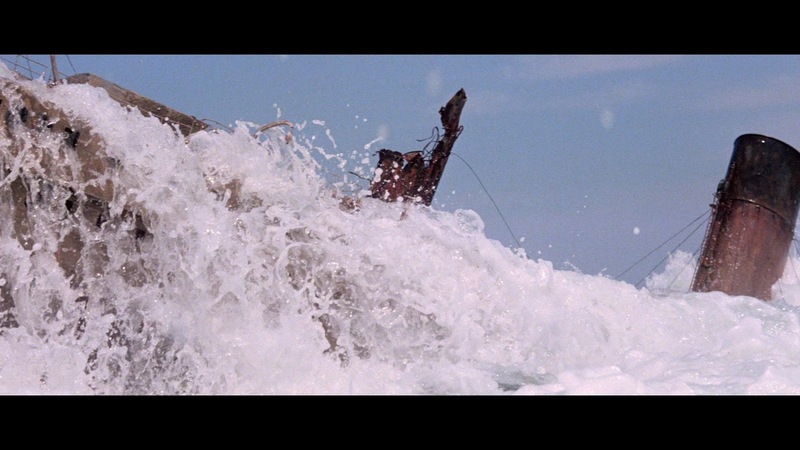 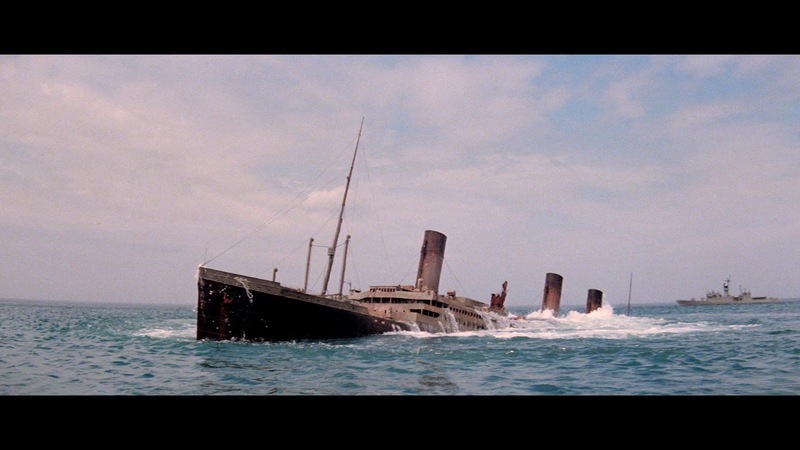 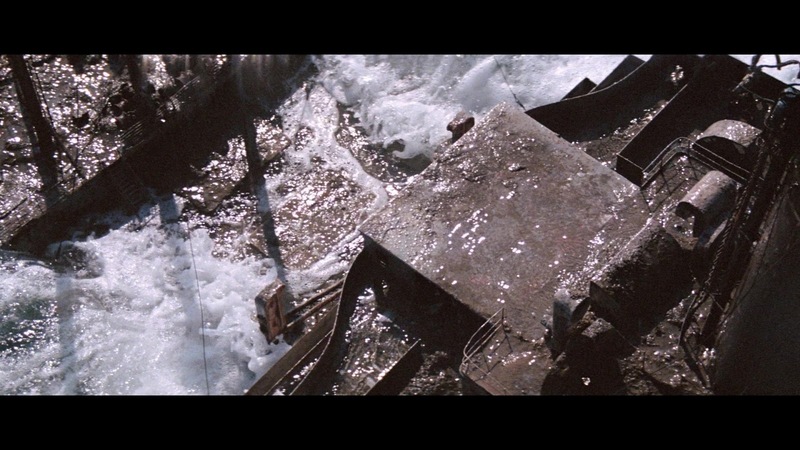 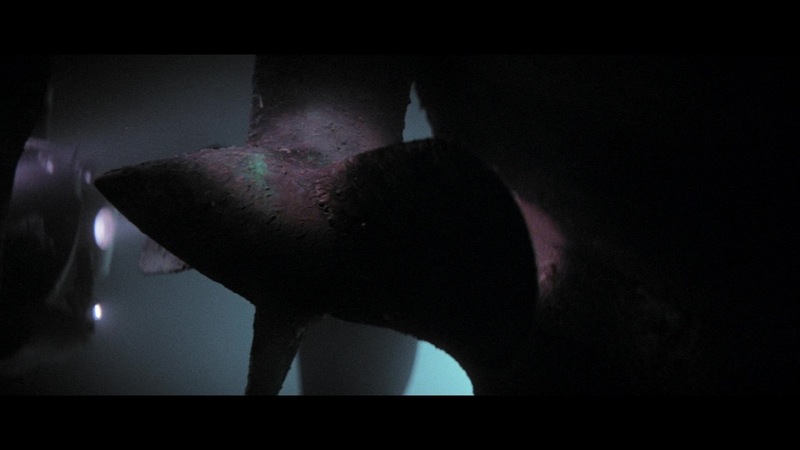 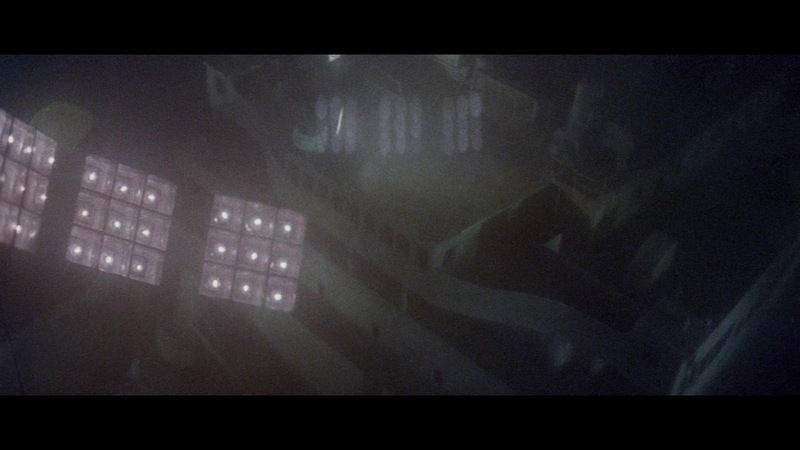 I remember feeling at the time that it was fairly lackluster in execution... except for the sequence of the Titanic breaking the surface, which was to me, then as now, the single most brilliantly staged and photographed miniature effect ever captured on film. 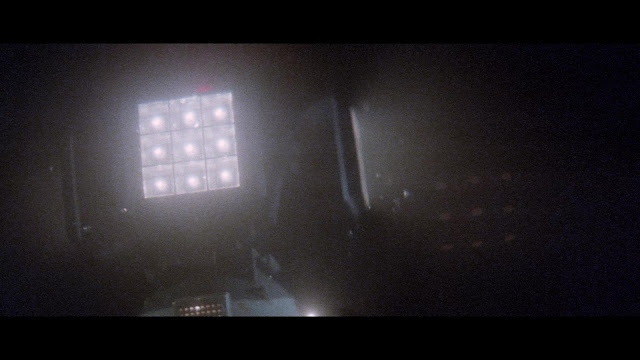 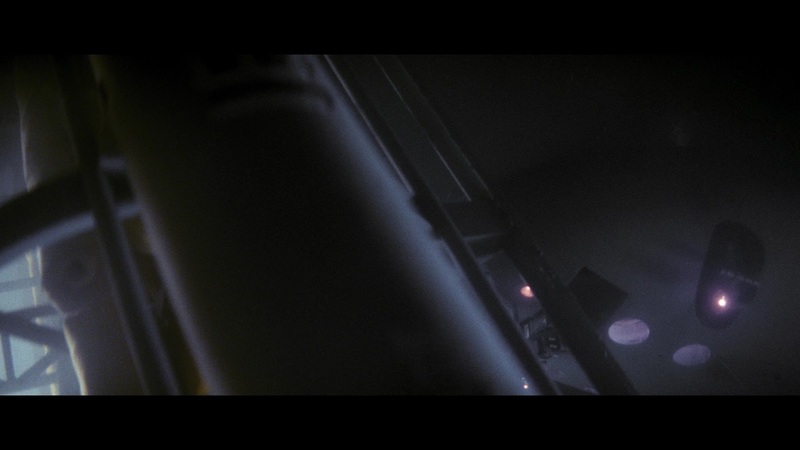 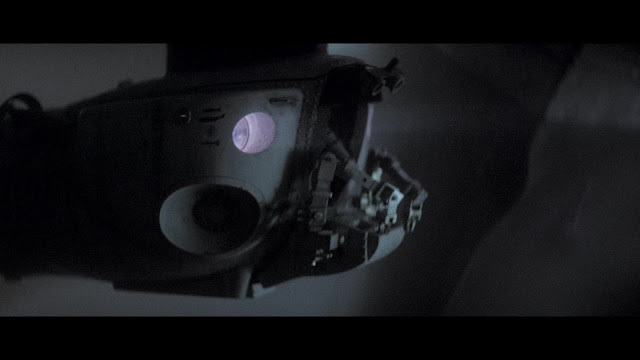 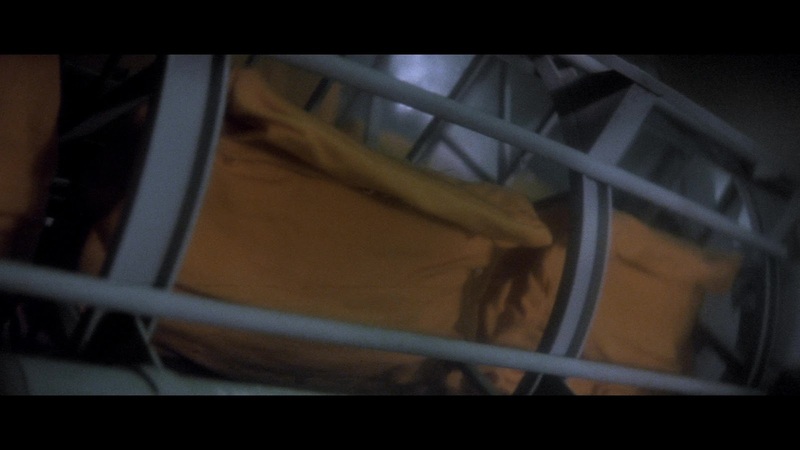 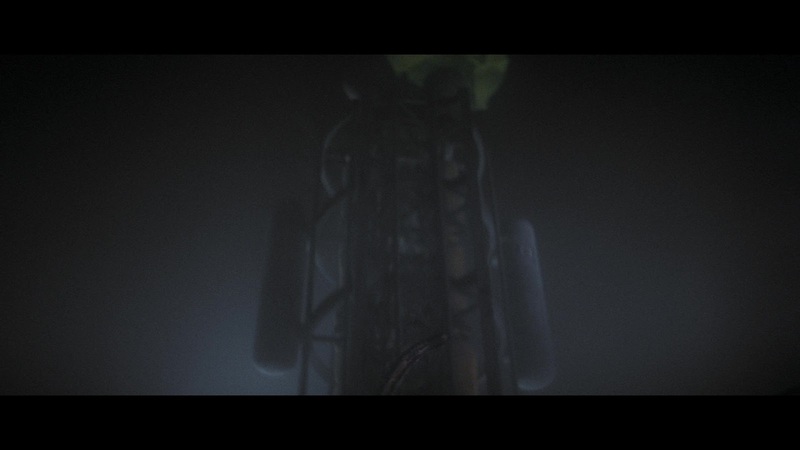 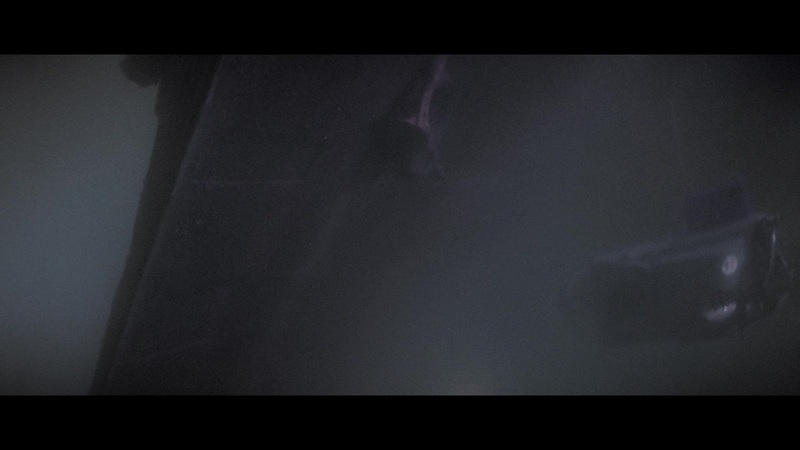 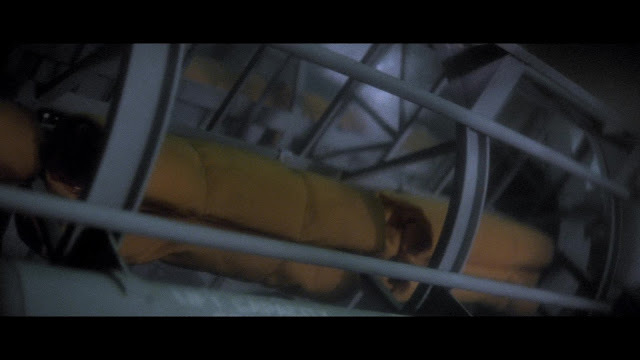 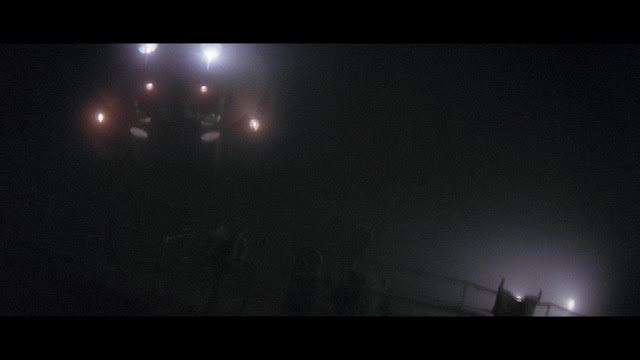 It is pretty apparent that the filmmakers thought so too as they re-used the overhead back lit angle in its entirety, without a cut, for the whole end credits sequence. 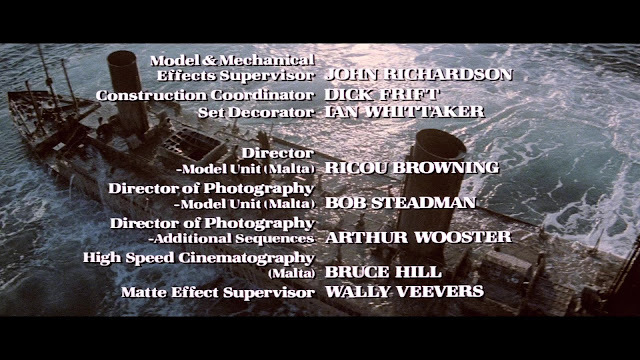 The sequence was shot using a high speed camera at 360 frames per second by Bruce Hill who was a specialist in high speed cinematography. 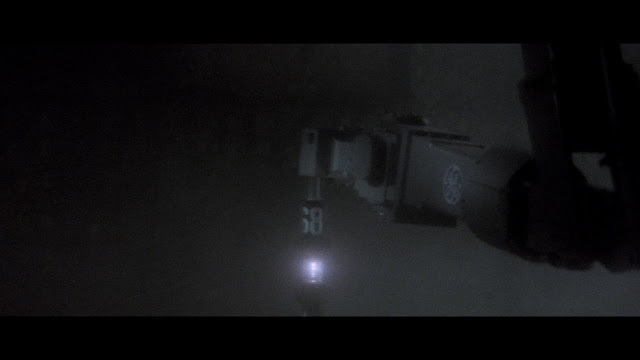 360 frames per second is 15 times faster than the normal rate of 24 frames per second, making 1 second in reality last 15 seconds on the screen, about as fast as it was possible to get 35mm film to move through a camera using a pin registered intermittent movement ( see this post for more). 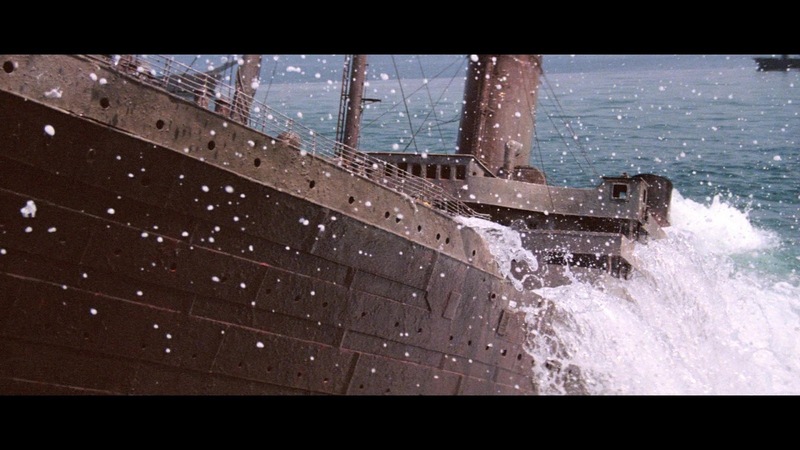 The shots of the large model Titanic with all the water streaming off, with sparkling highlights glinting off the drops is truly spectacular. The Model sequence supervisor was John Richardson, once again some really great miniature work. 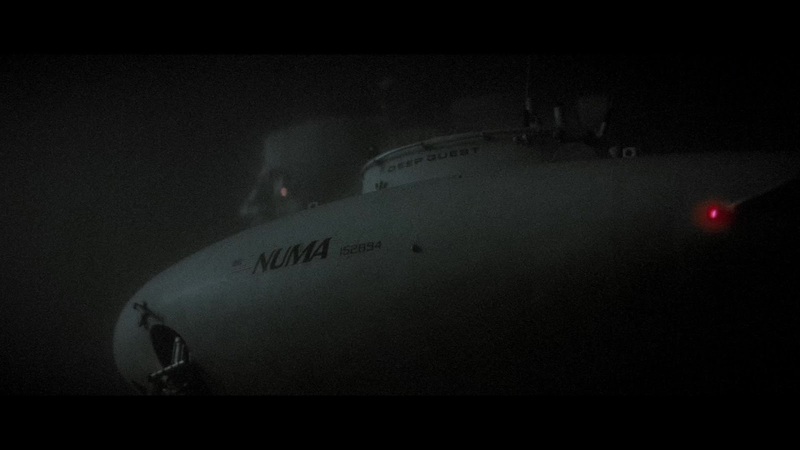 See North Sea Hijack for more of his work. 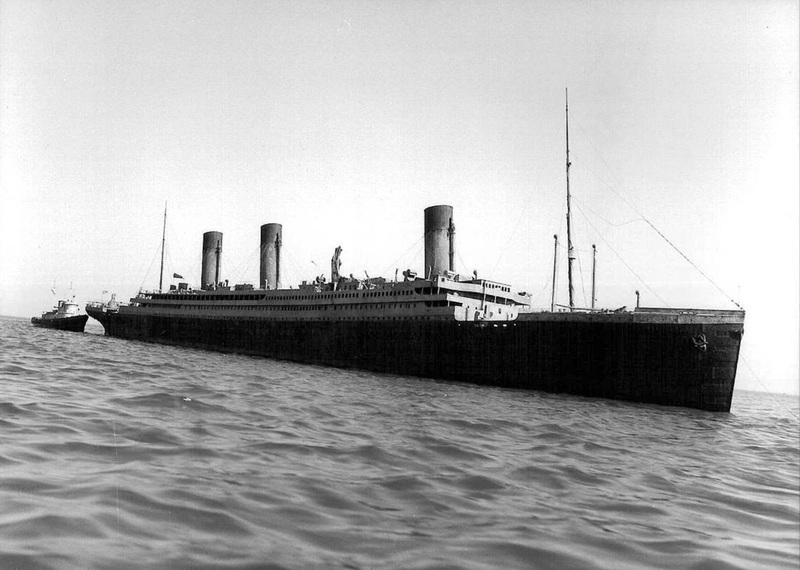 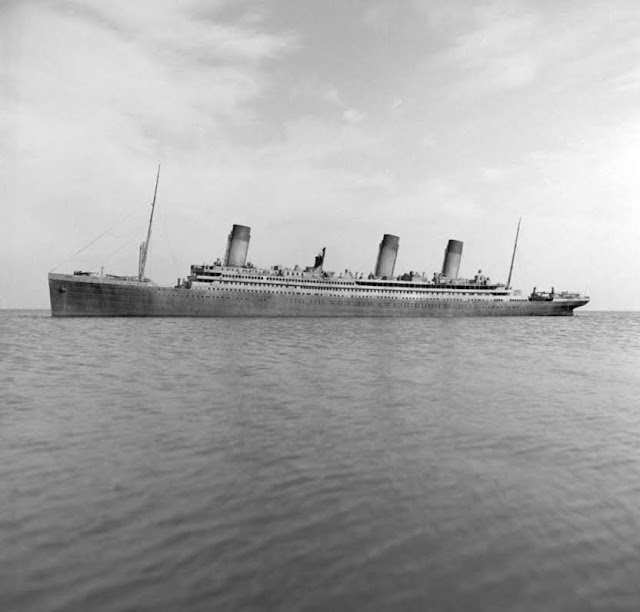 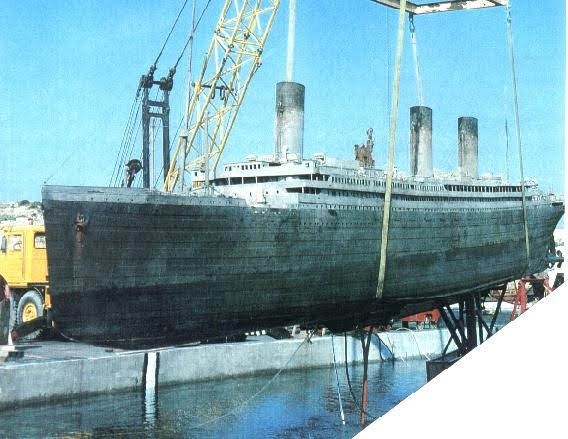 The model Titanic was 55 feet (16.76m) long, 12 feet (3.66m) high and weighed around 10 tons (9.07t). 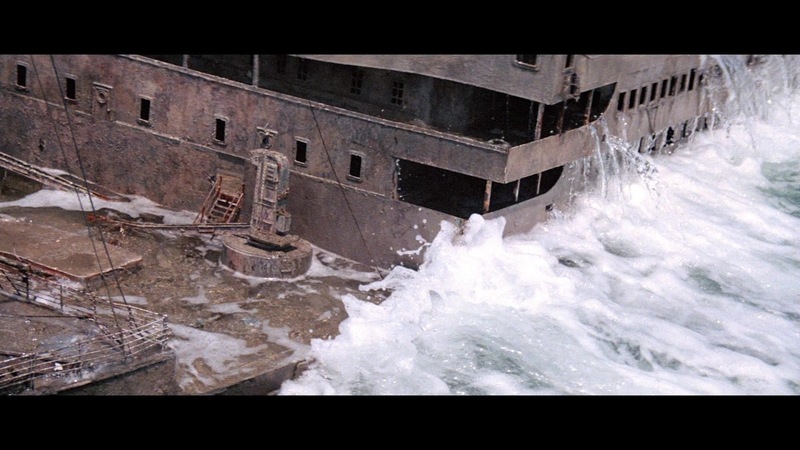 This makes it's scale to be 1/16th. It was built at the CBS studios in California and reportedly cost 3 million pounds. 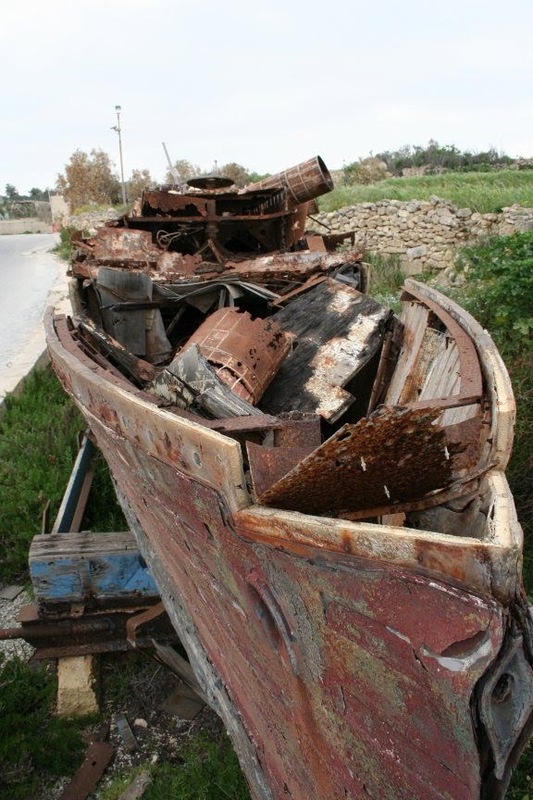 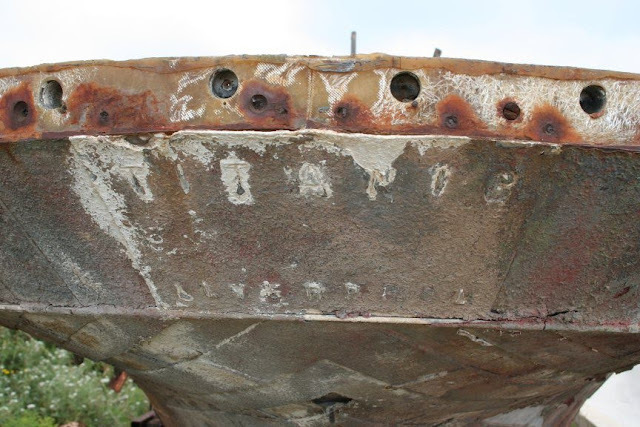 The hull is made from fiberglass with the superstructure built from steel, wood and resin. 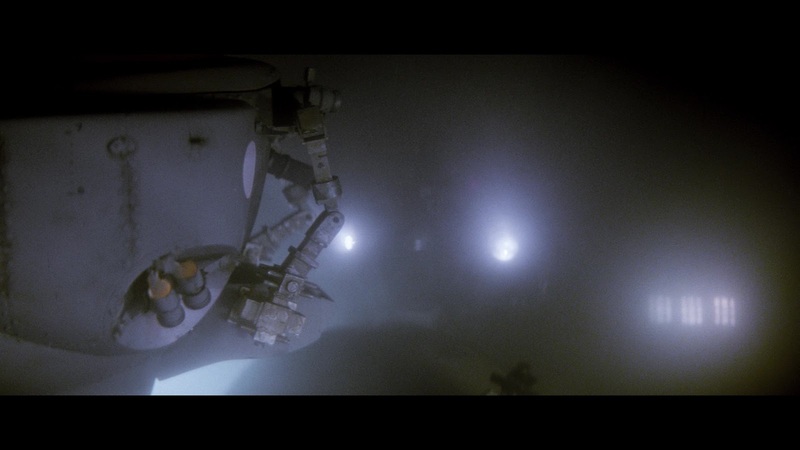 Inside the hull was piping and flotation tanks. 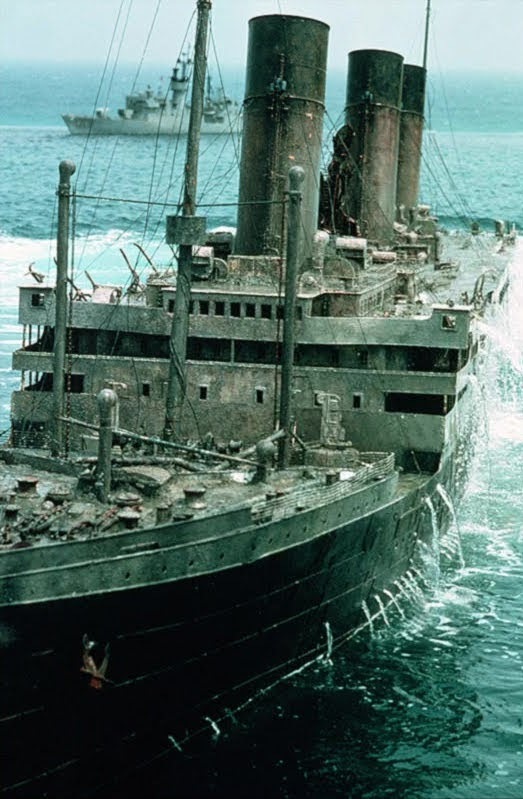 Controversially for some fans, changes were made to the model, namely two ventilators either side of the forward mast, so that it more closely resembled the bow section of the full size ship (Athenia) used for the live action shots on board, thus spoiling the accuracy somewhat. 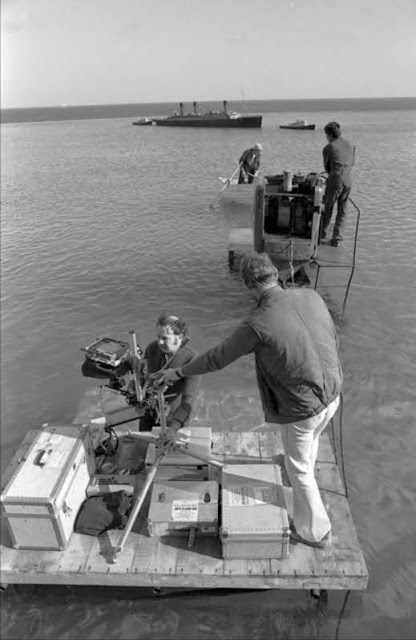 The model was attached to a rig for the surfacing shots so the action could be repeated for the 28 times it took to acquire all the shots needed for the high speed sequence. 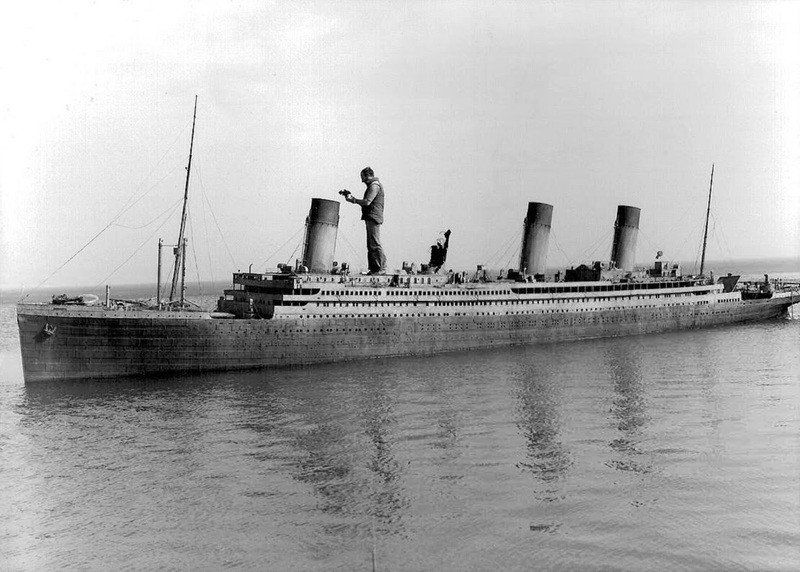 John Richardson walking the deck. 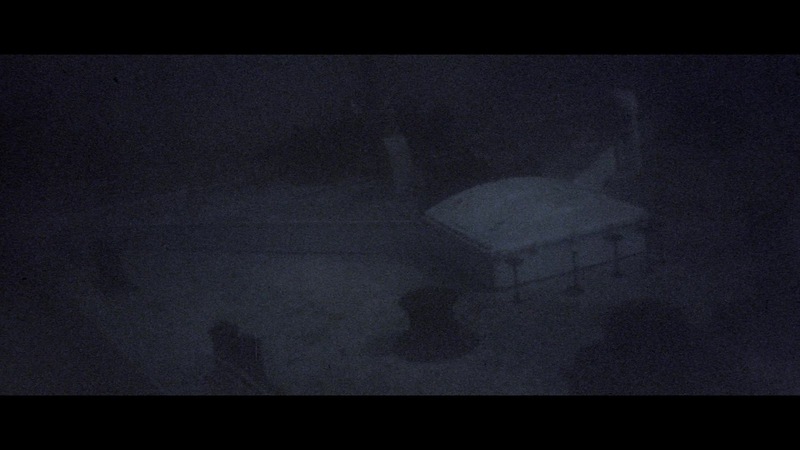 The dark line in the upper part of the photo is the overflow edge of the tank with the real ocean behind. 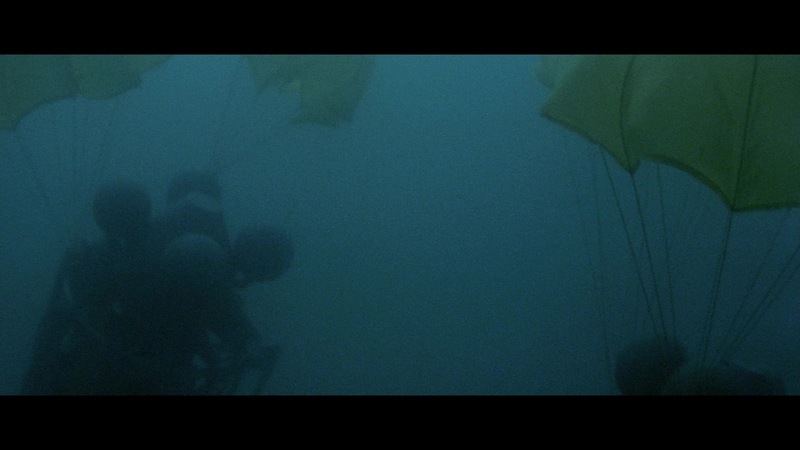 When the camera is low the tank edge and ocean background should blend together making for a proper distant horizon. 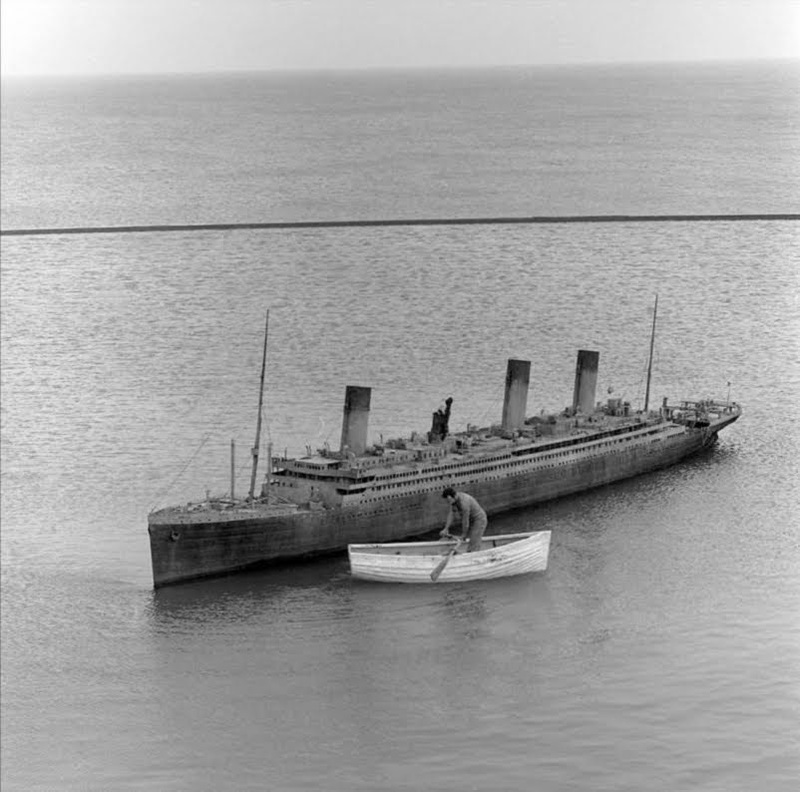 Two miniature tug boats were also built to the same scale. 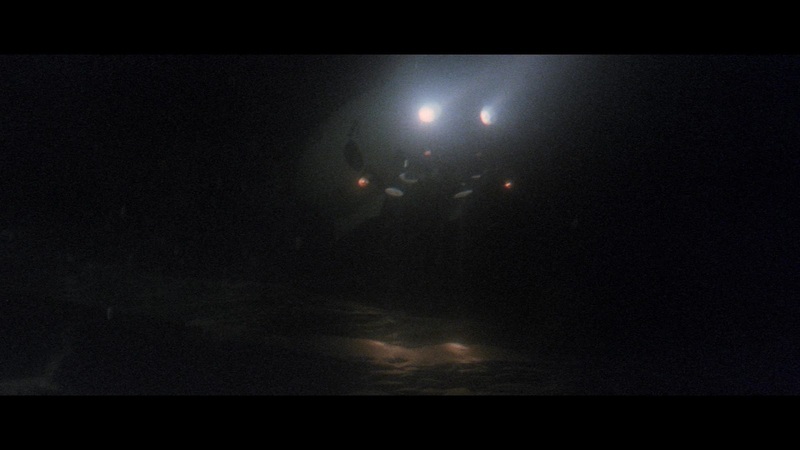 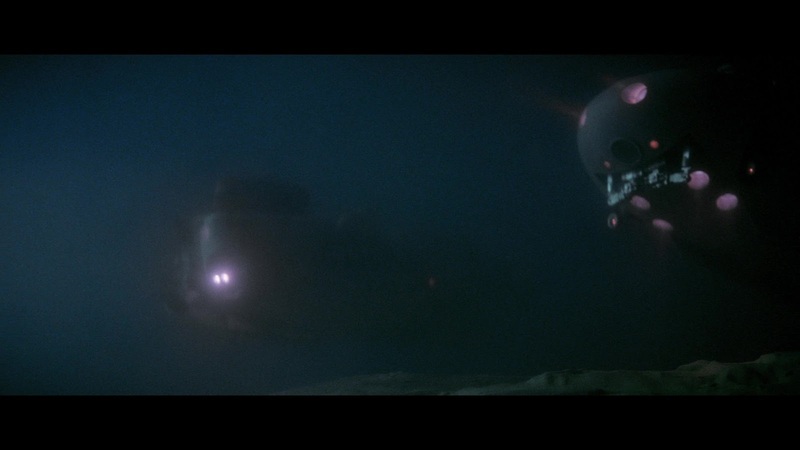 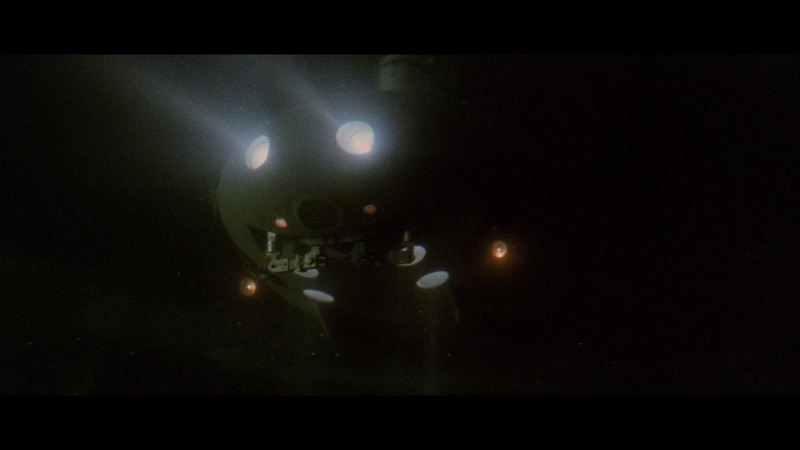 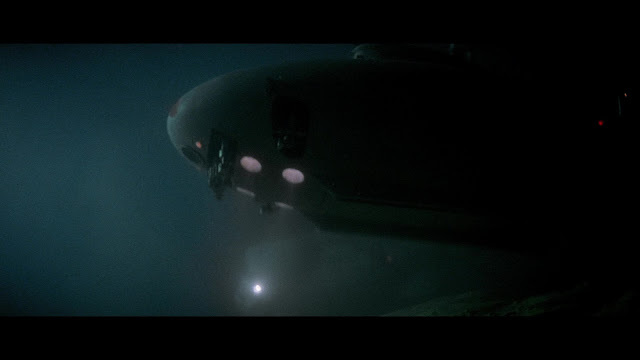 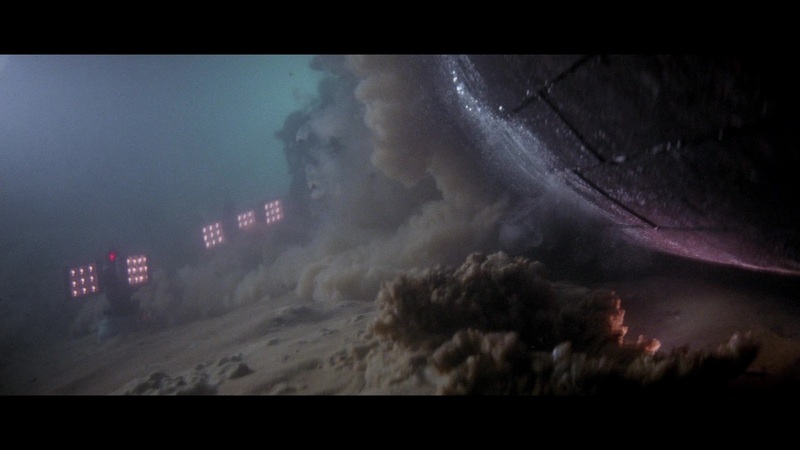 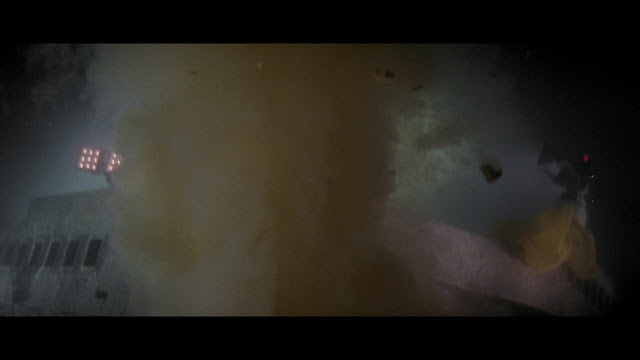 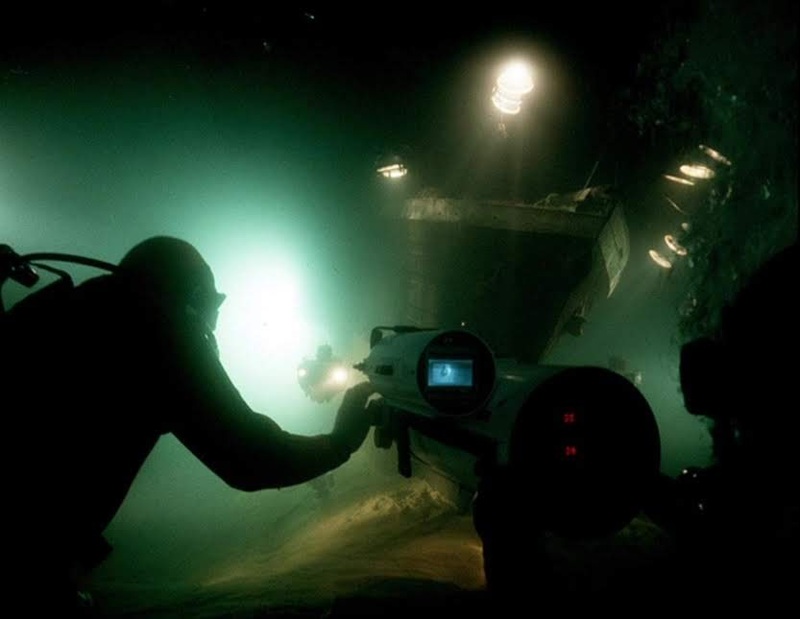 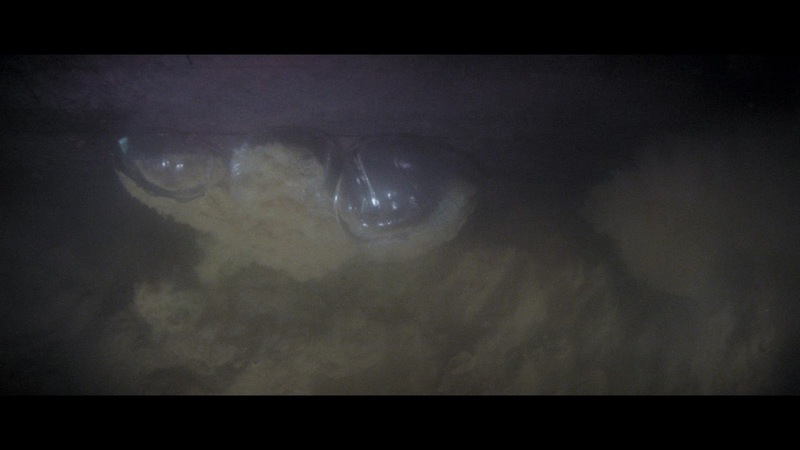 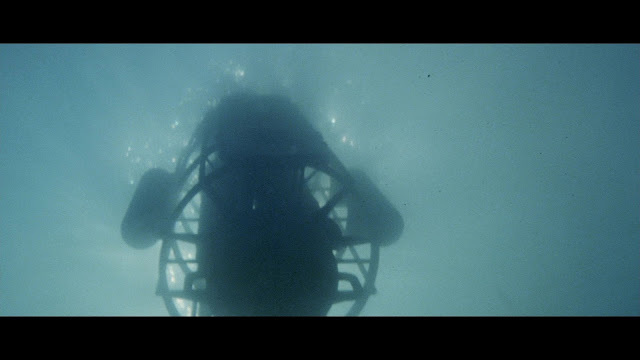 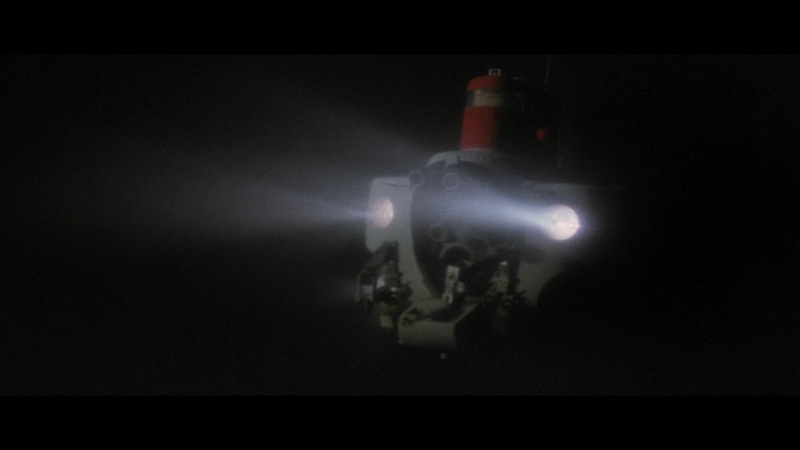 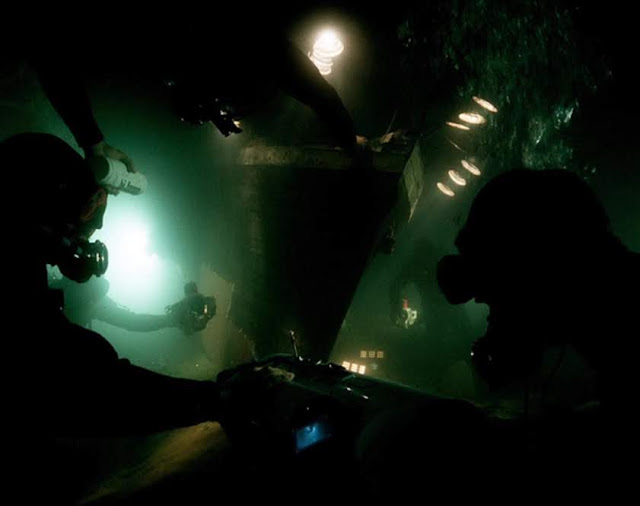 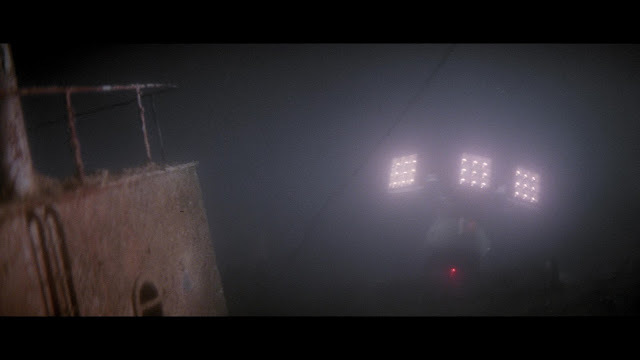 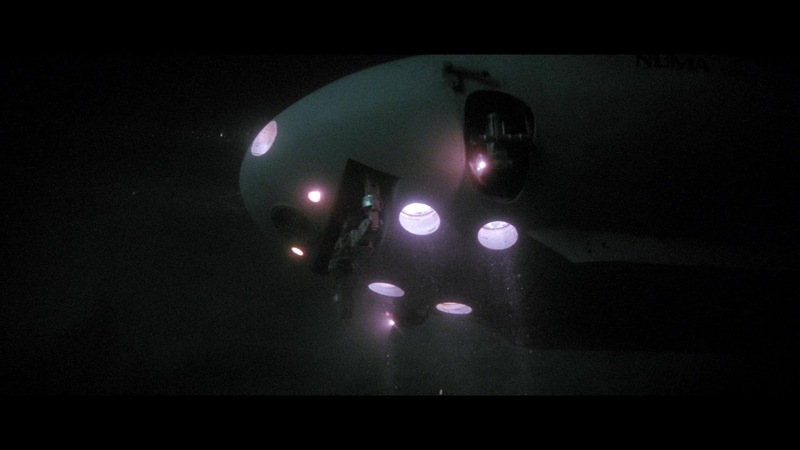 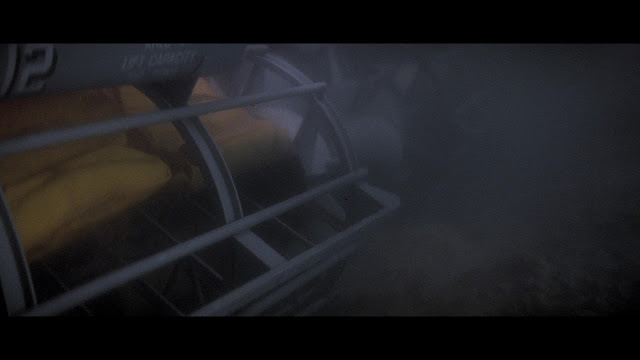 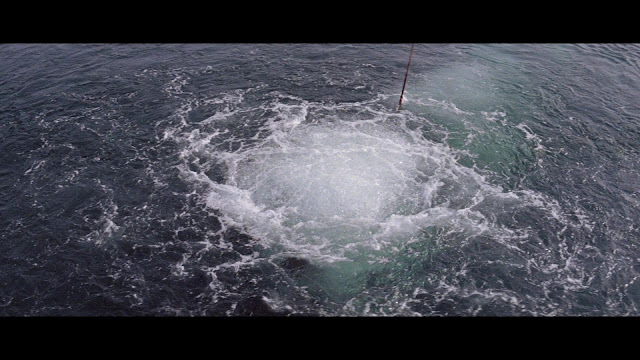 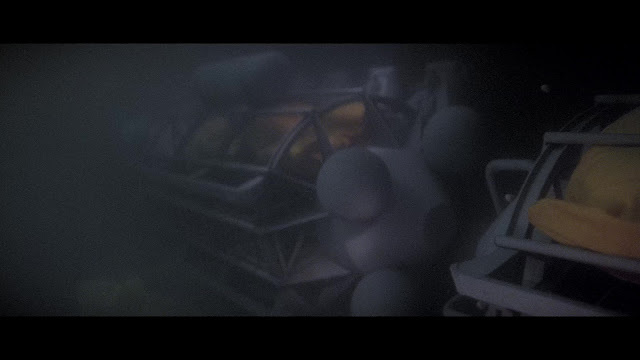 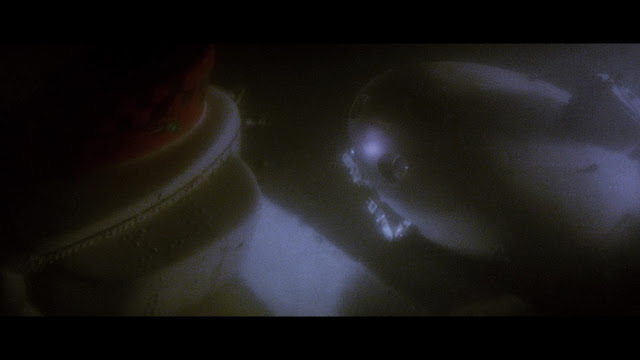 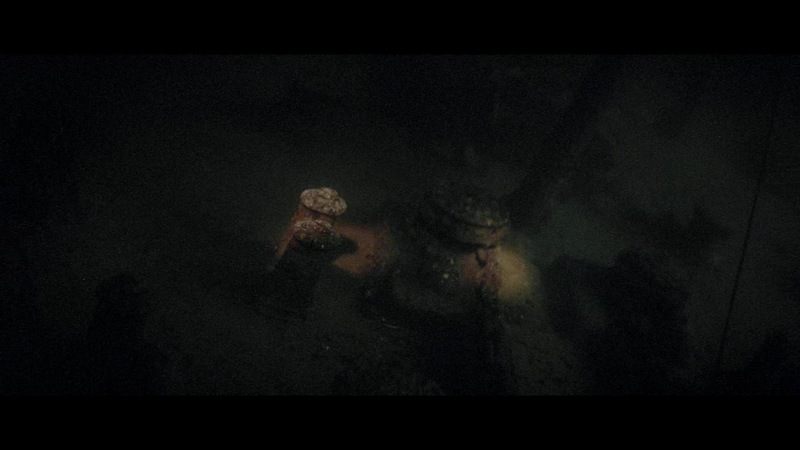 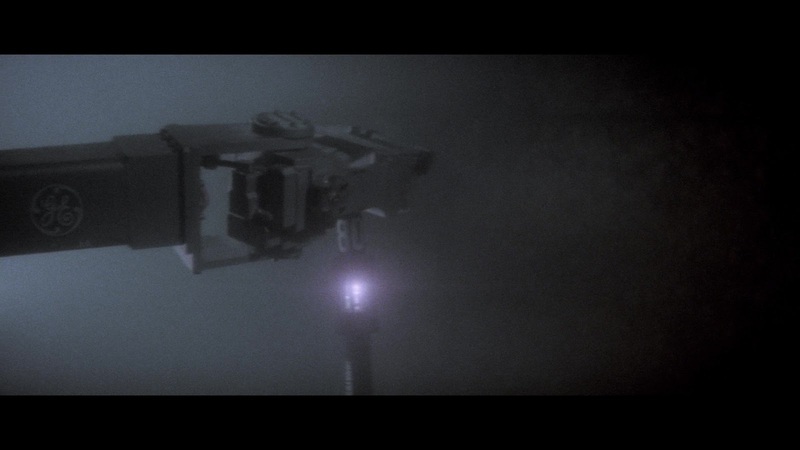 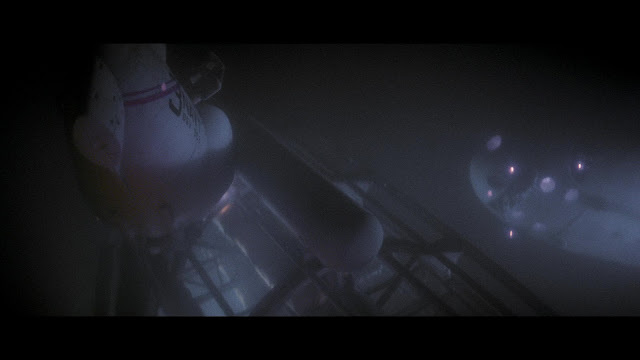 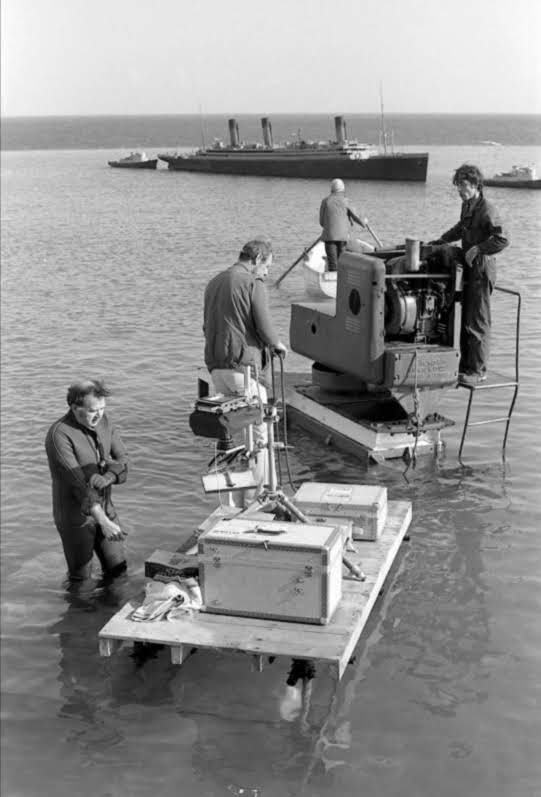 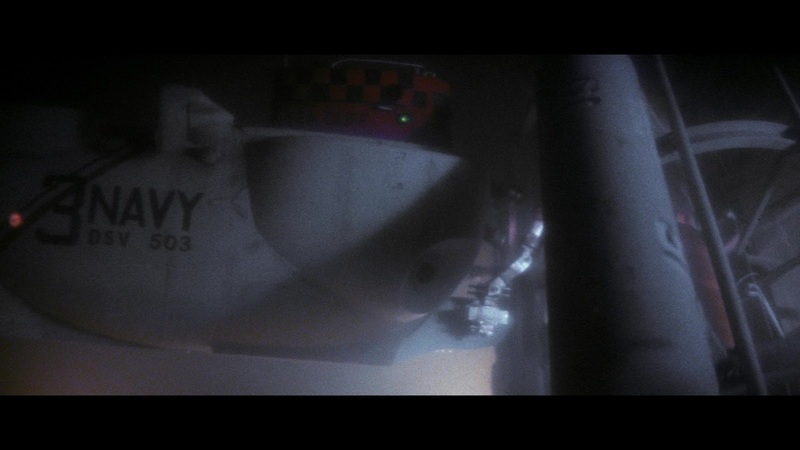 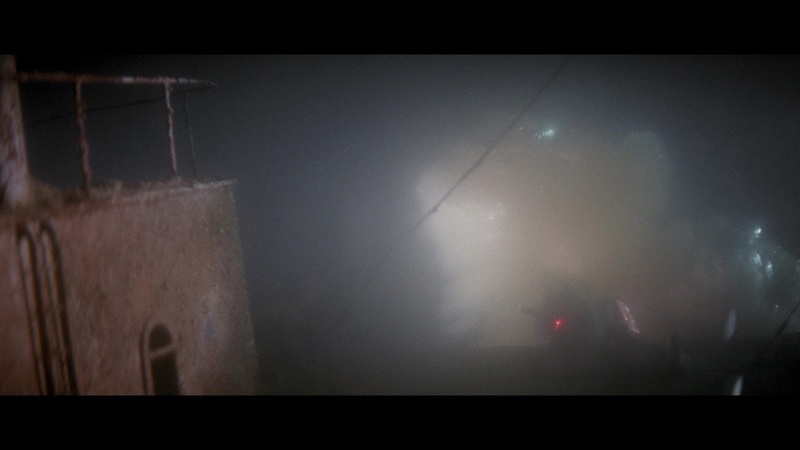 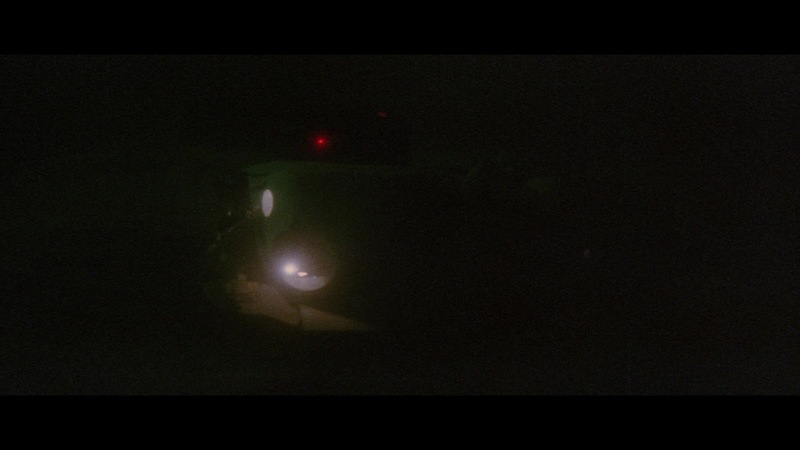 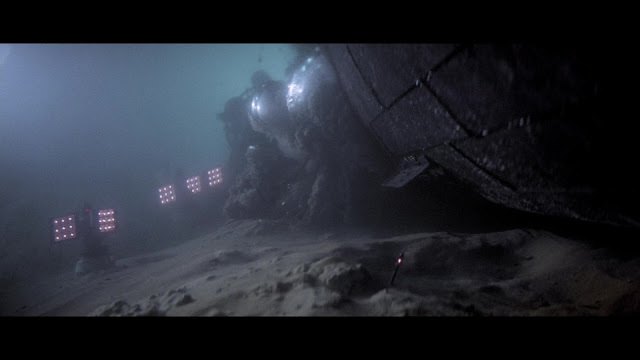 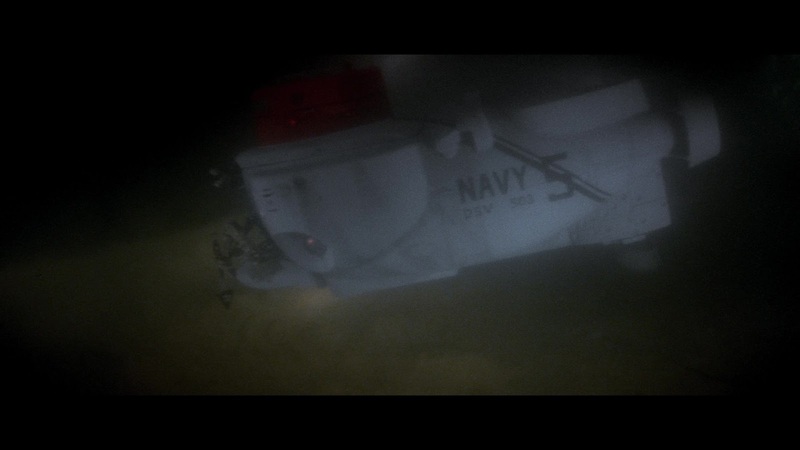 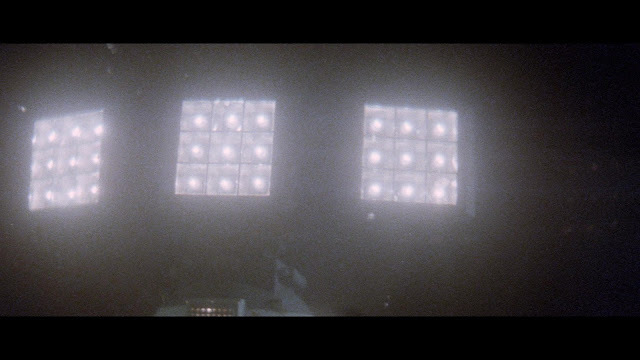 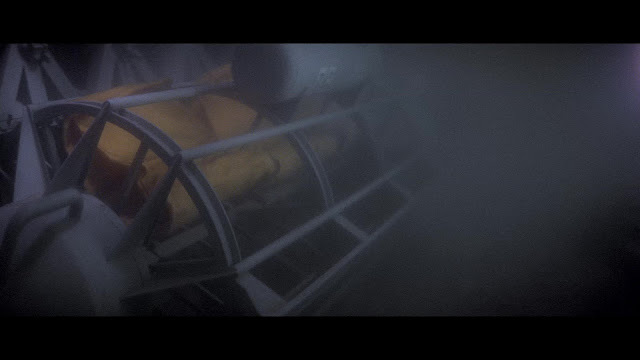 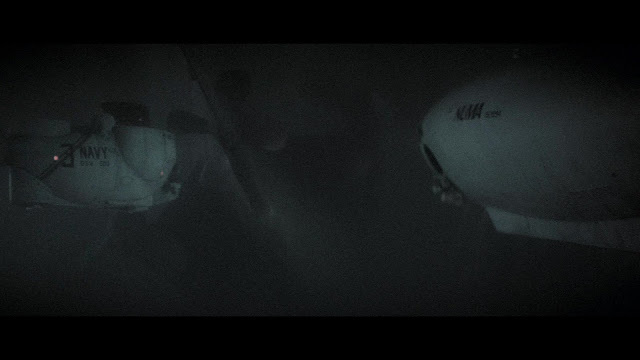 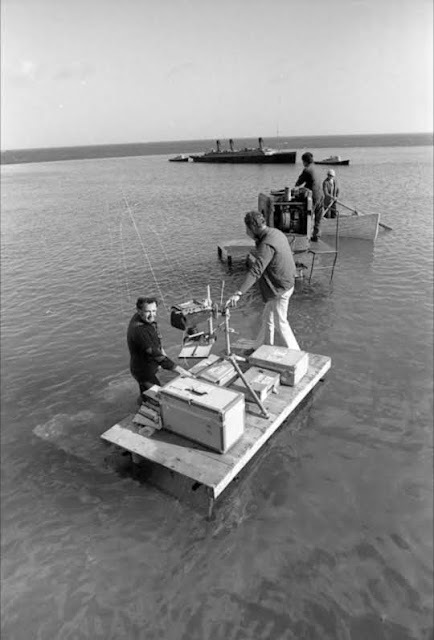 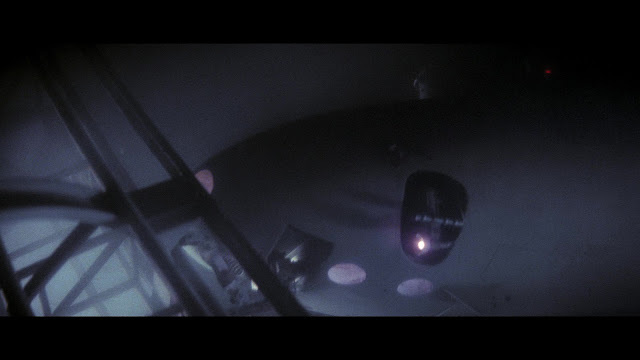 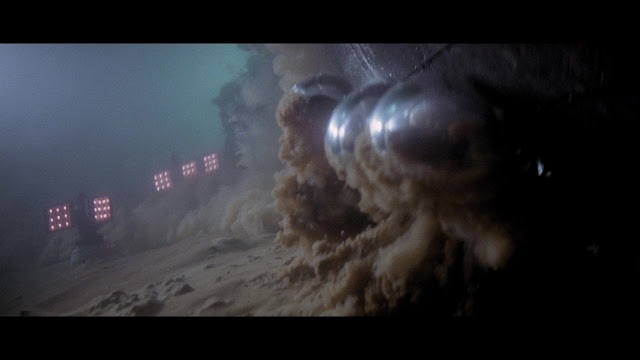 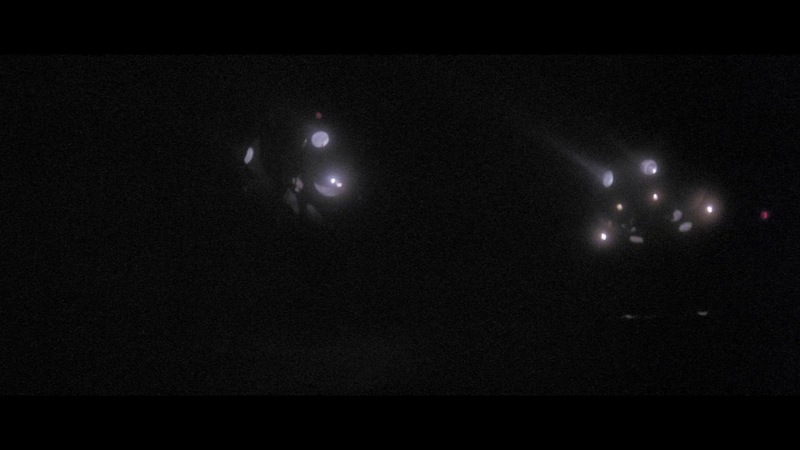 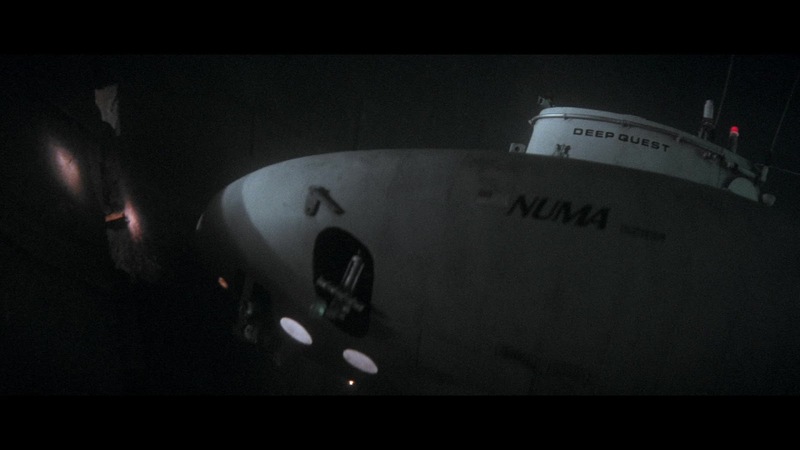 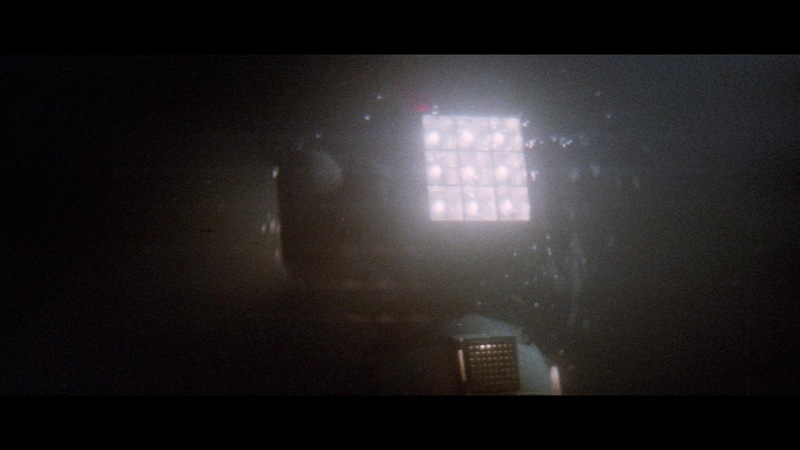 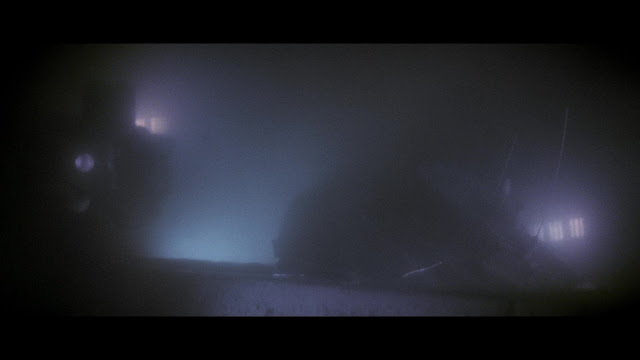 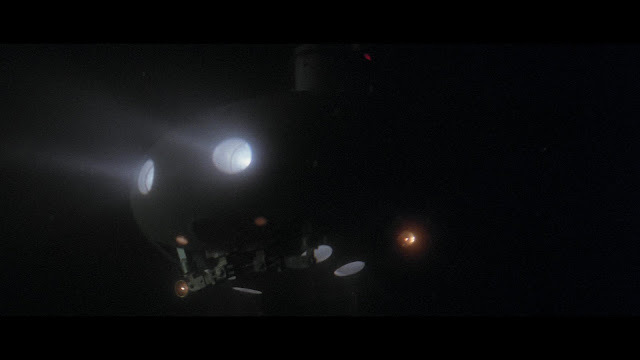 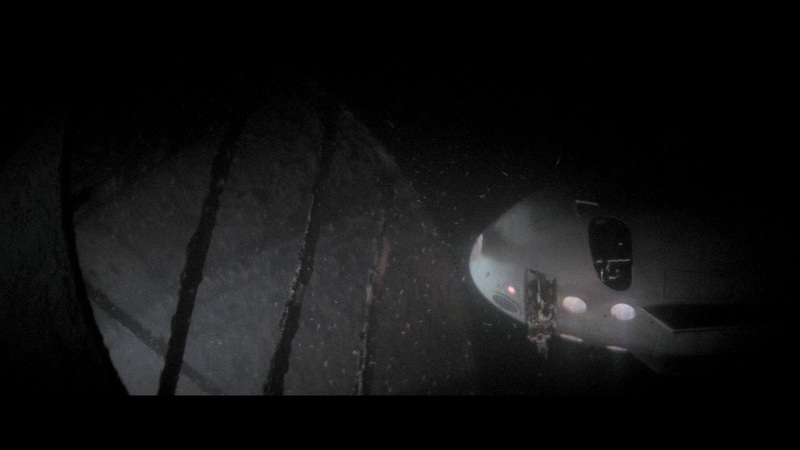 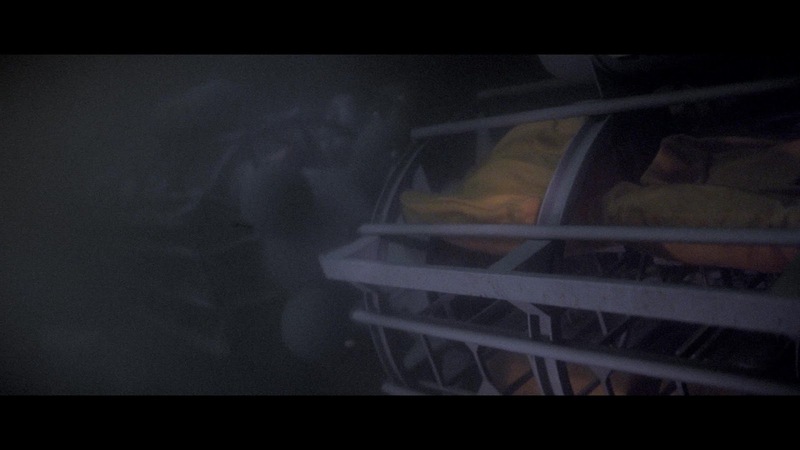 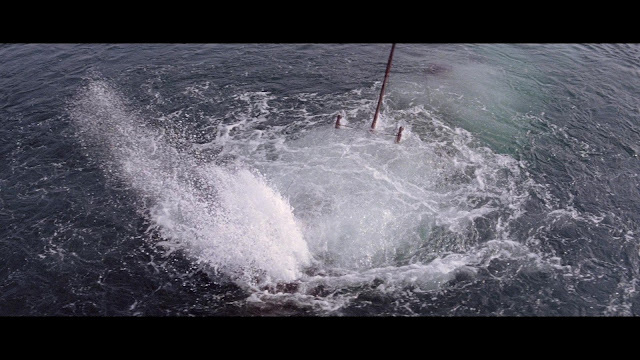 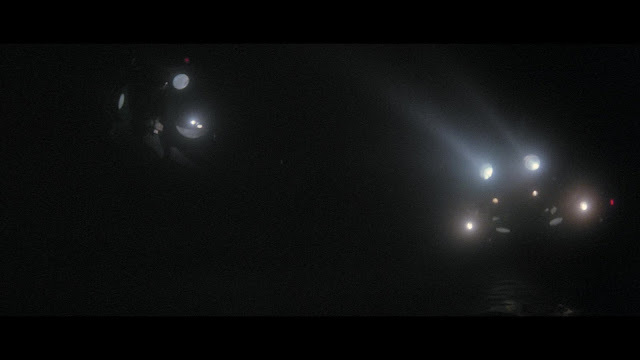 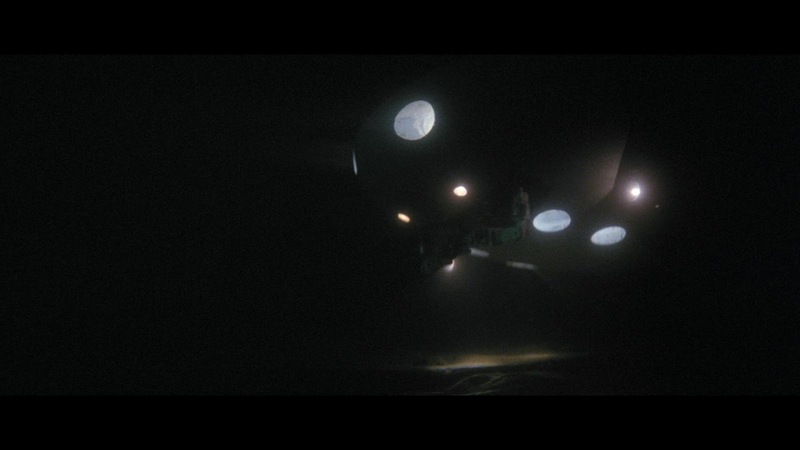 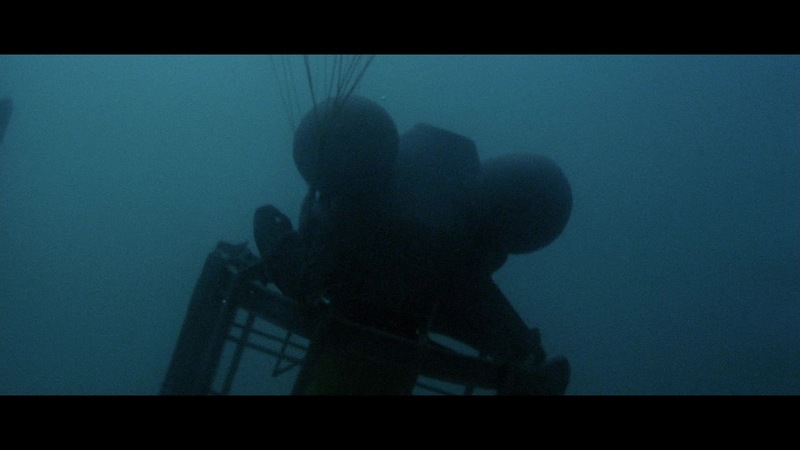 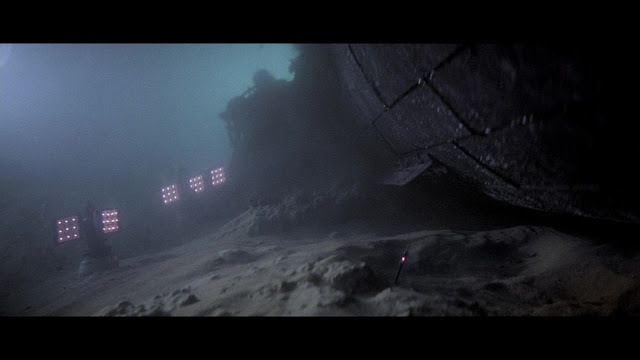 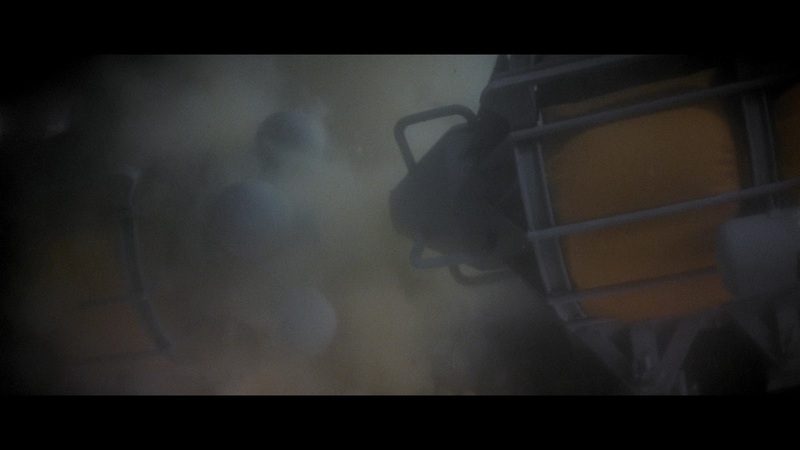 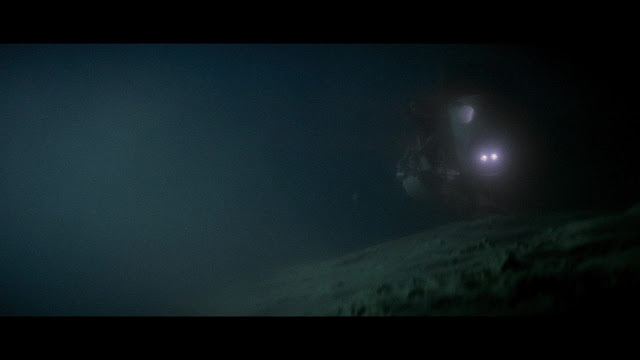 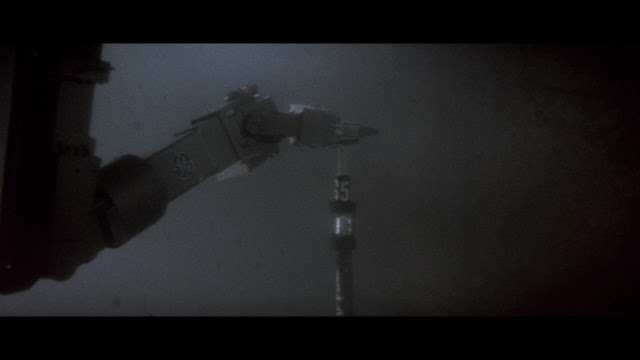 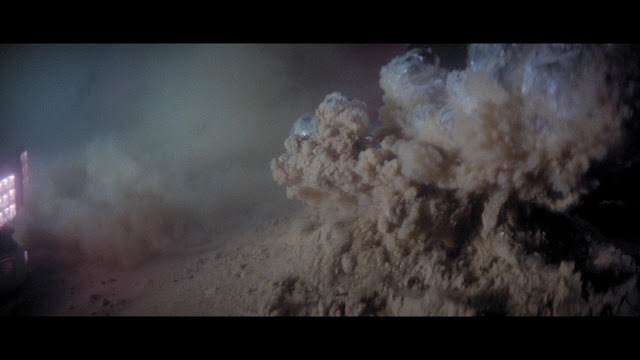 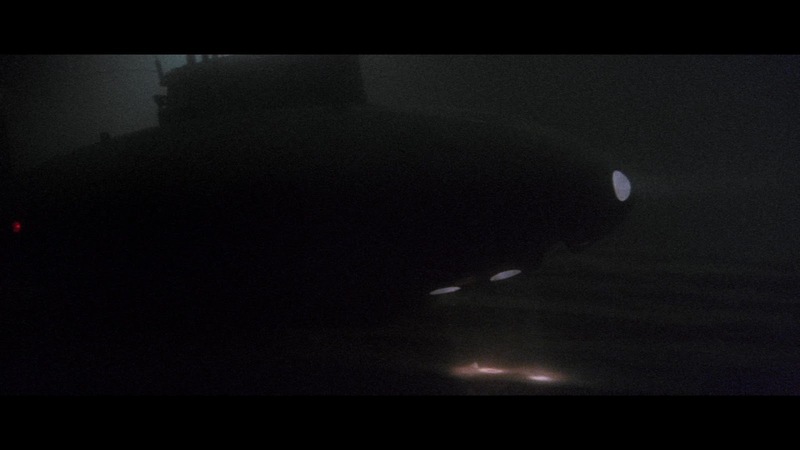 At least three Miniature remote controlled submersibles were constructed for the search sequences, one imploding as it supposedly drops past its rated depth. 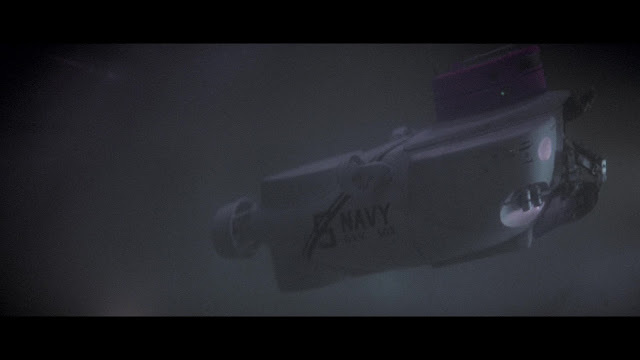 There were least two miniature naval vessels constructed which can be seen in the background of a few surface model shots. 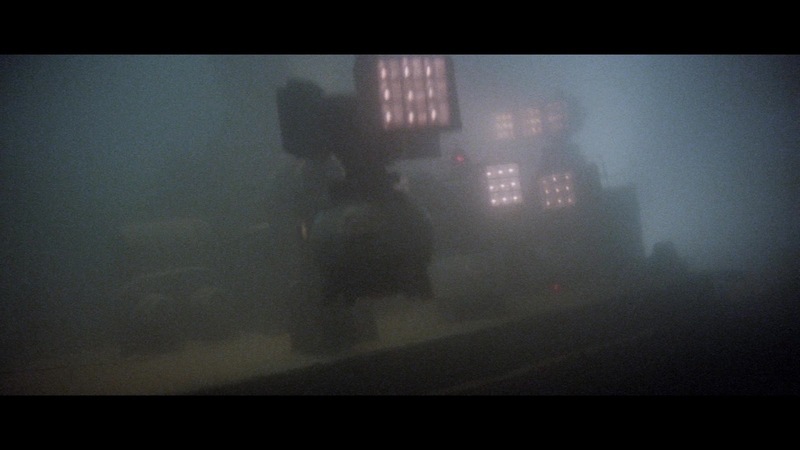 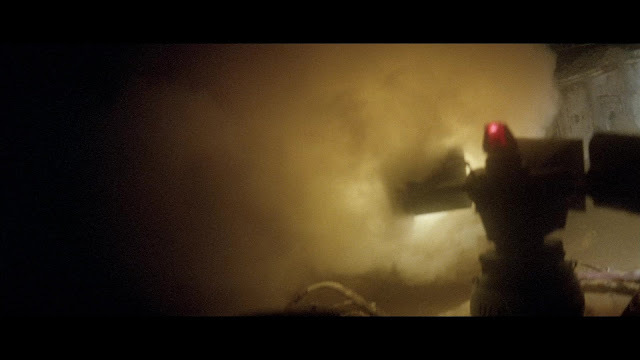 Other miniatures include the floatation tanks, the sea floor mines and a close up submersible manipulator arm used to set the mines in position and arm them. 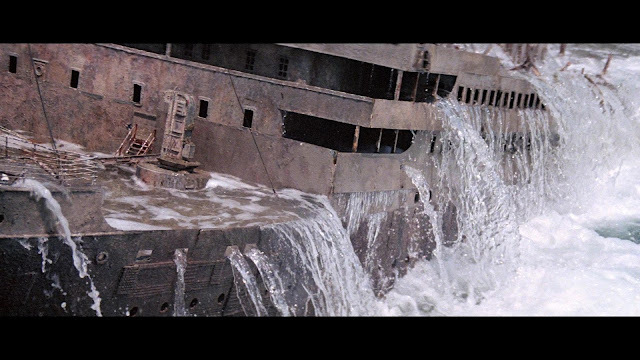 Edge of tank visible in this picture with the tug boat miniatures under way. A smaller 6 foot Titanic model was constructed but is only used in a long shot on the sea floor and a few shots as it rises up to the surface. 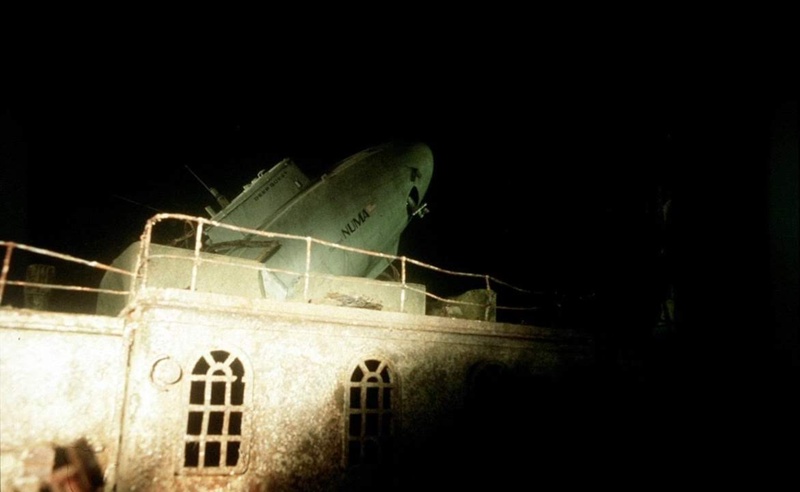 I saw this model when it was very briefly exhibited in a glass case at a replica gold mining tourist attraction in Armadale, a suburb of Perth Western Australia, called Pioneer Village in the early 1980's. 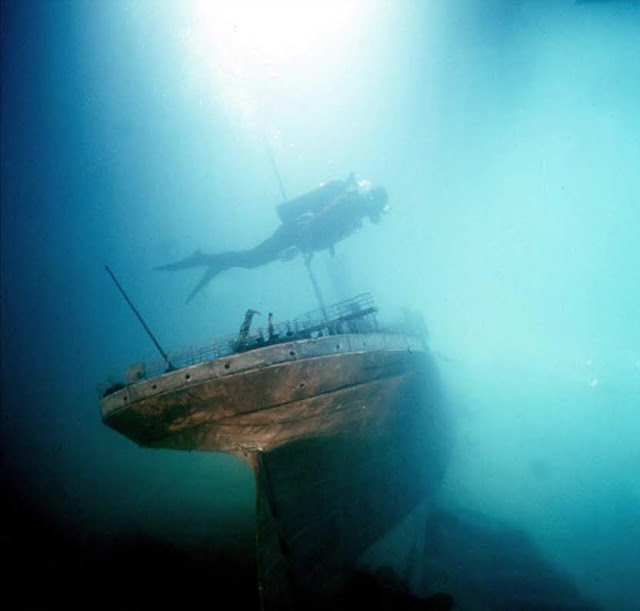 It looked like it was made of brass sheet but was painted with a variety of stippled colours to represent the underwater accretion and corrosion. 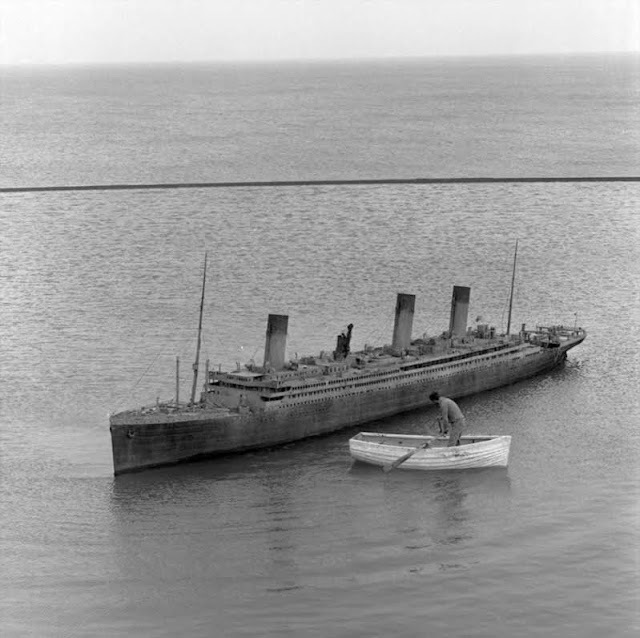 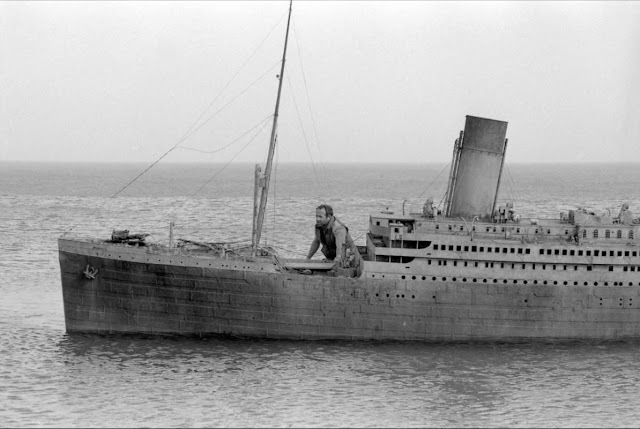 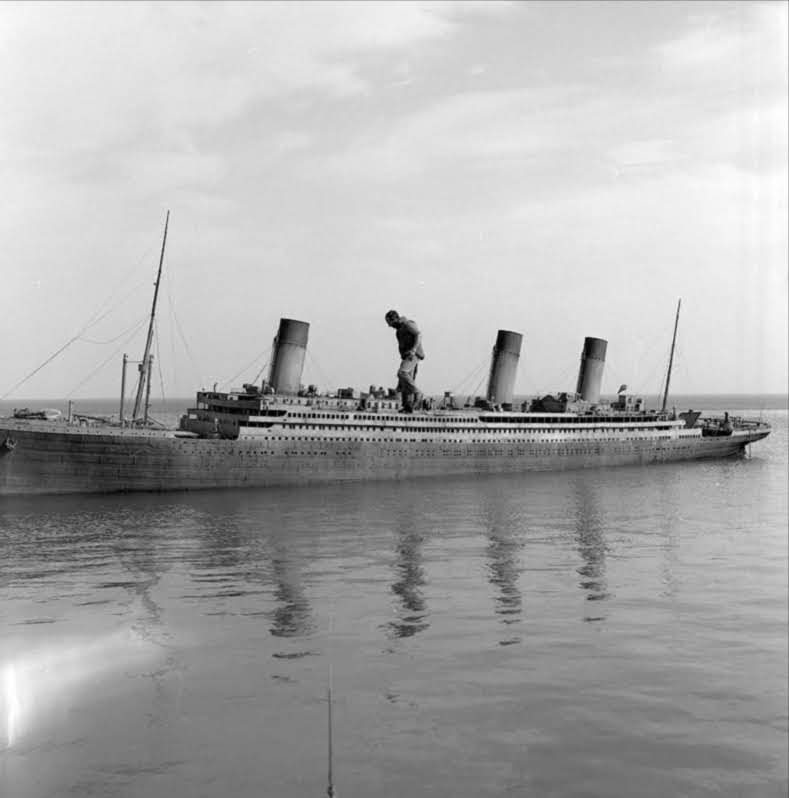 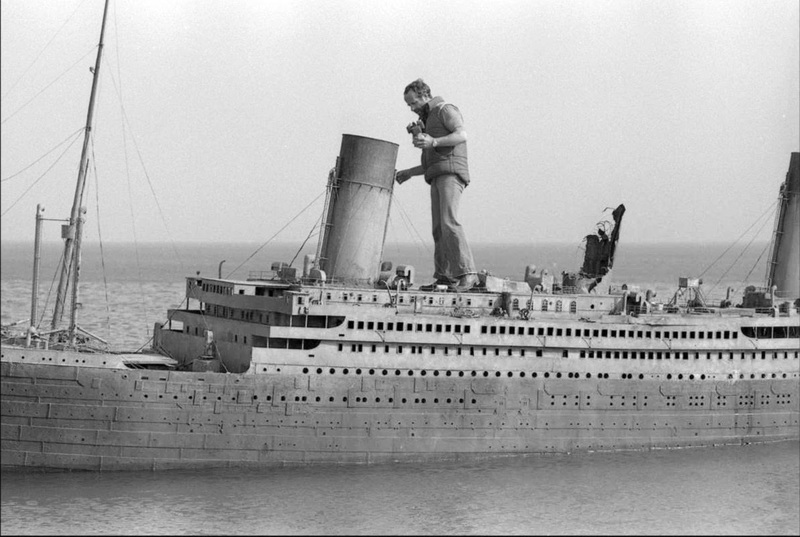 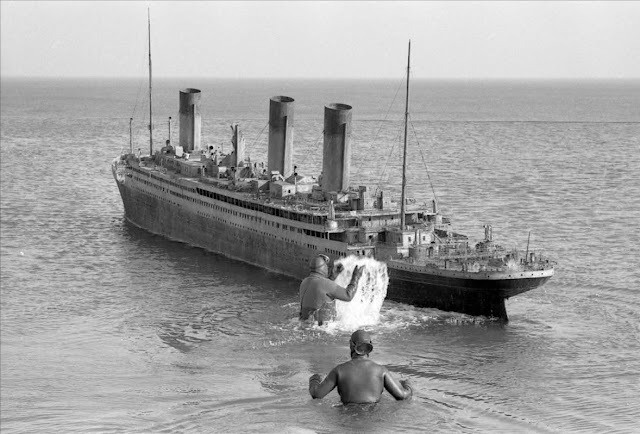 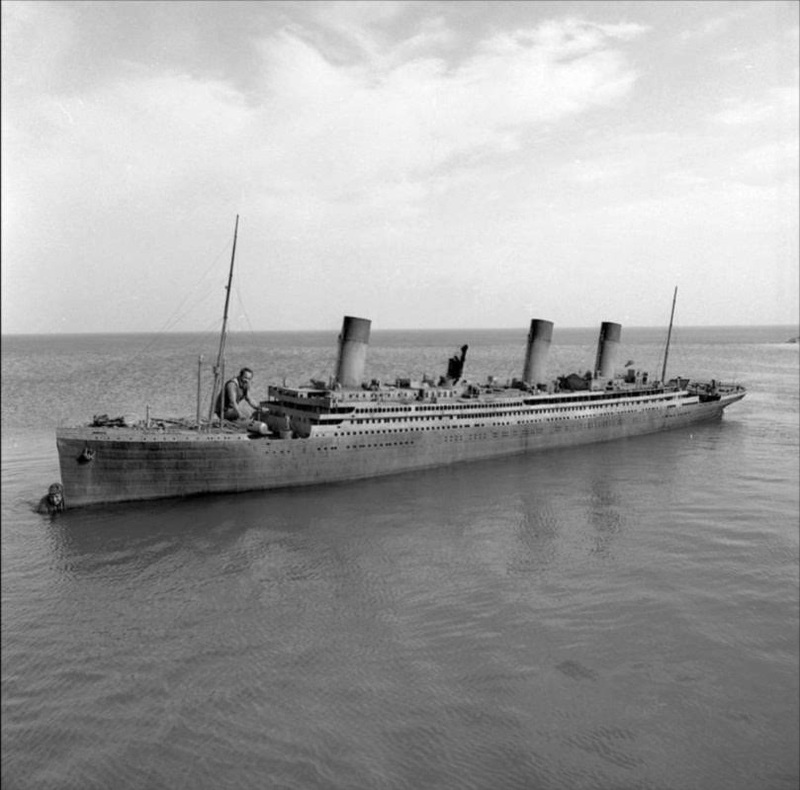 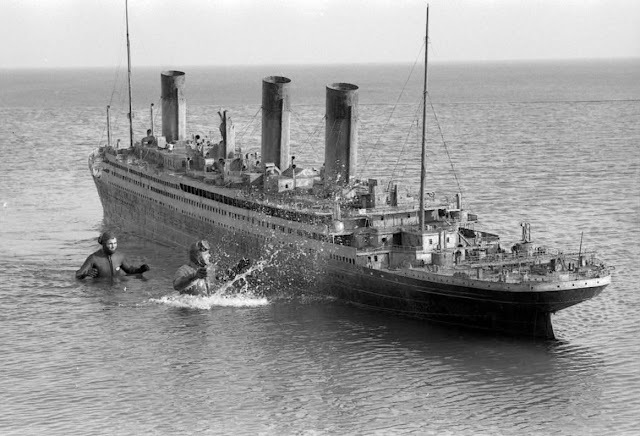 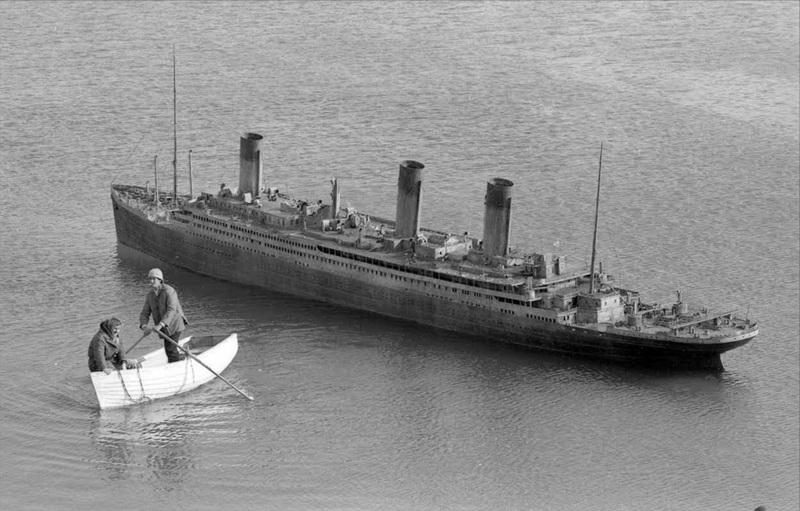 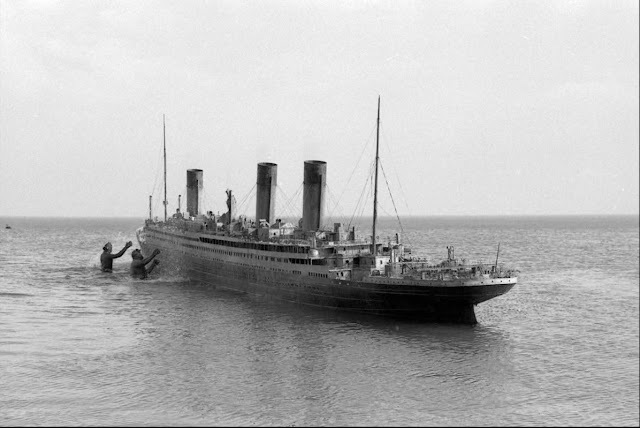 Ken Marschall was a consultant for the miniature Titanic. See the excellent Matte shot blog for more about Ken Marschall's time on this film. 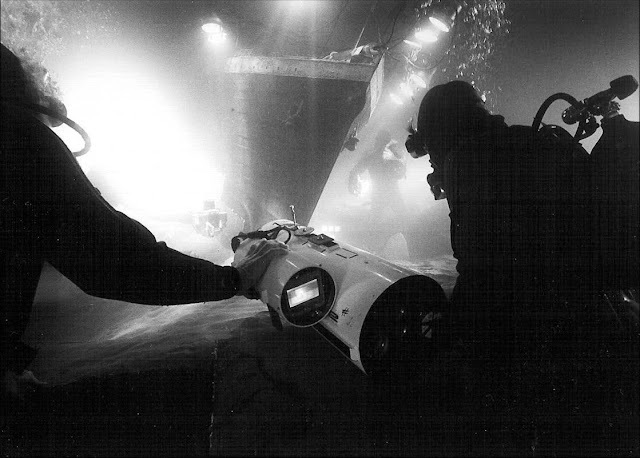 Surface shots were photographed using the already existing large shallow tank at the studio facility on the Island of Malta. You can see the overflow edge in many of the behind the scenes photographs taken from a high angle. The surfacing rig was set up in the deeper well section in the middle of the tank. 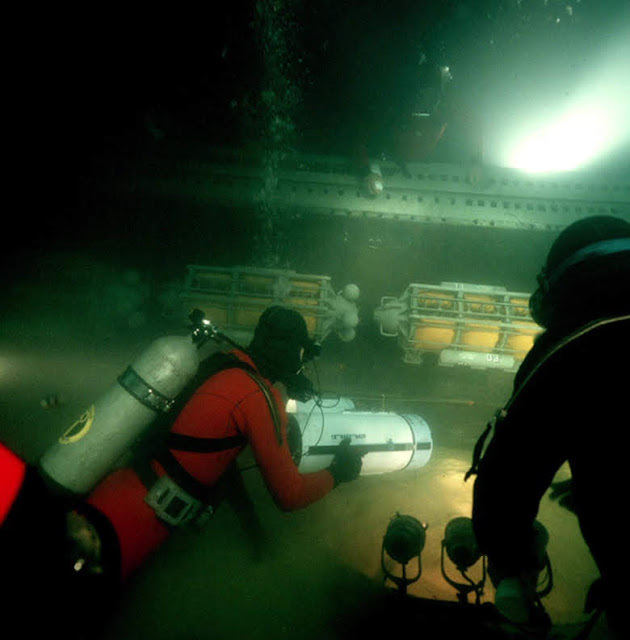 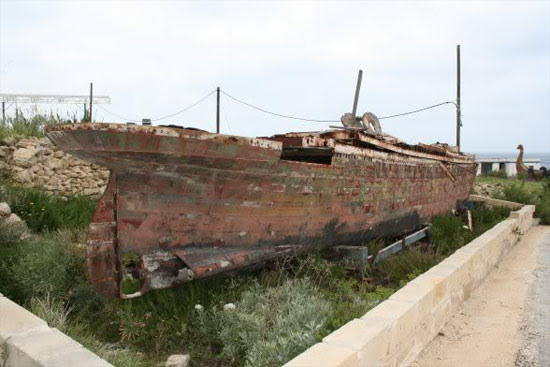 A new deep water tank was constructed by the production for the underwater shots on adjacent land purchased expressly for it by the Maltese Government. 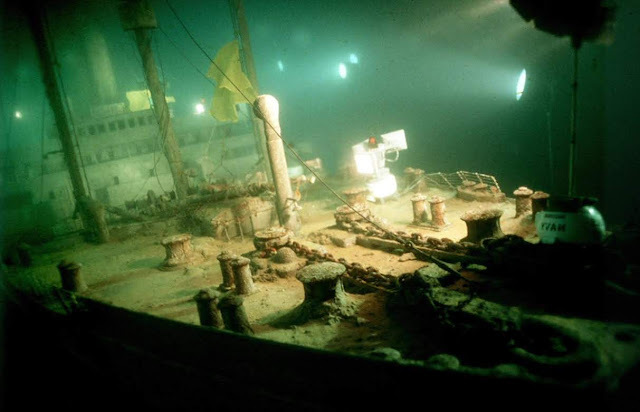 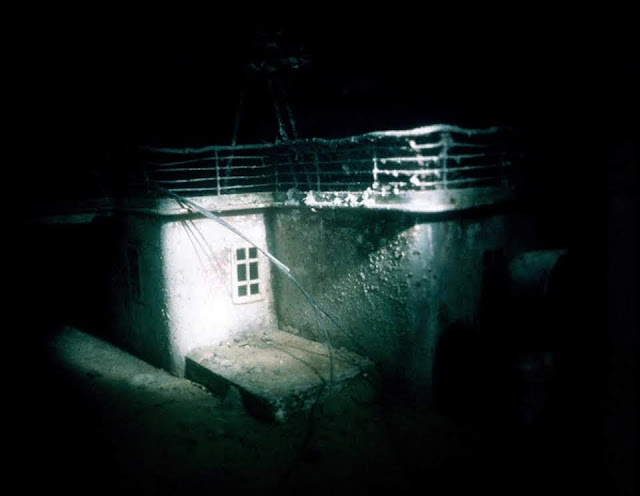 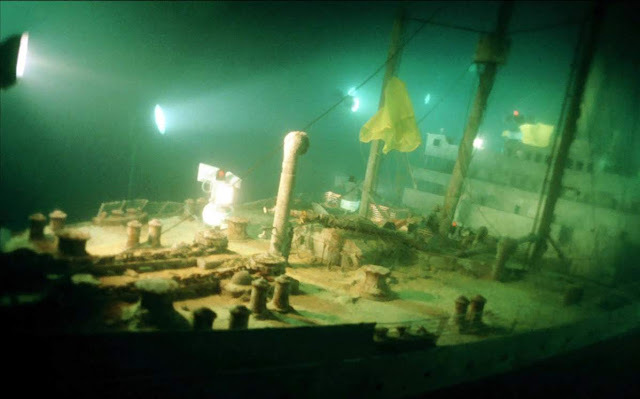 The deep water tank was about 39 feet (12m) deep and had a 90 foot (27m) diameter turntable on the bottom in the center on which rests the Titanic model and some miniature sea bed. 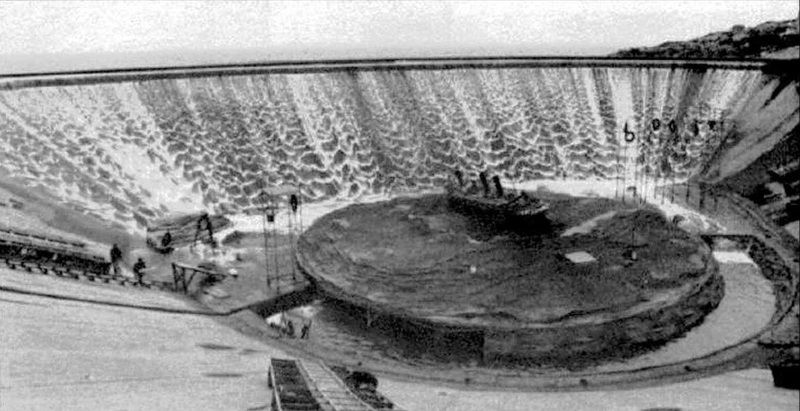 At the time it took 24 hours to fill it with 9 million Gallons (34068 m3) of seawater. 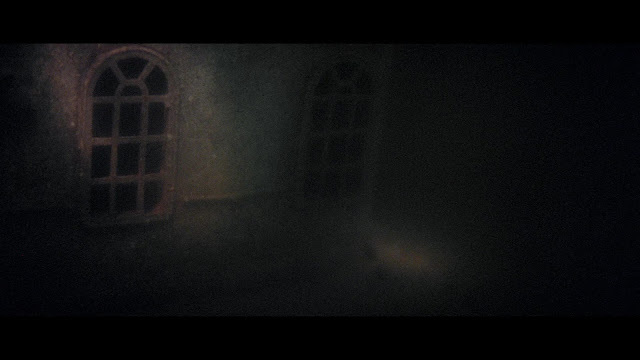 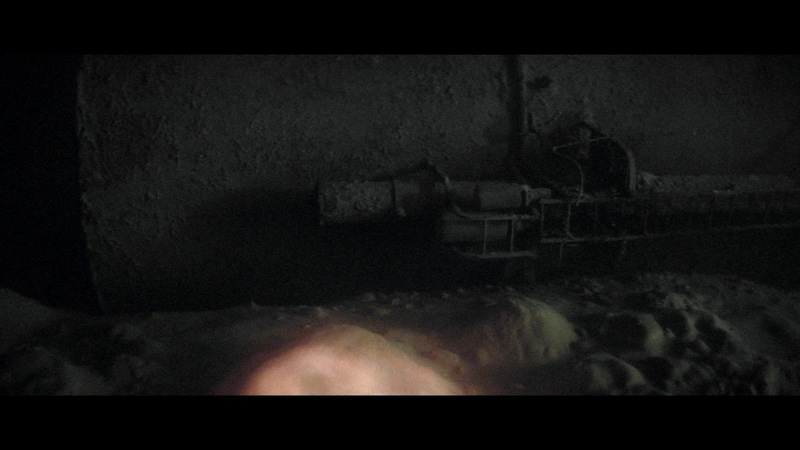 Deep tank being filled with Titanic model in position on sea bed floor miniature. 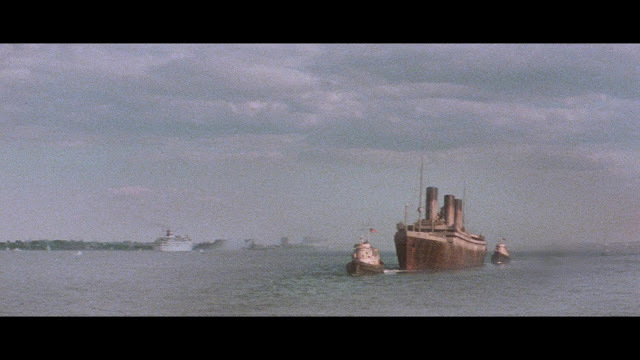 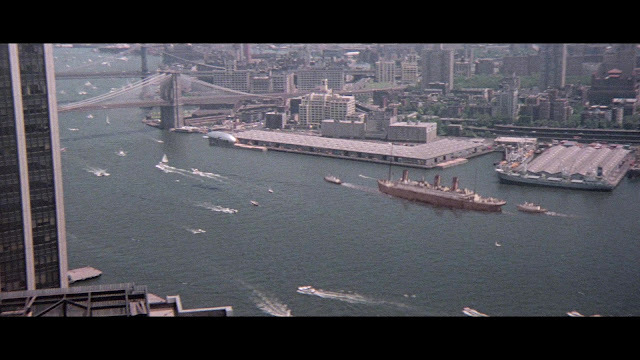 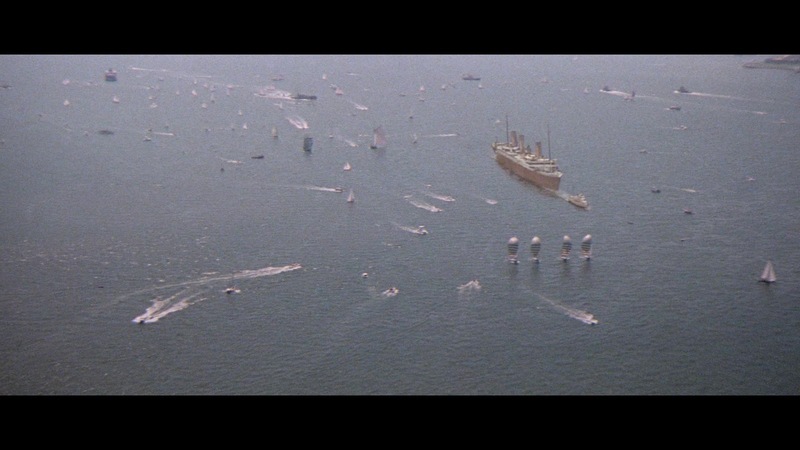 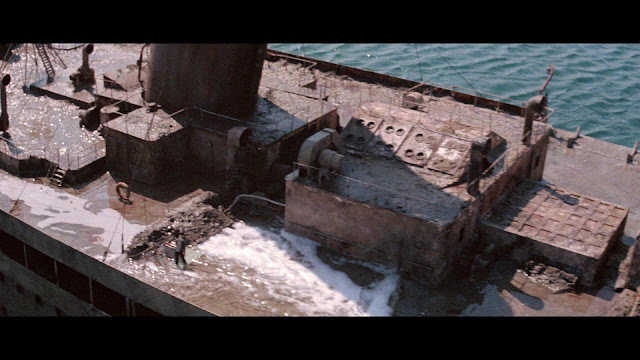 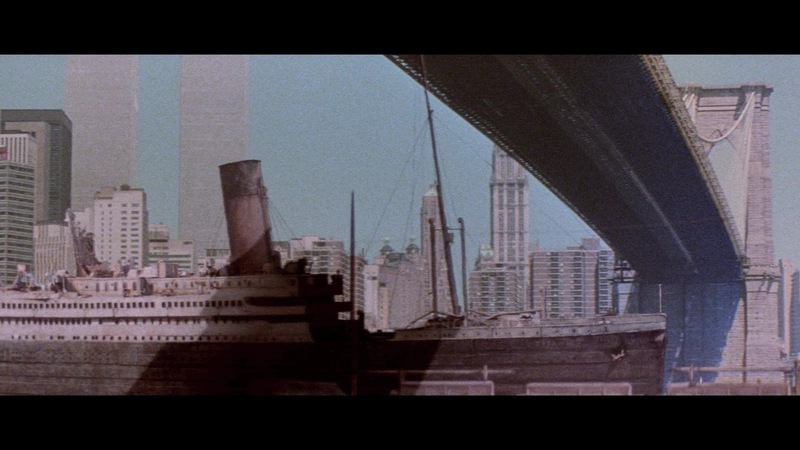 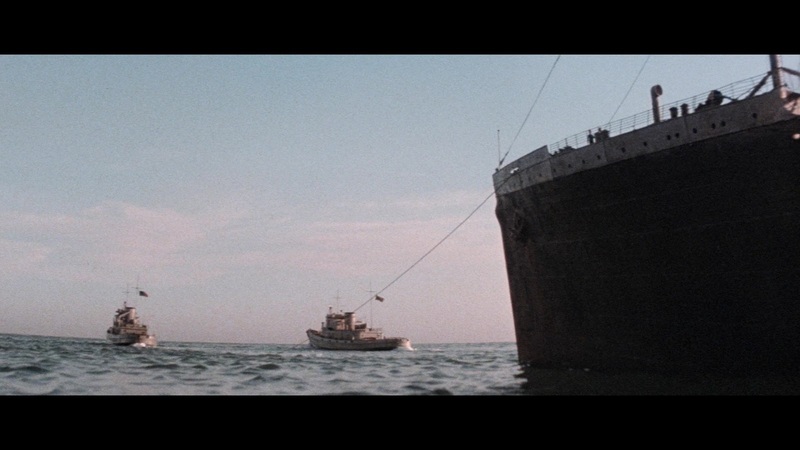 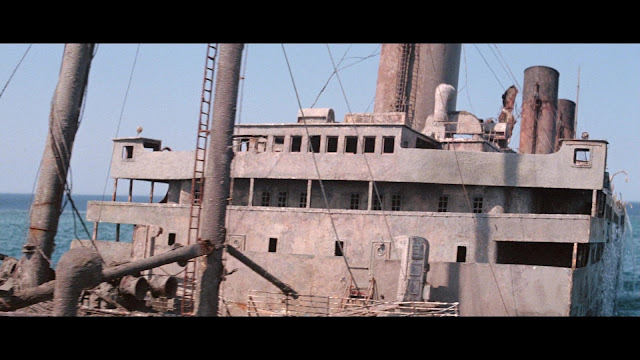 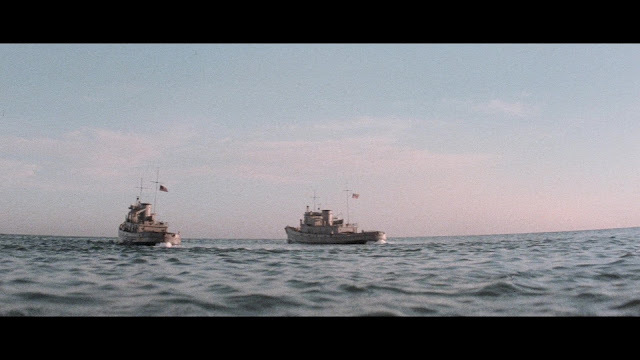 There are a couple of matte painted shots of the ship being towed into New York harbor which are not as successful as the miniature shots. 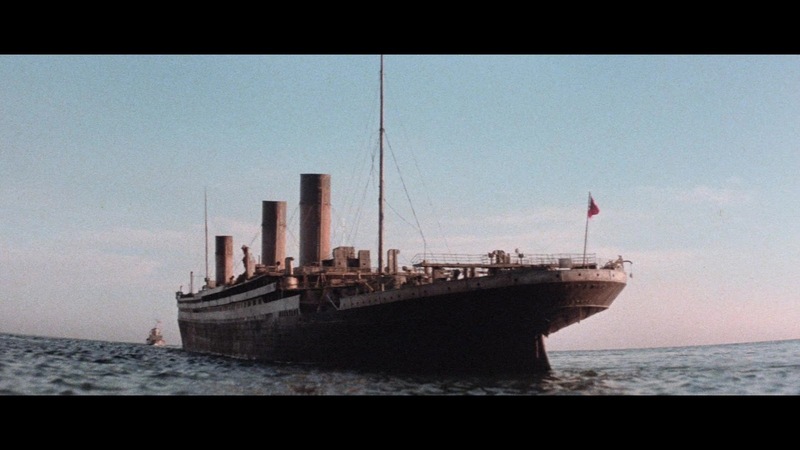 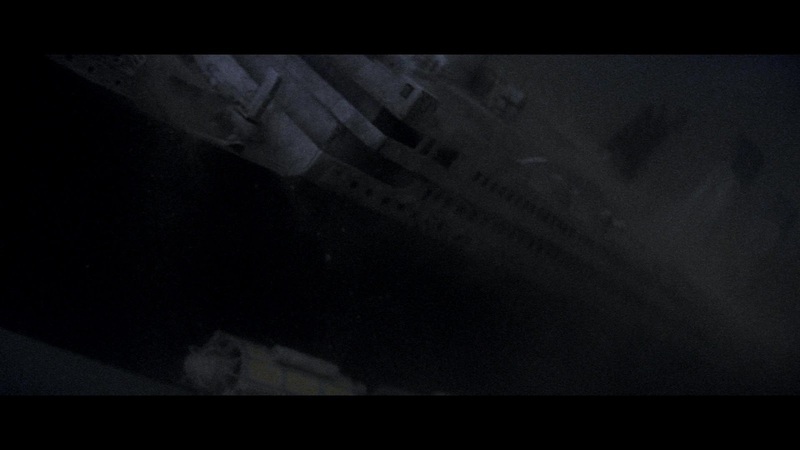 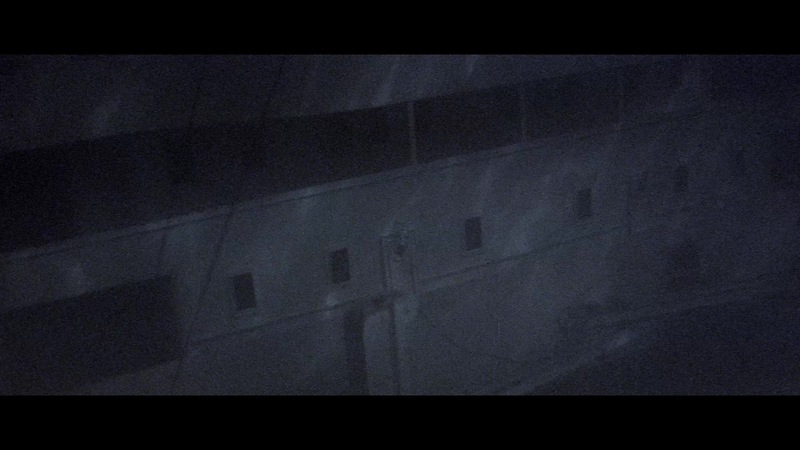 In these shots the titanic is either a painted matte of a photographic cut out matted into the live action scene. 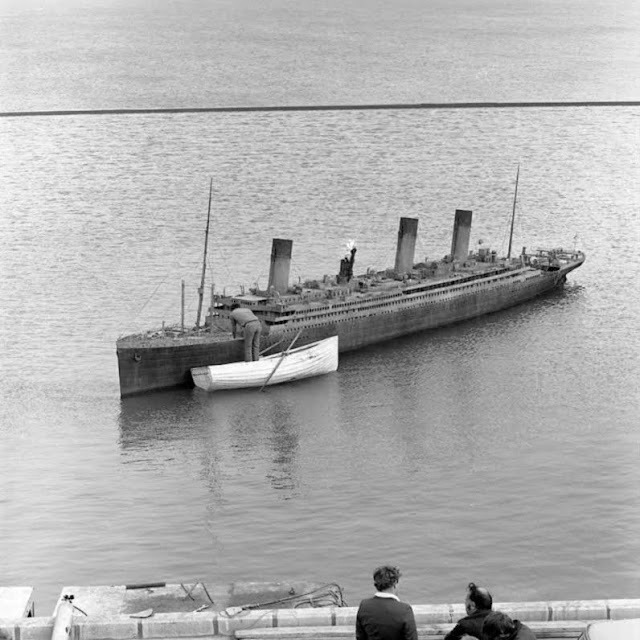 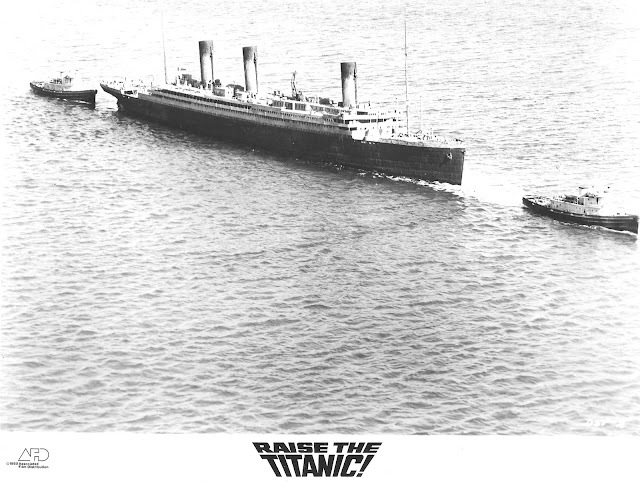 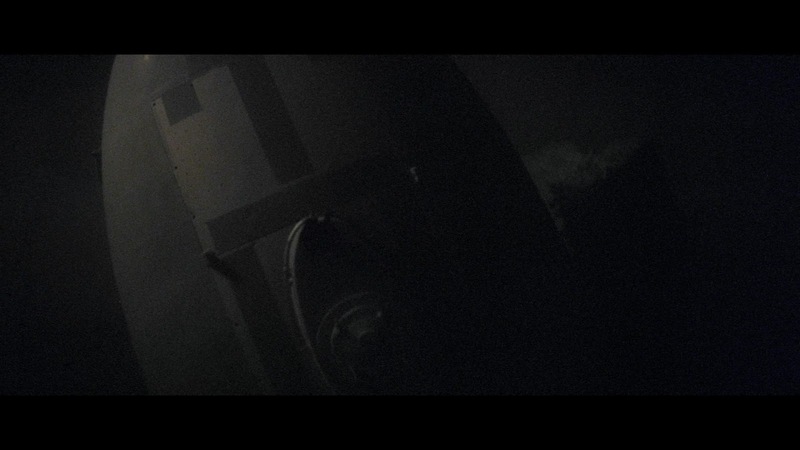 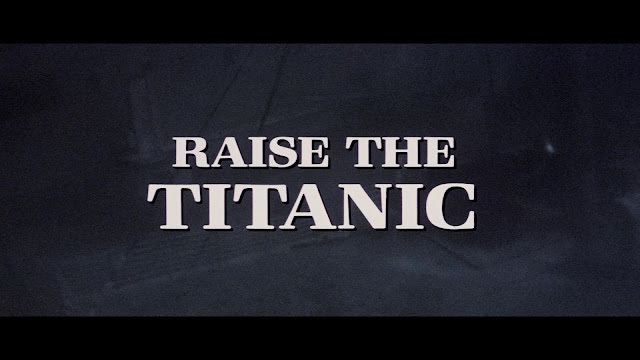 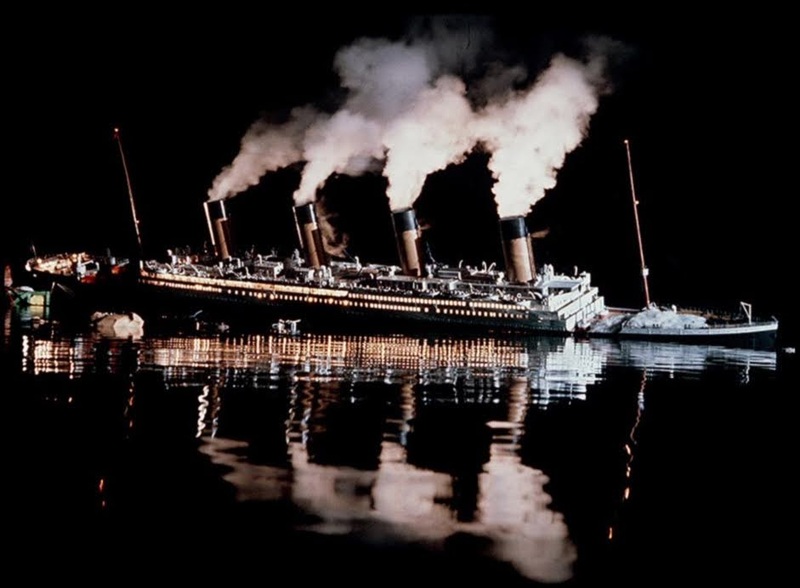 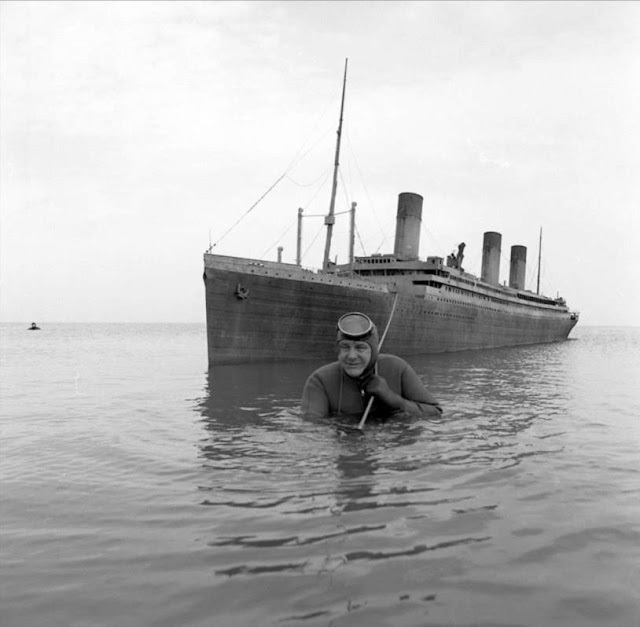 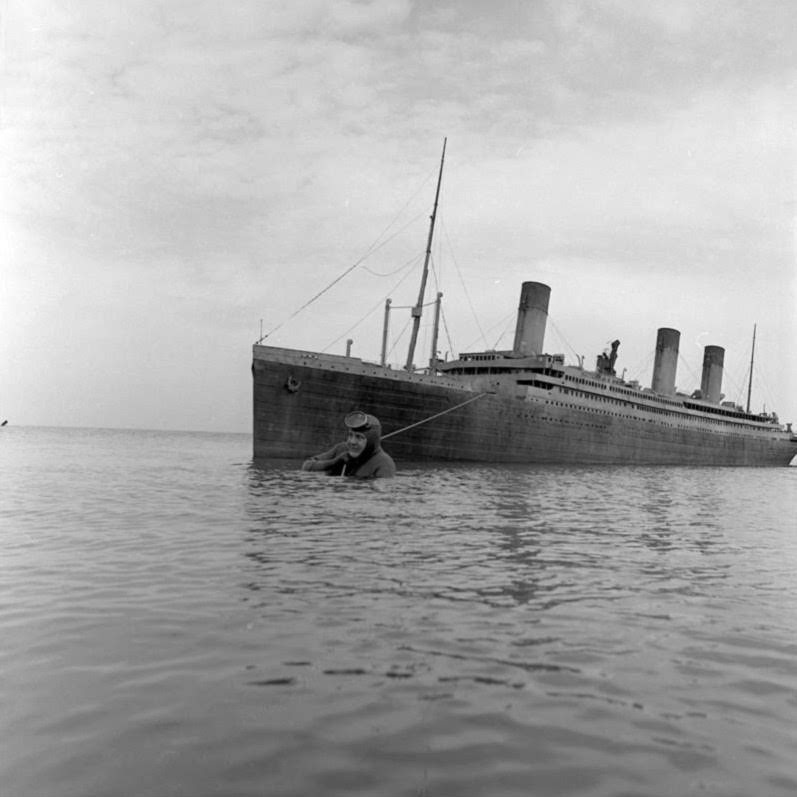 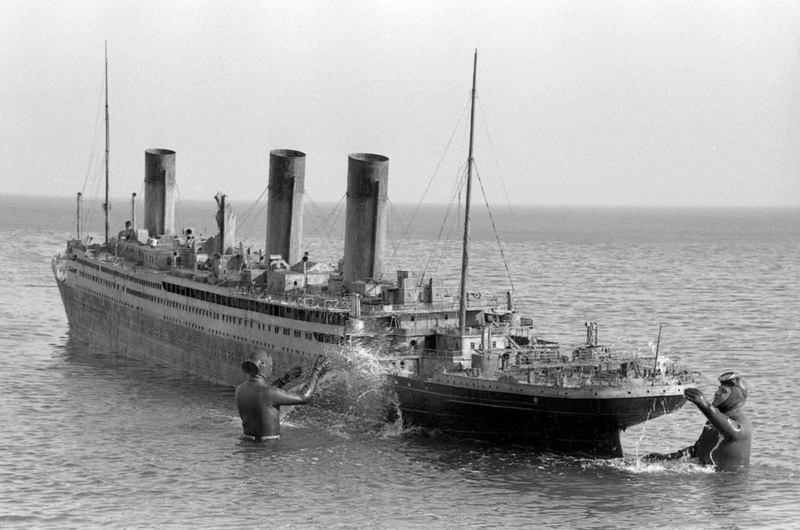 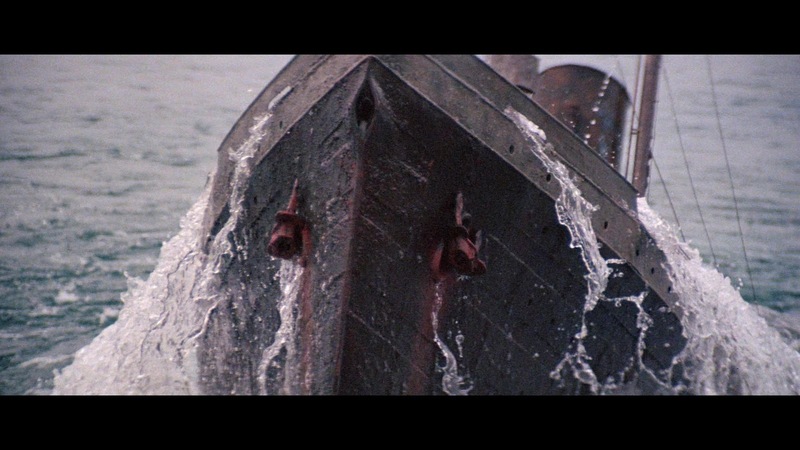 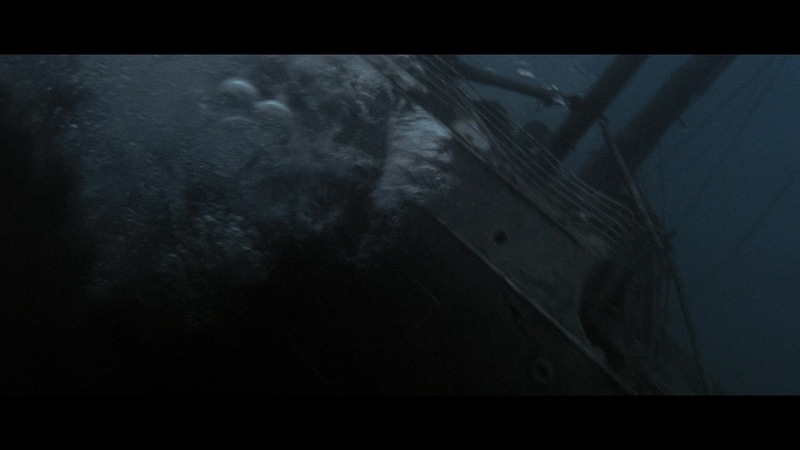 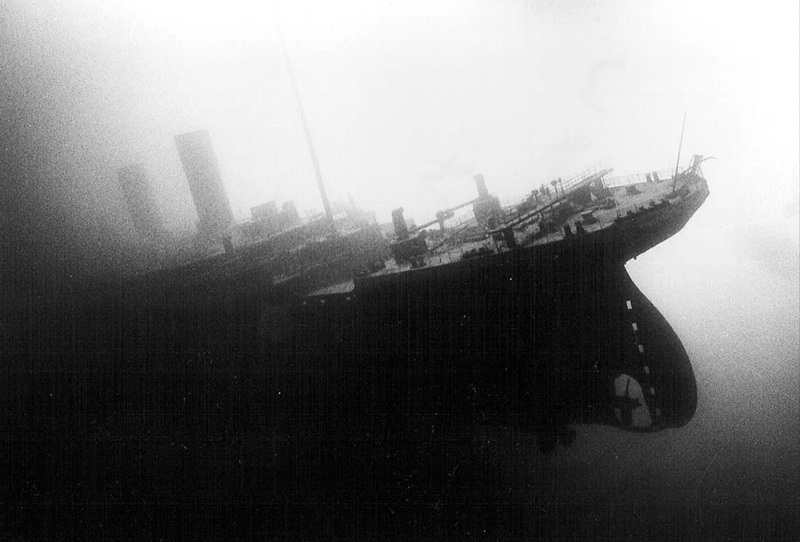 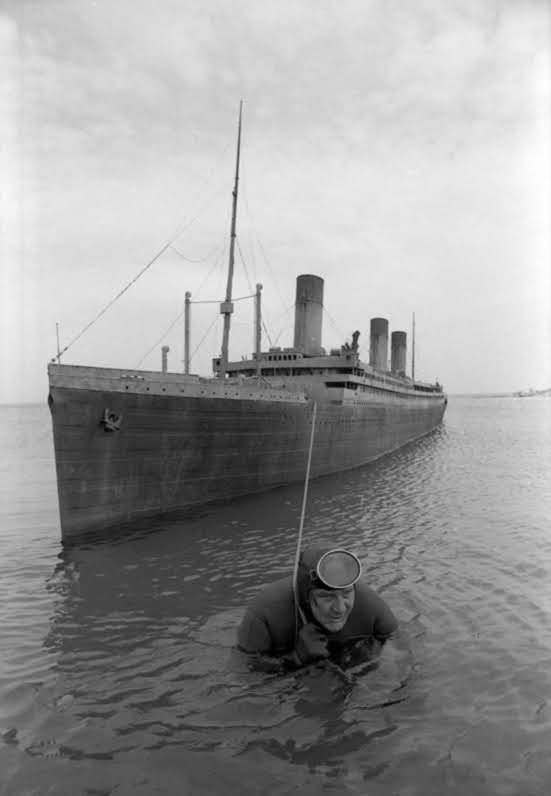 There was a sequence of the sinking of the Titanic shot with the big miniature first. The model was originally finished with a pristine paint job, outfitted with interior lighting and had all its funnels intact. 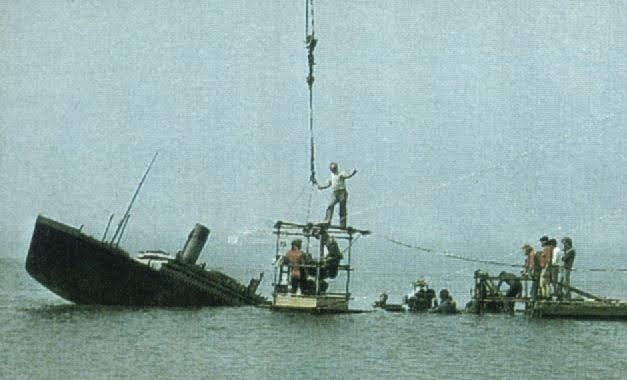 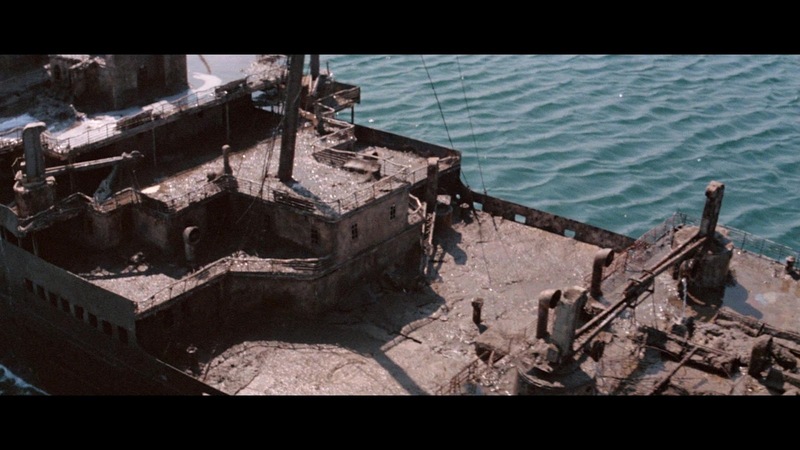 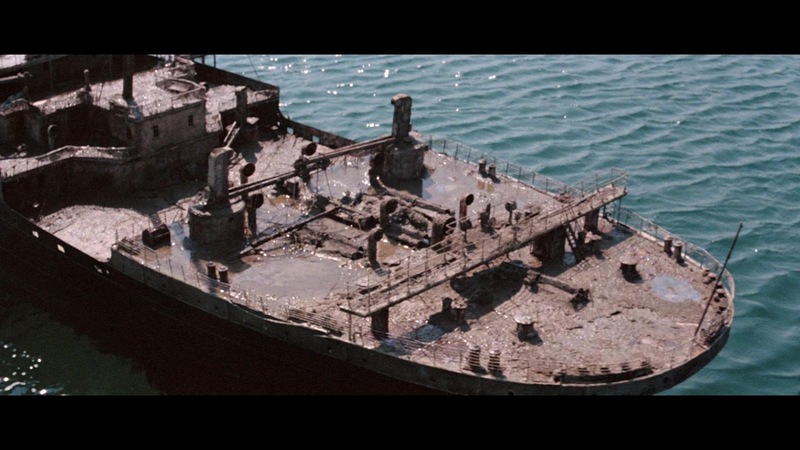 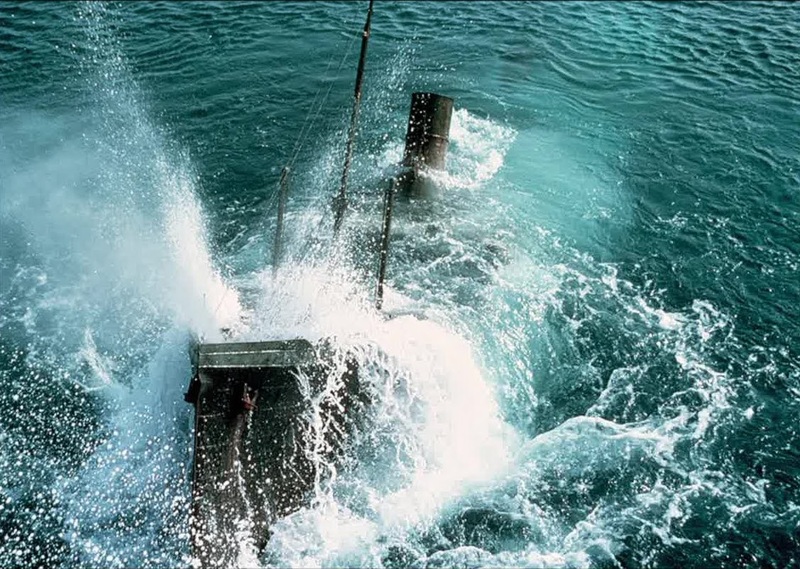 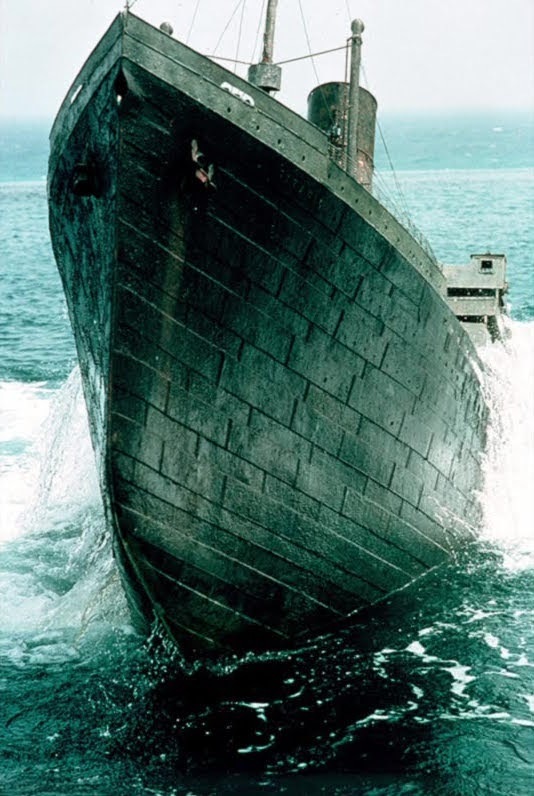 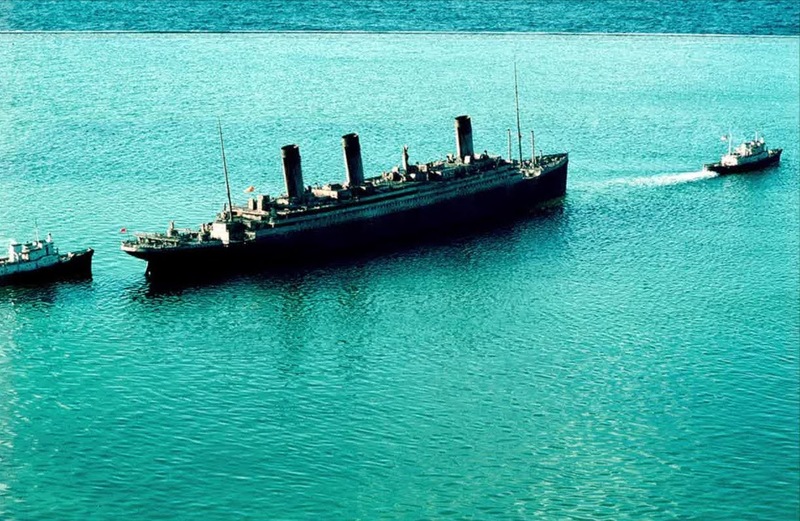 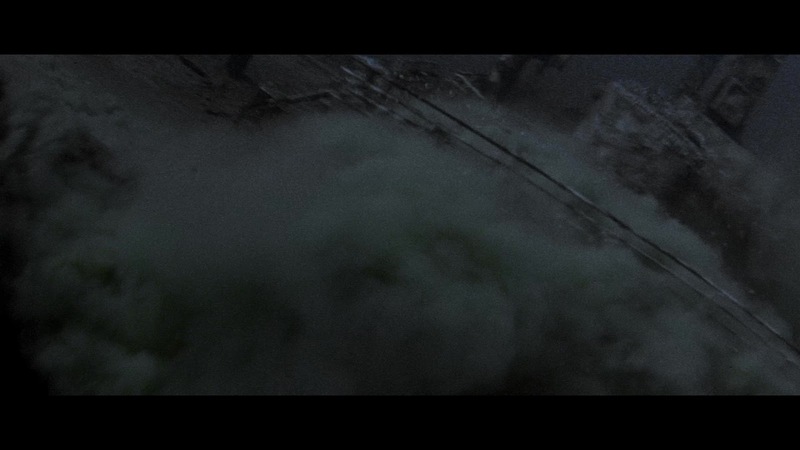 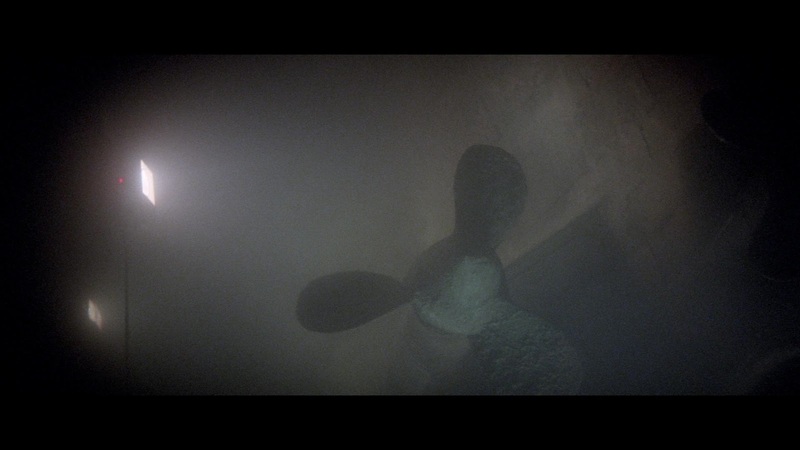 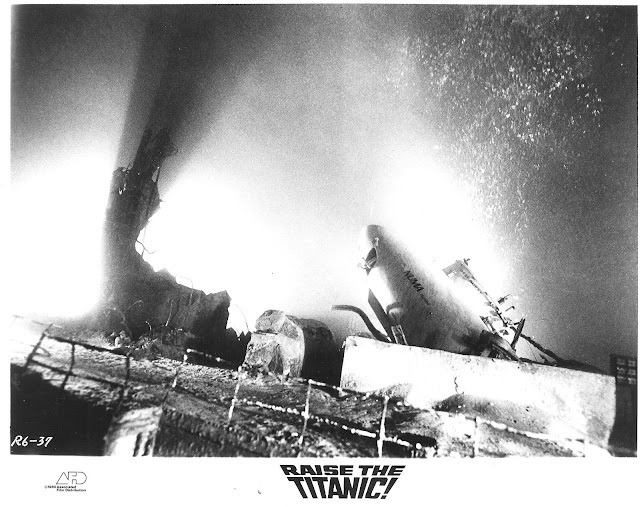 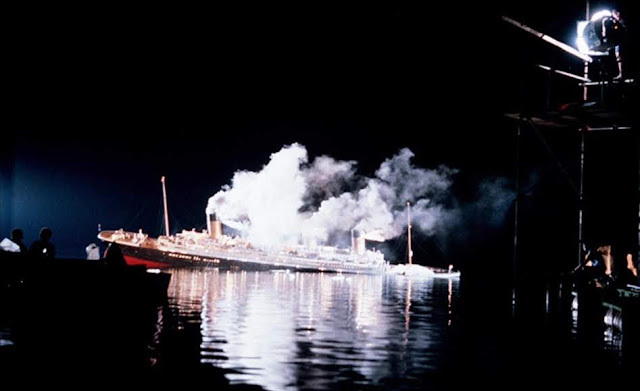 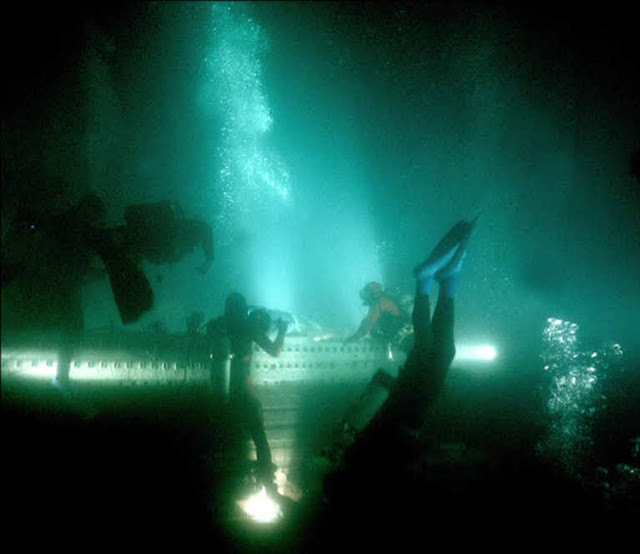 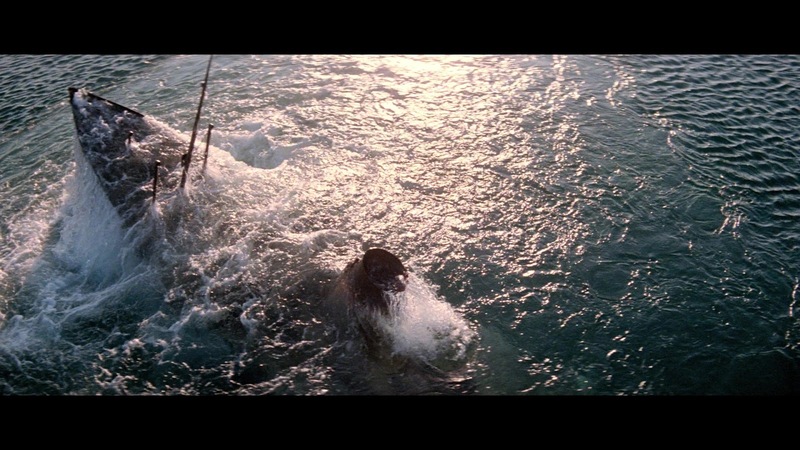 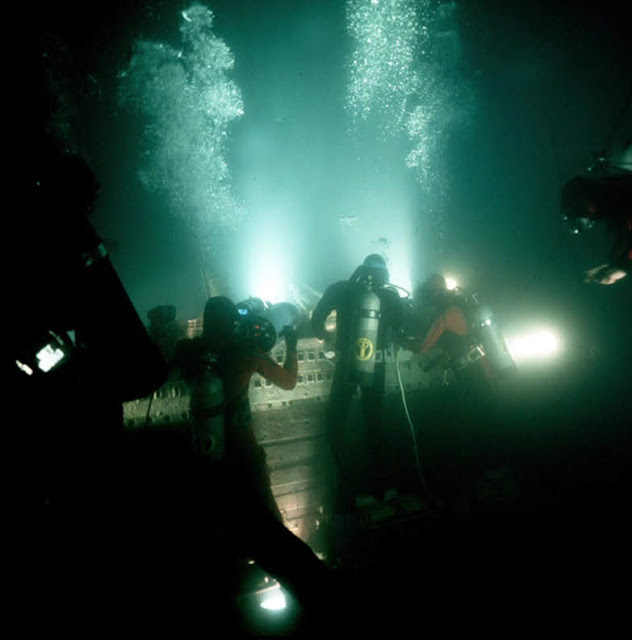 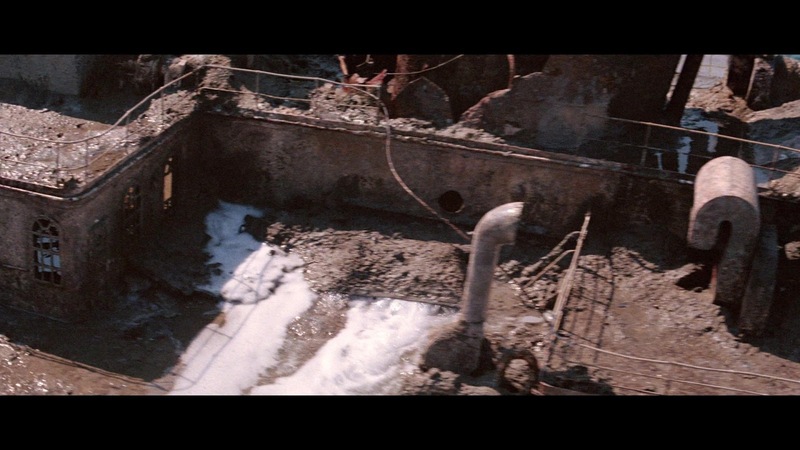 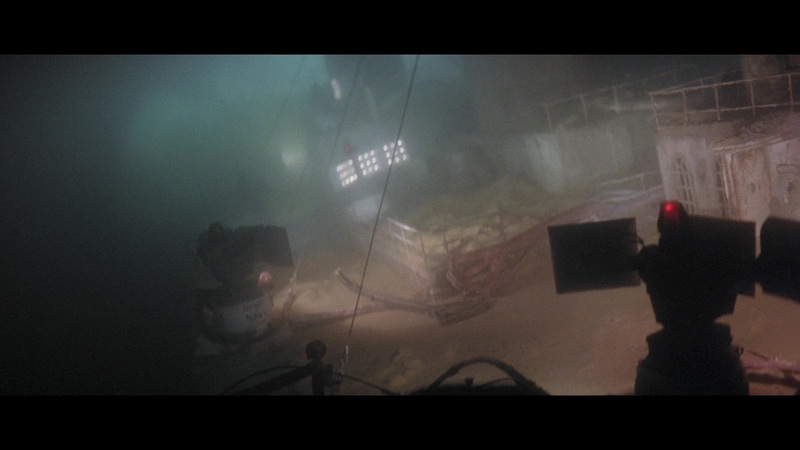 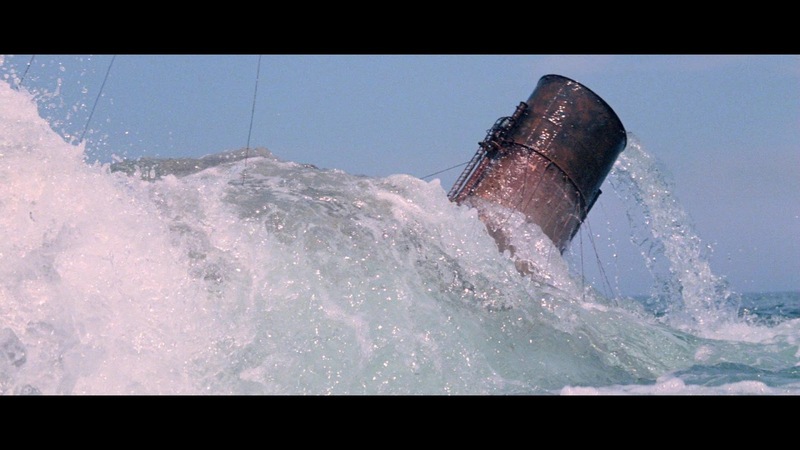 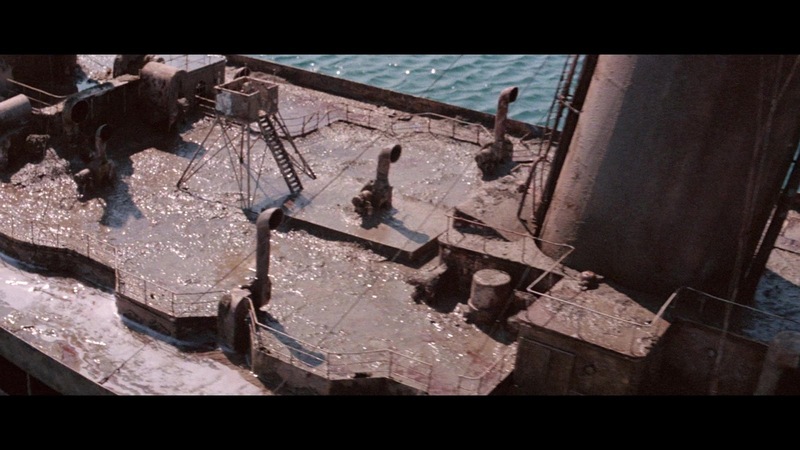 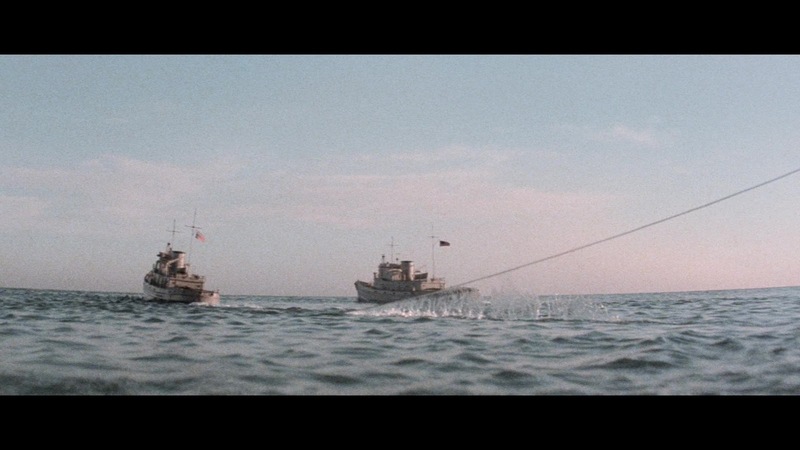 After these scenes were completed it was converted into the wreck version we see in the film. 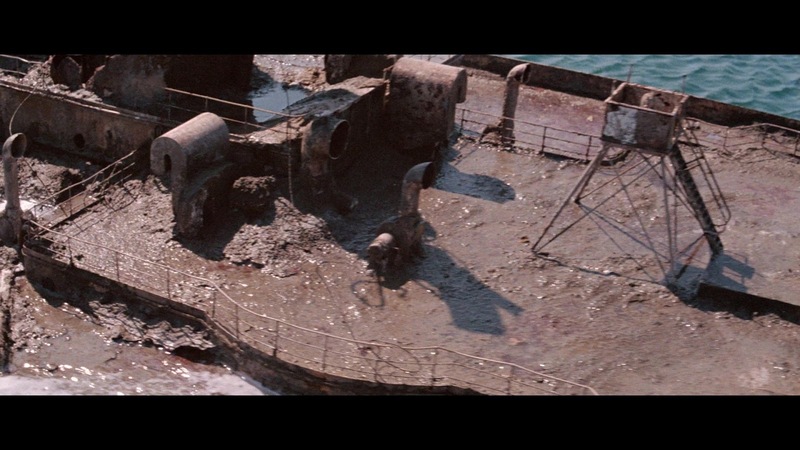 Unfortunately, this sequence was cut from the film. 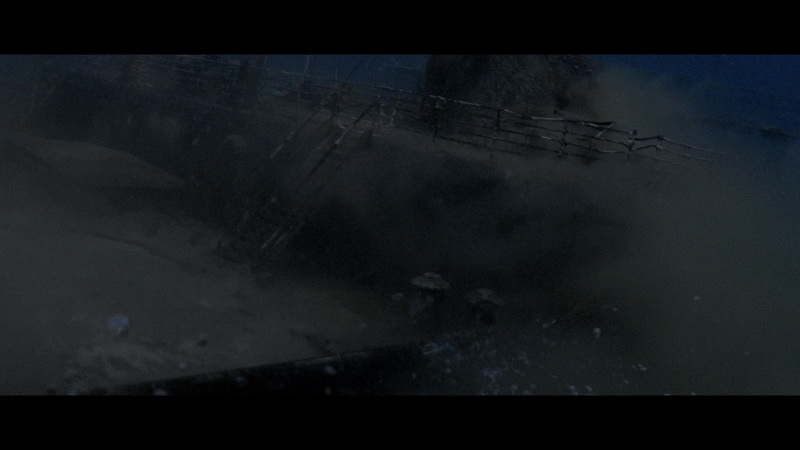 Sadly the miniature has just been left outside to slowly disintegrate in the weather since 1980. 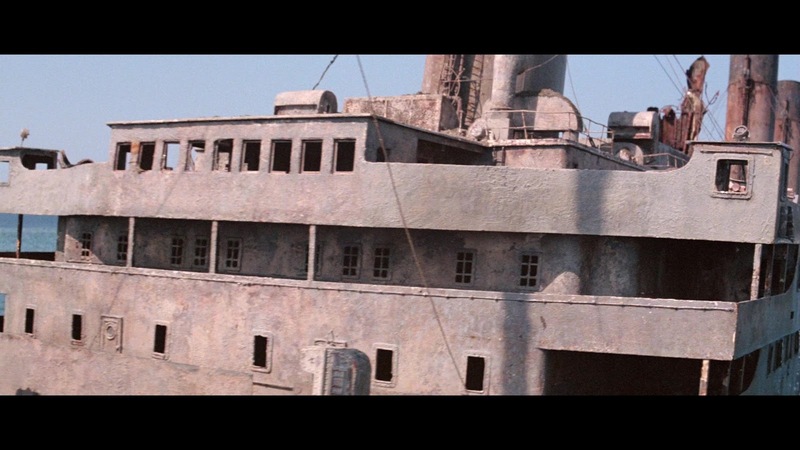 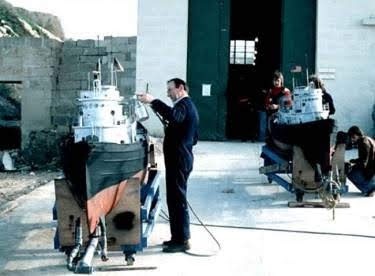 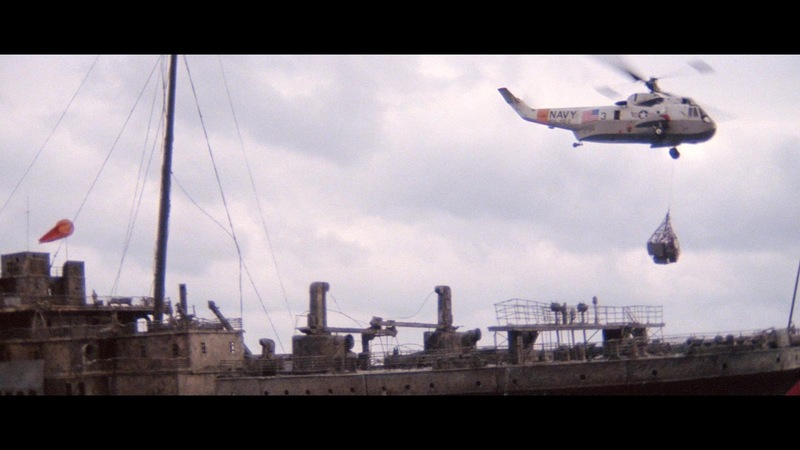 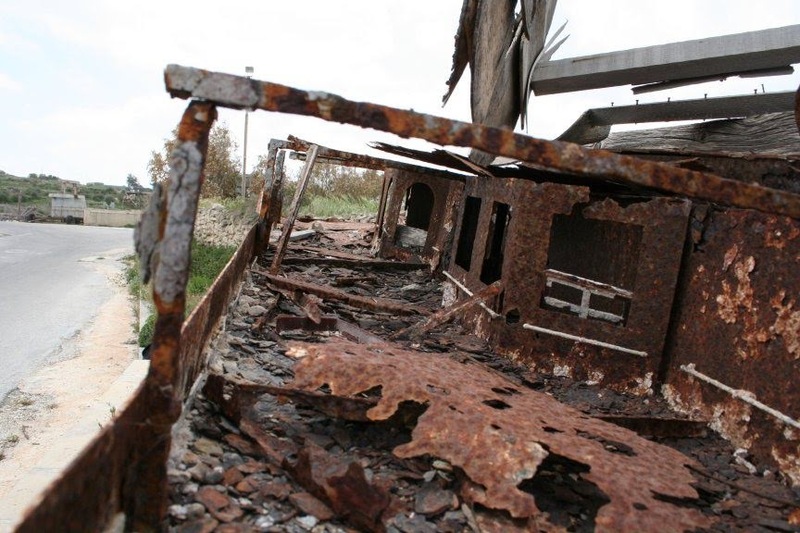 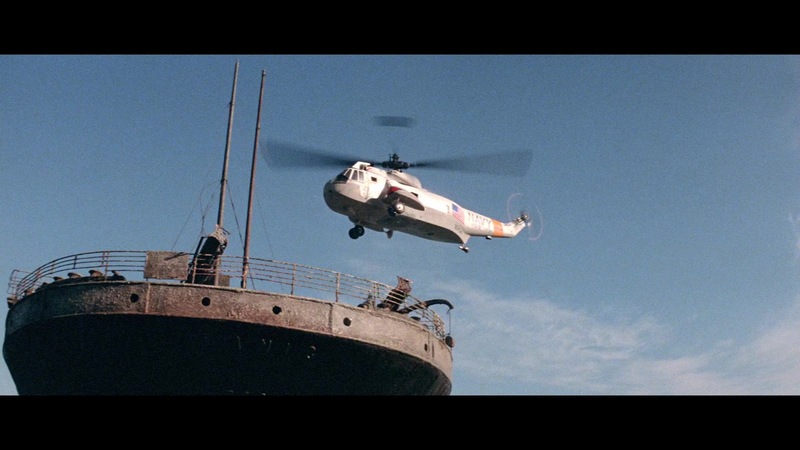 At one point it was repainted as a hospital ship, white with red crosses on the side, and used for a few shots in a production, though even that paint job has totally deteriorated. 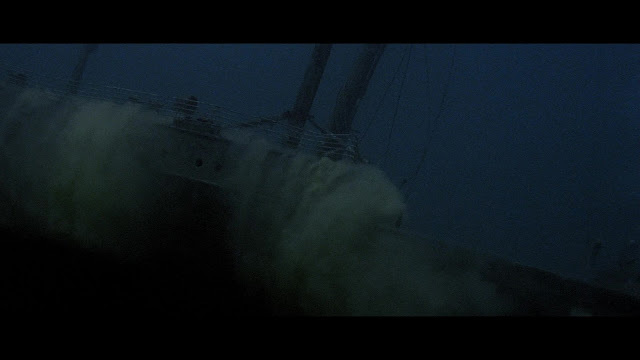 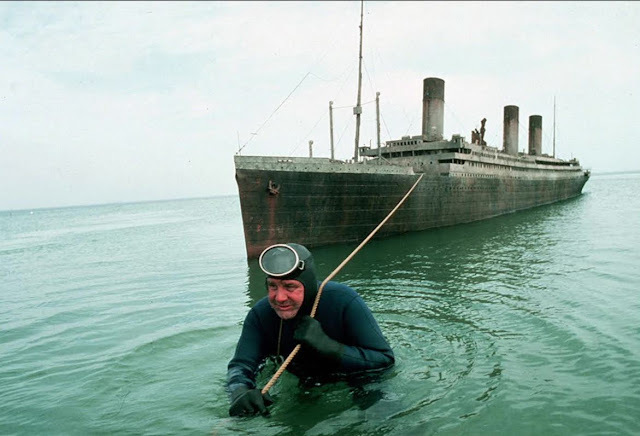 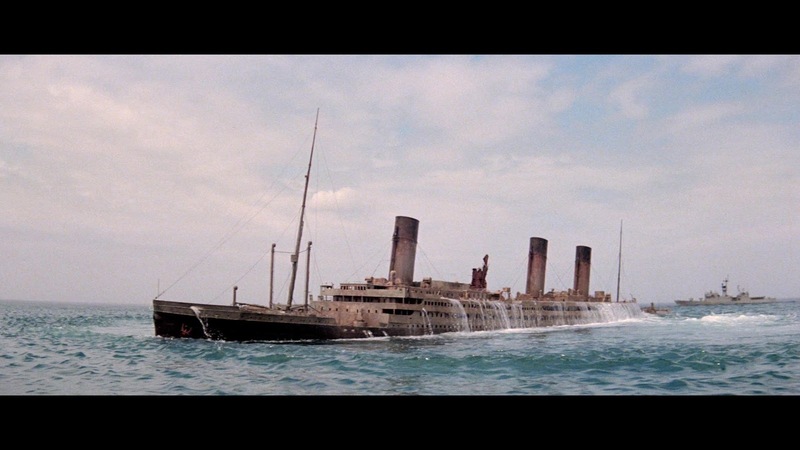 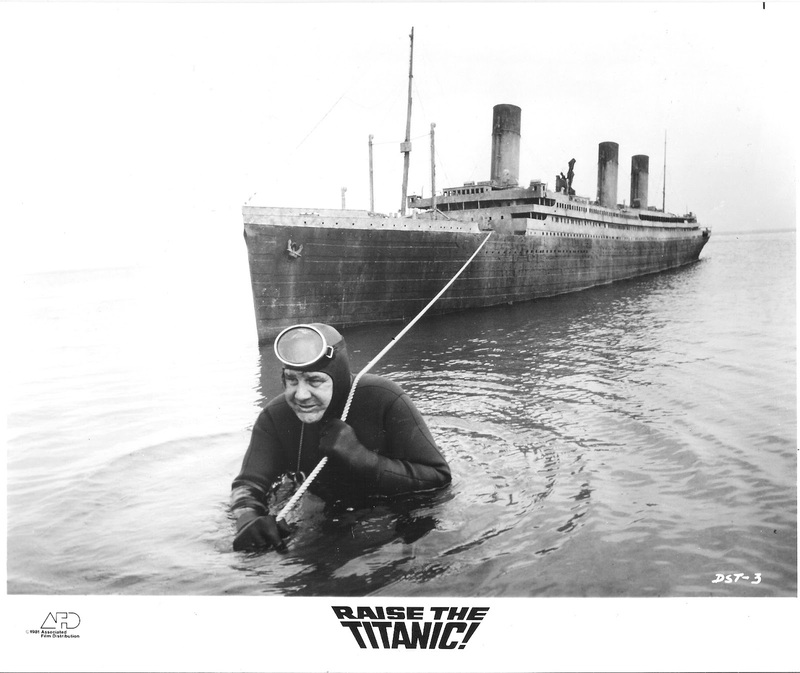 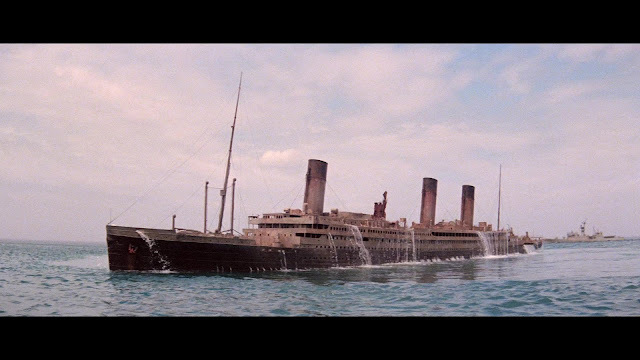 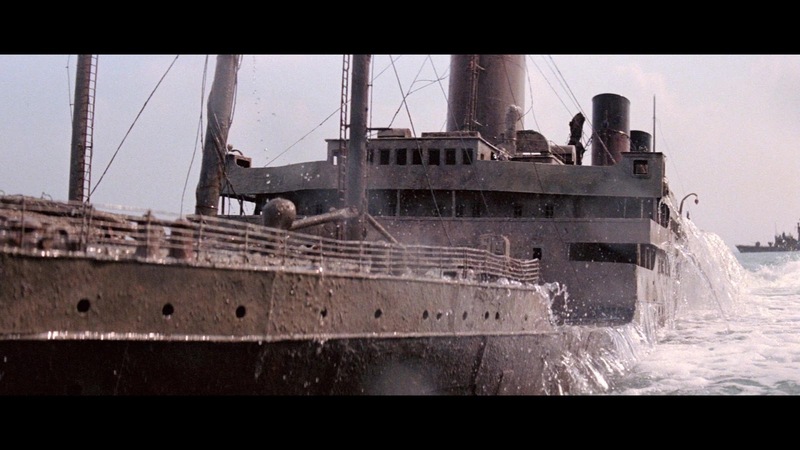 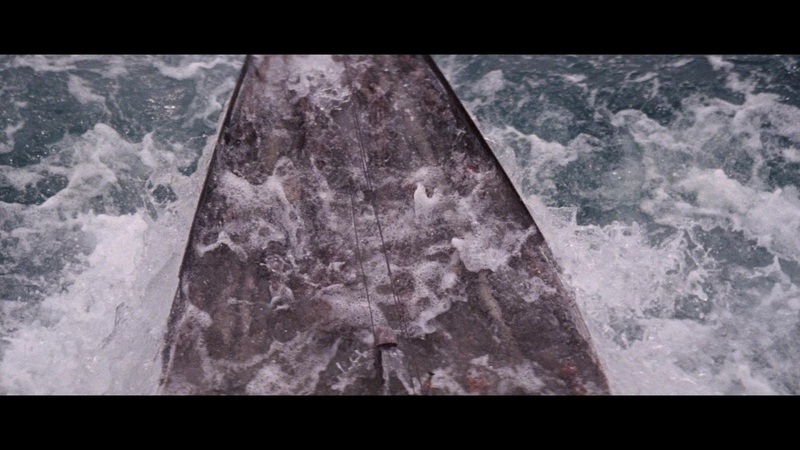 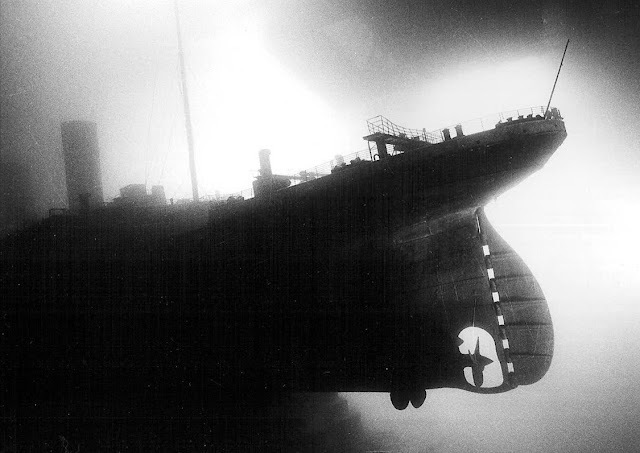 Still photographs fail to capture the magic of the 360 fps high speed footage of the surfacing sequence, but Raise the Titanic has just been released on Blu ray so you are now able to see it in all its glory. 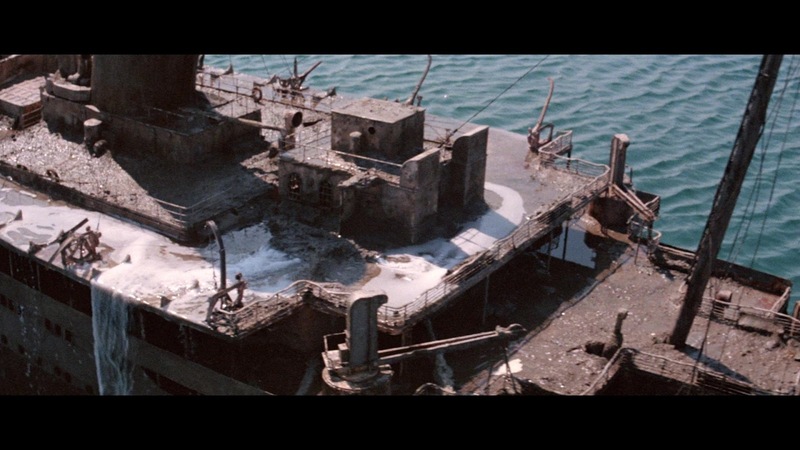 The larger proportion of the images in this post are taken from the Blu Ray release courtesy of Network Distributing ltd, Rex Pictures & Jonathan Smith. There is an irony that 35 years out in the weather has reduced parts of this model to looking very much like the actual ship, at the bottom of the Atlantic. I'm sure the hospital ship paint job was used to depict Titanic's sister, Britannic, which was sunk while serving as a hospital ship in the Agean in World War I. 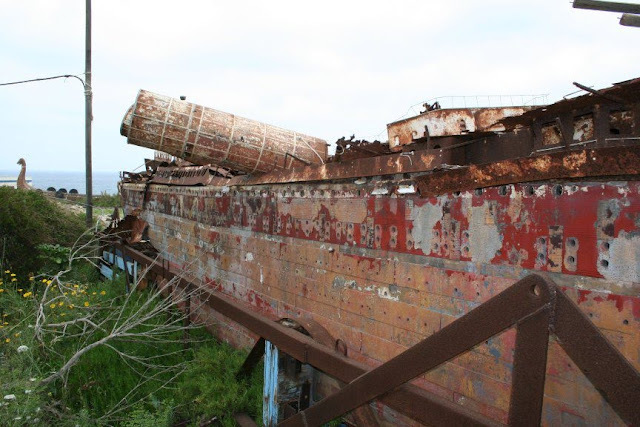 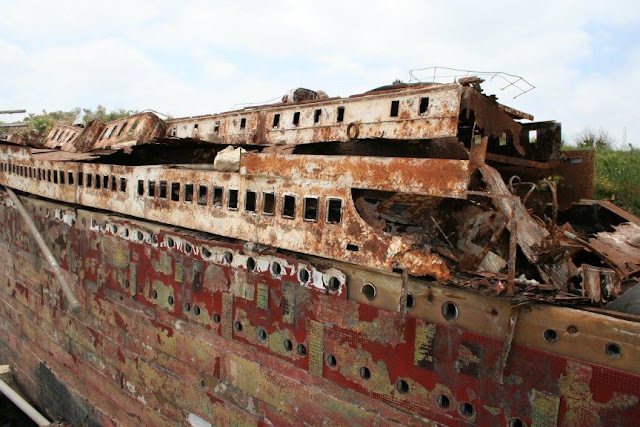 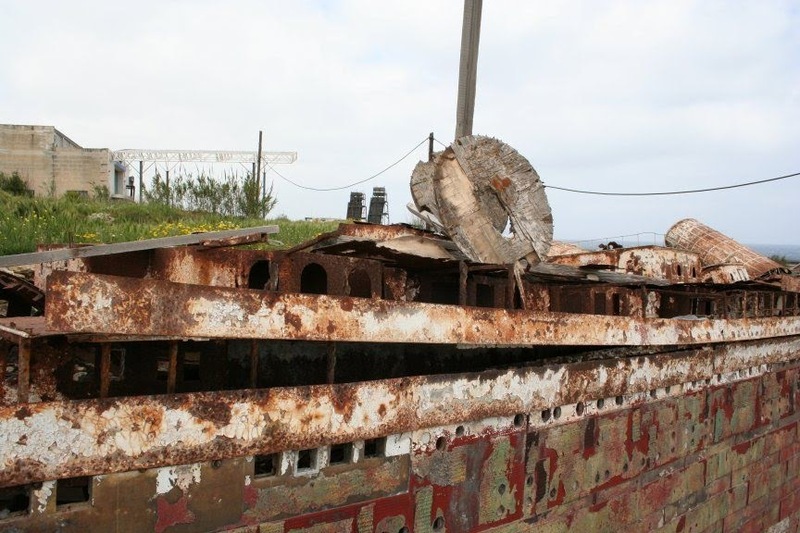 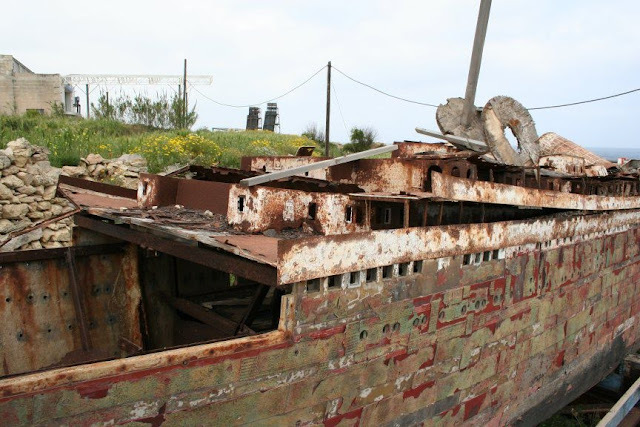 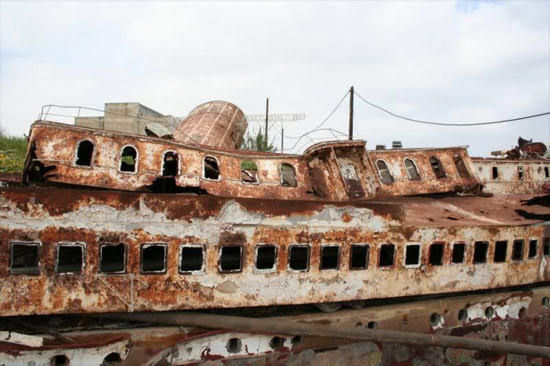 The model in it's present day condition looks as if the real Titanic were in a scrapyard.I suppose,in a way,this is a tribute to the model builders. 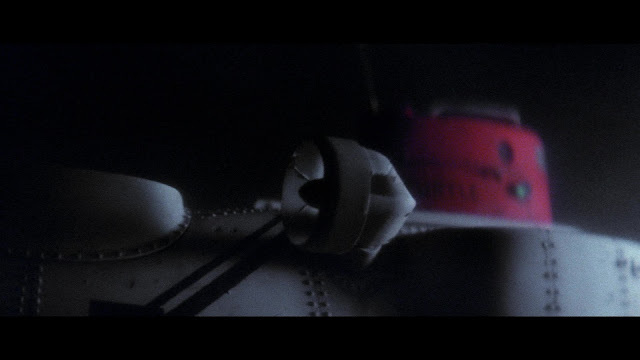 During the long pass over the Titanic model, after it has been raised, watch out for the tiny figure of a man working a pump. 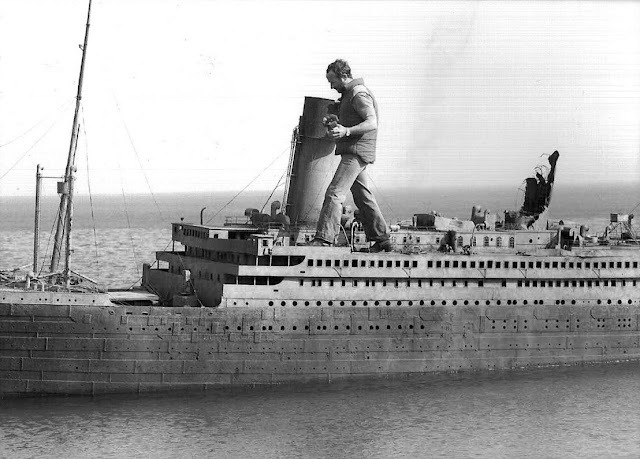 Some people think it's a joke, but my feeling is that - like John Richardson's work on NORTH SEA HIJACK - the mini-man is there to add a touch of motion to the model (during the subsequent dialogue, the characters talk about pumping the water off the ship). 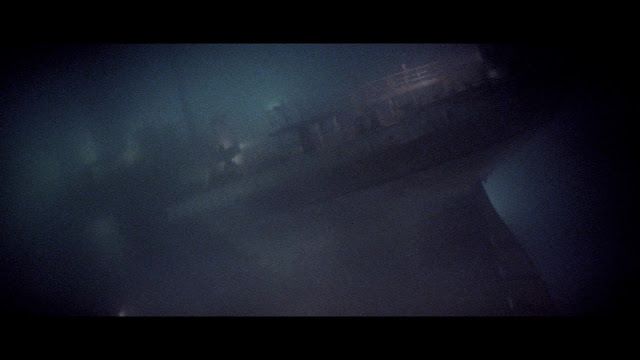 I didn't notice the man, I'll have to go and have a closer look. 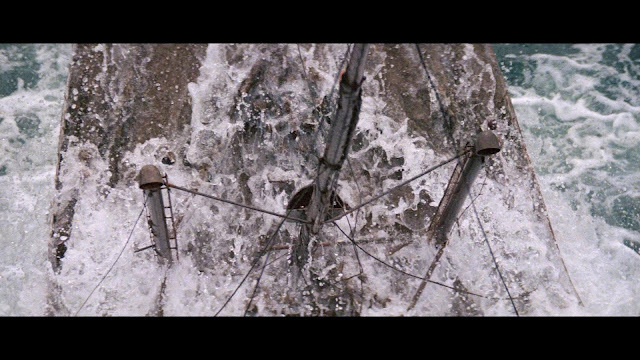 Thanks for the tip off. 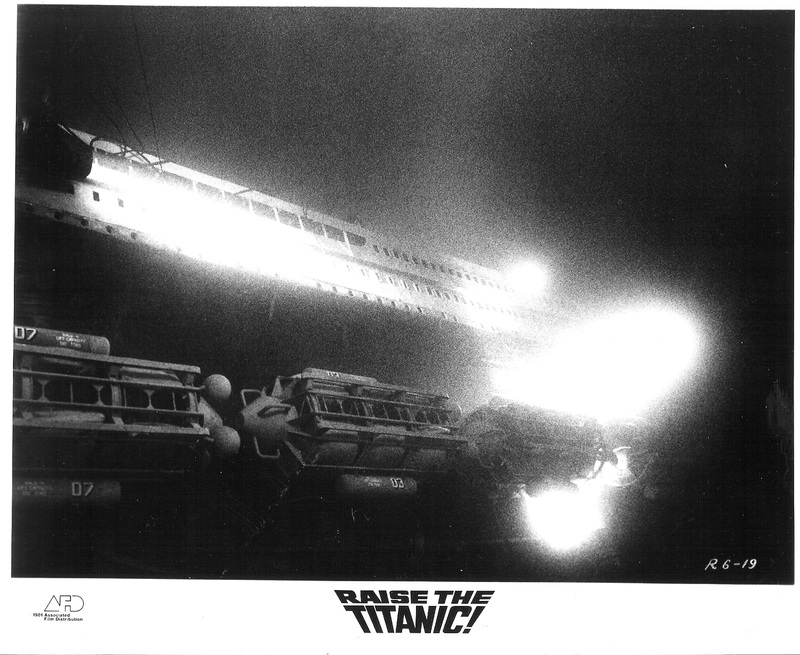 Always love the move did a beautiful job and hard work to make .my son love the Titanic he said to me no one makes a big one so i built him a ten foot model RC controlled it in my dinning room.have a video on you tube .if you would like to see it go to you tube .john caiati 10 foot titanic.thanks loved the photos. 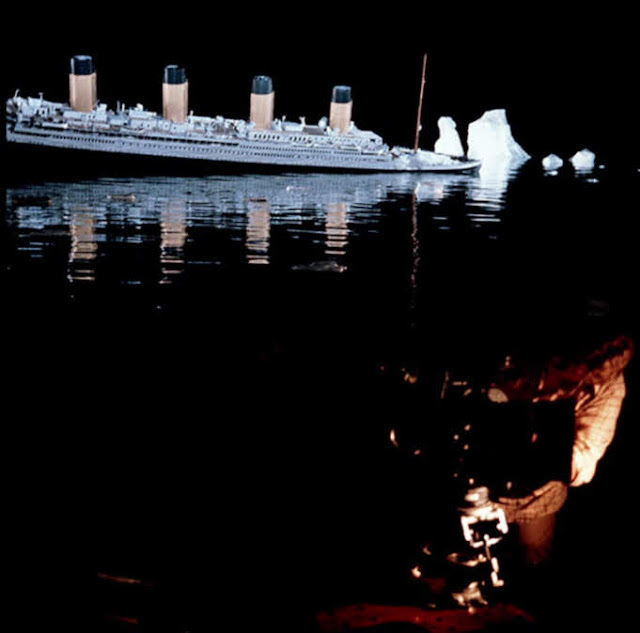 You ever heard of the movie the last voyage that film, made in 1960 not only wanted the audience to think the ship was real, It Was Real ! 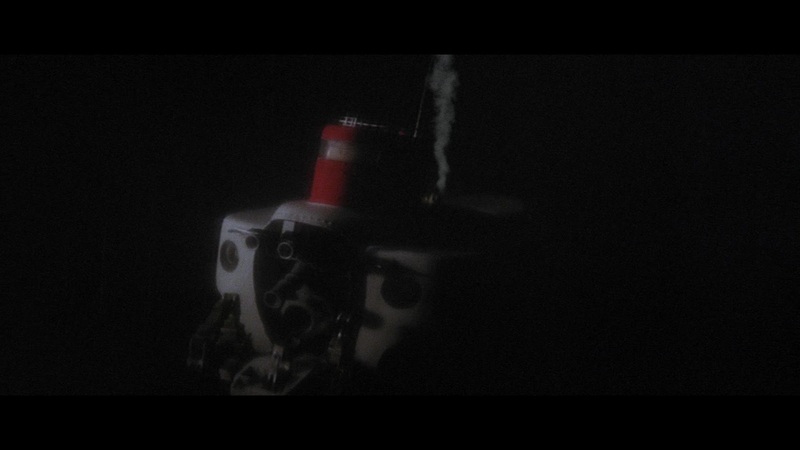 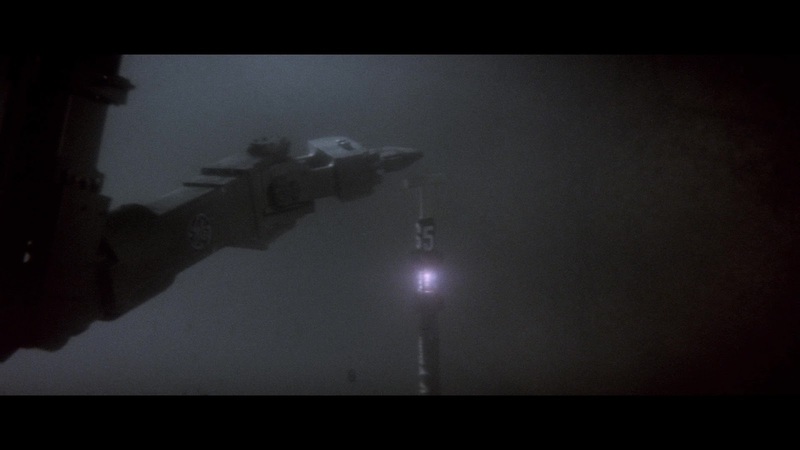 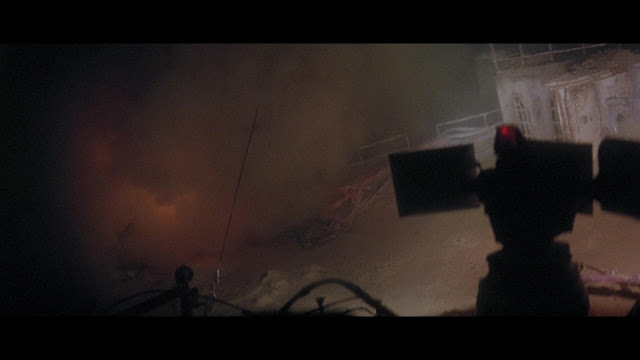 And as the back of the DVD case for the film points out "to add to the reality, that's no miniature vessel sinking into a backlot tank. 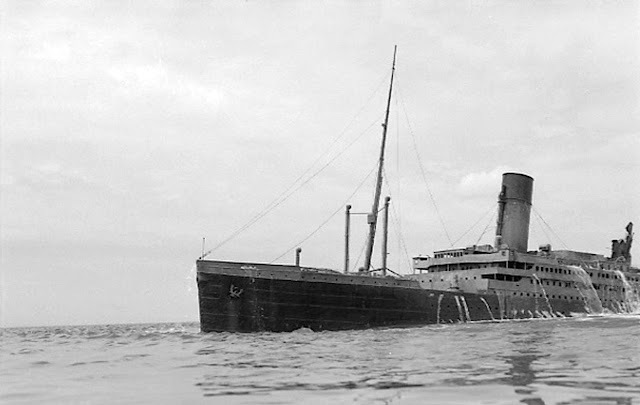 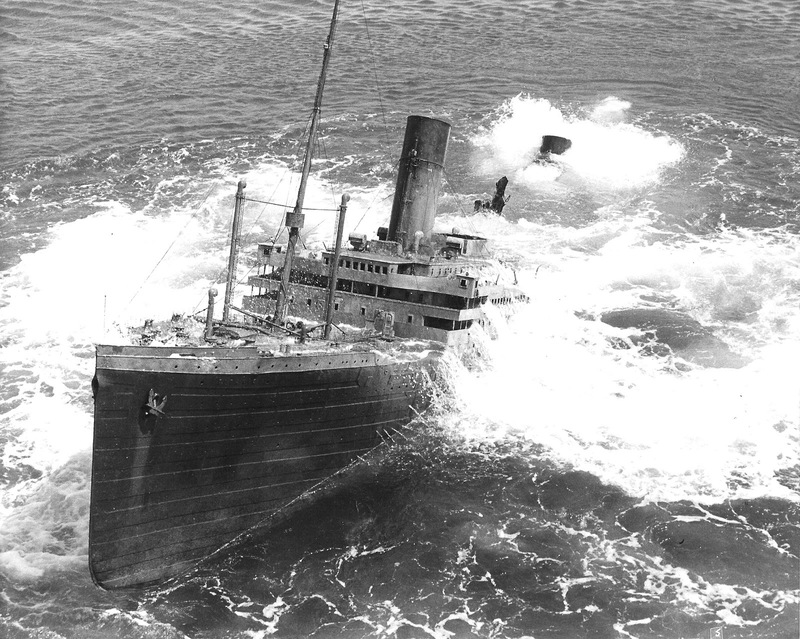 The famed lle de France plays the stricken ship. 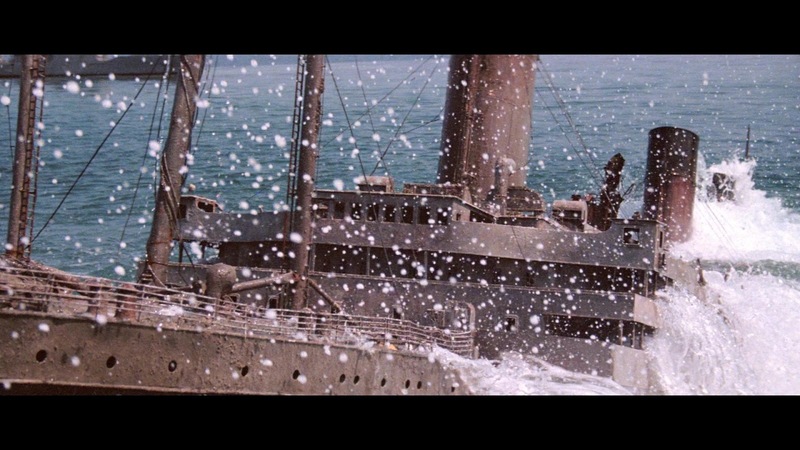 She made her first voyage in 1926 - and made her last voyage in this see-worthy spectacle." 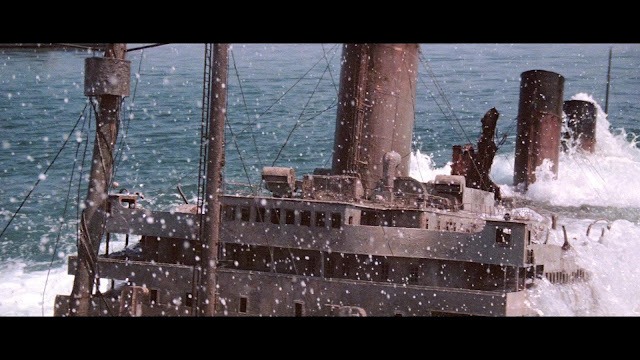 I too have noticed the man, but I think he was made for the shots of the ship sinking for the beginning of the film; like he was lowering a lifeboat. 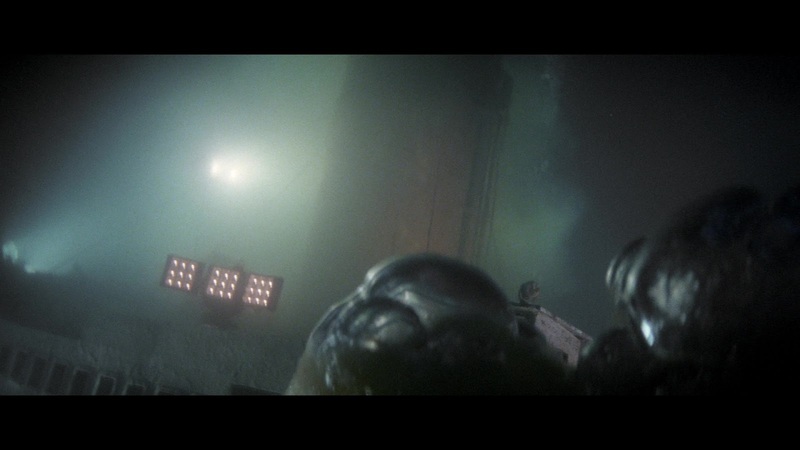 Either way, he shouldn't be there in the shot where he's seen. 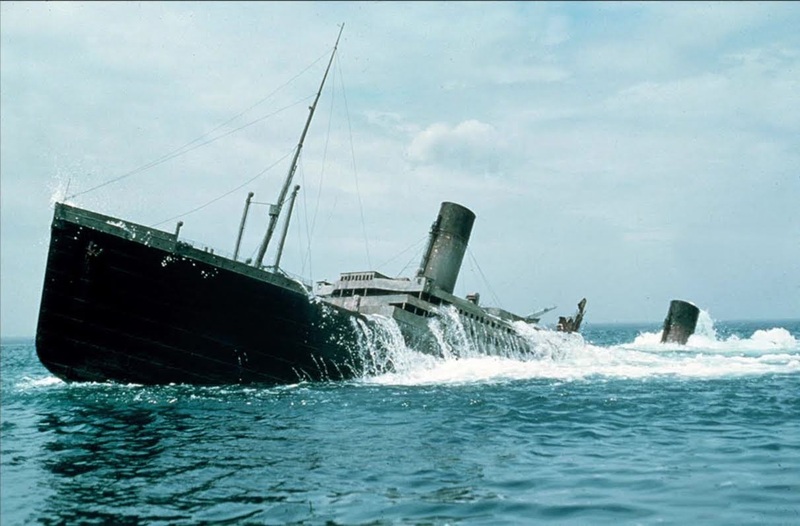 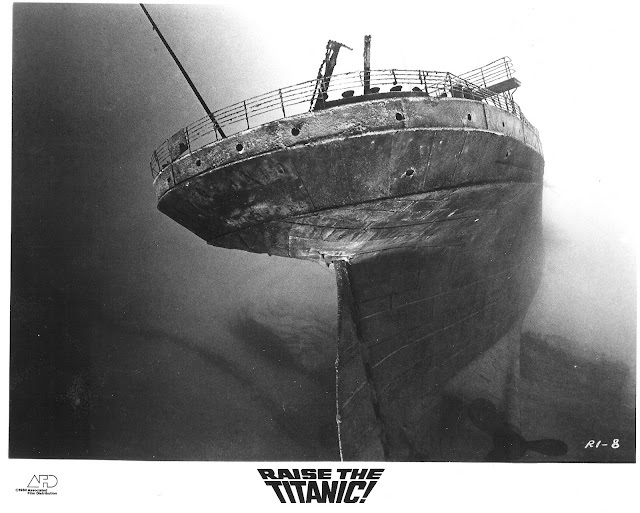 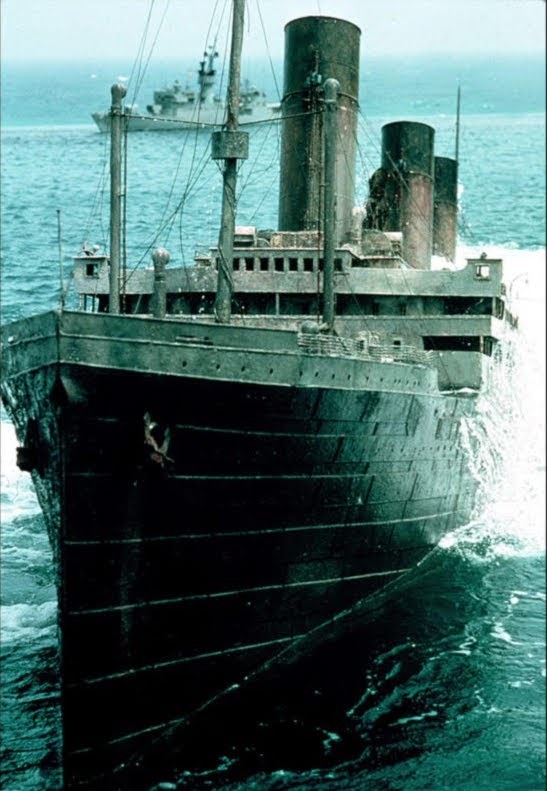 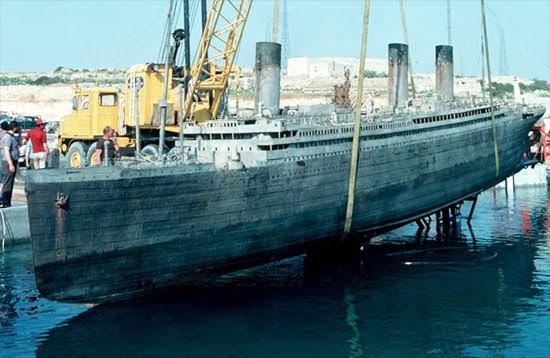 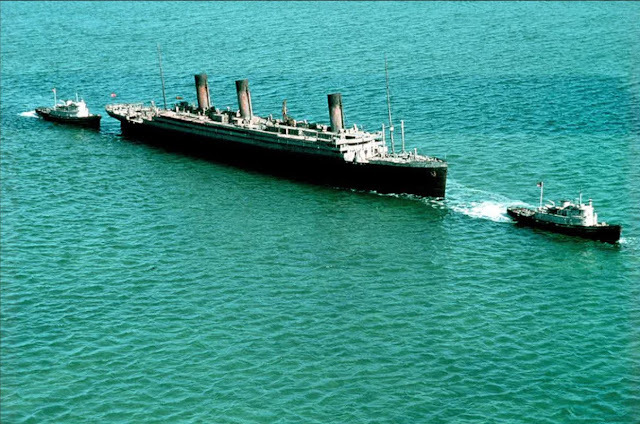 Is a shame that this could not have been salvage, restored to the condition as it was in the film then displayed in the TITANIC museum in Belfast as I am sure it would compliment the display.